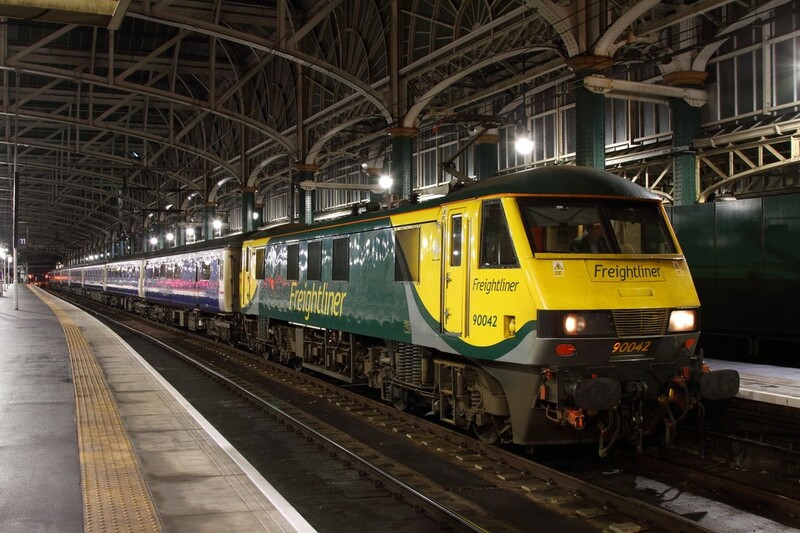 Freightliner Powerhaul liveried 90042 awaits departure with the 1M11 Glasgow Central to London Euston at Glasgow Central on the 15th January 2017. Surprisingly running on time and not the usual half an hour + early, Freightliner's Powerhaul coloured 90042 rounds the curve at Old Linslade hauling the 1M11 Glasgow Central to London Euston on the 4th July 2016. 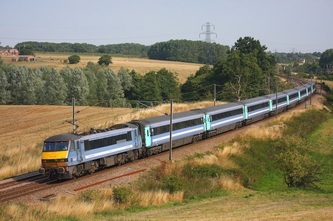 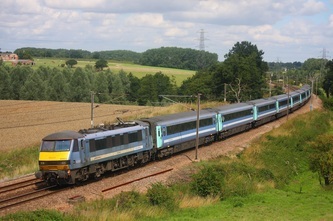 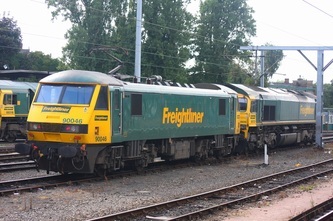 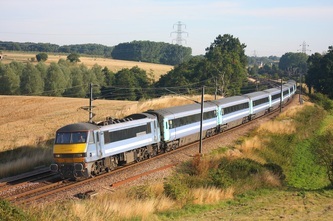 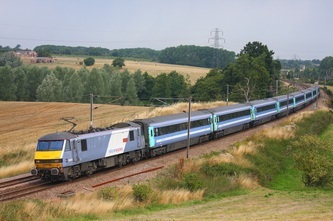 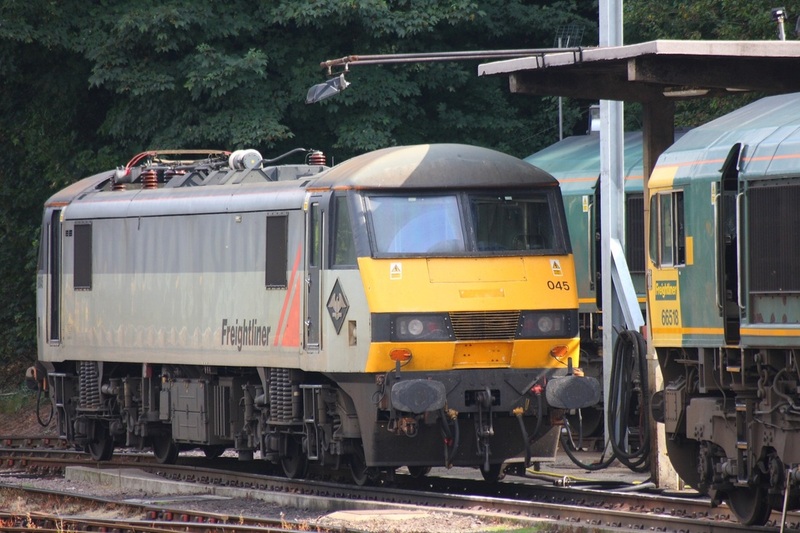 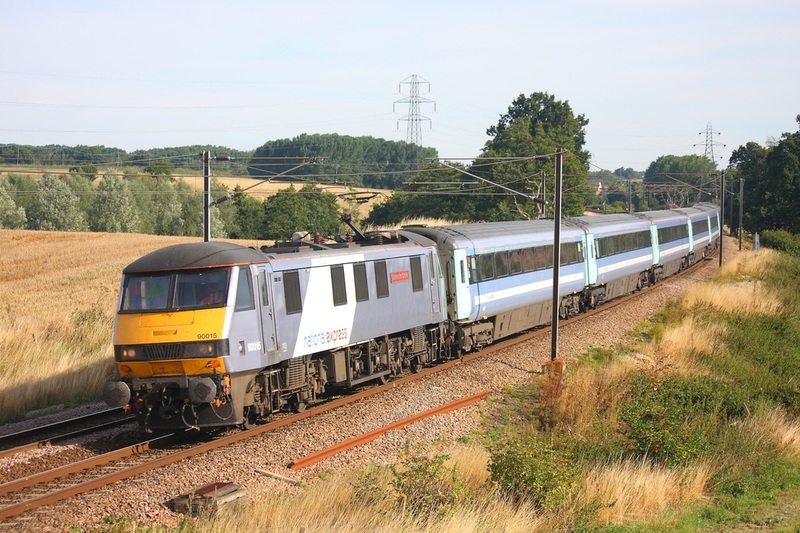 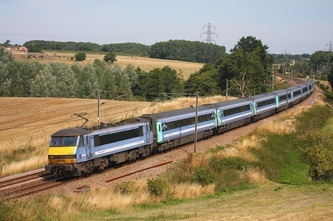 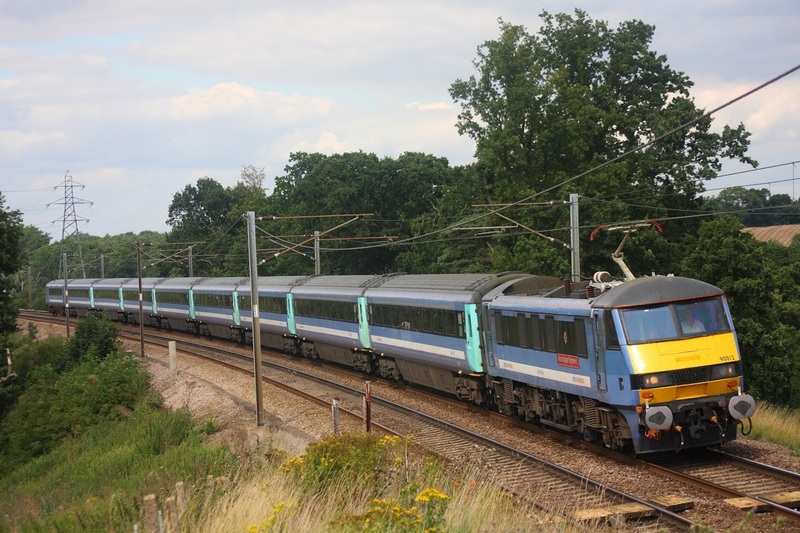 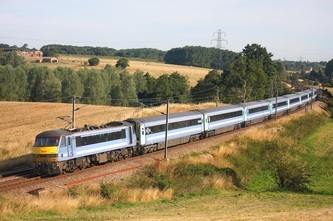 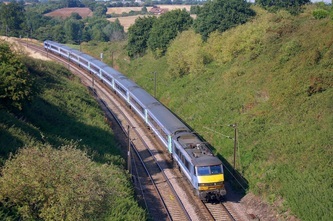 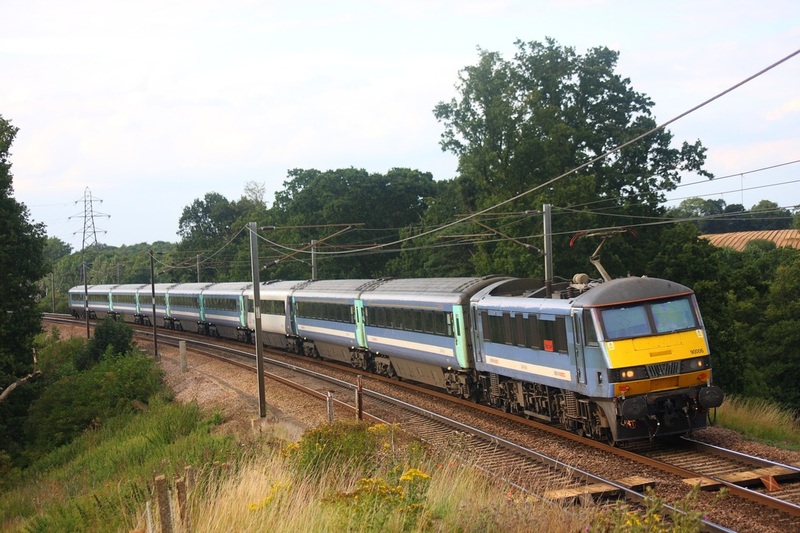 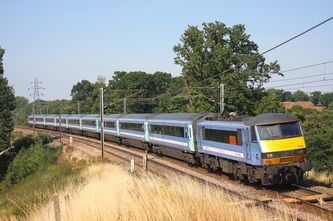 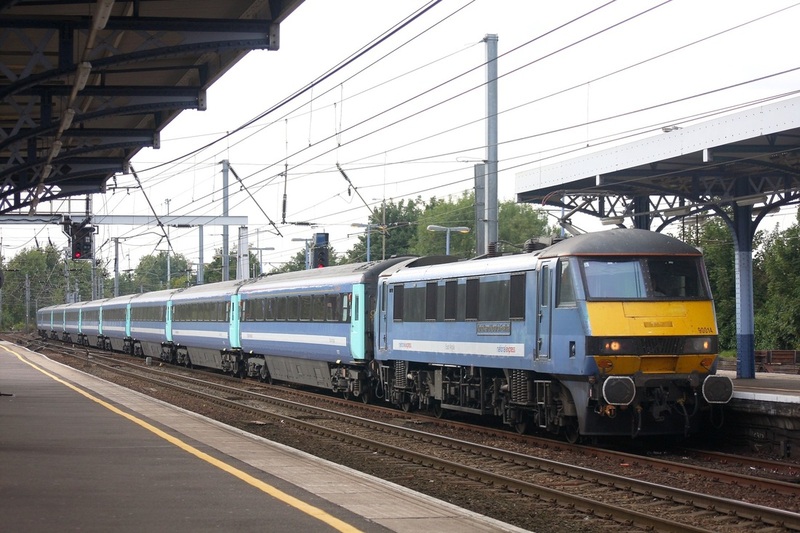 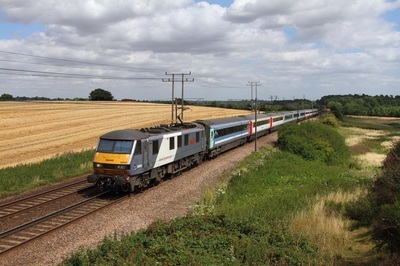 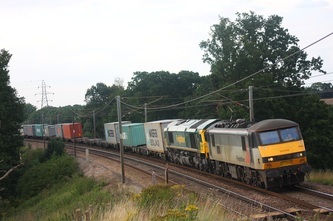 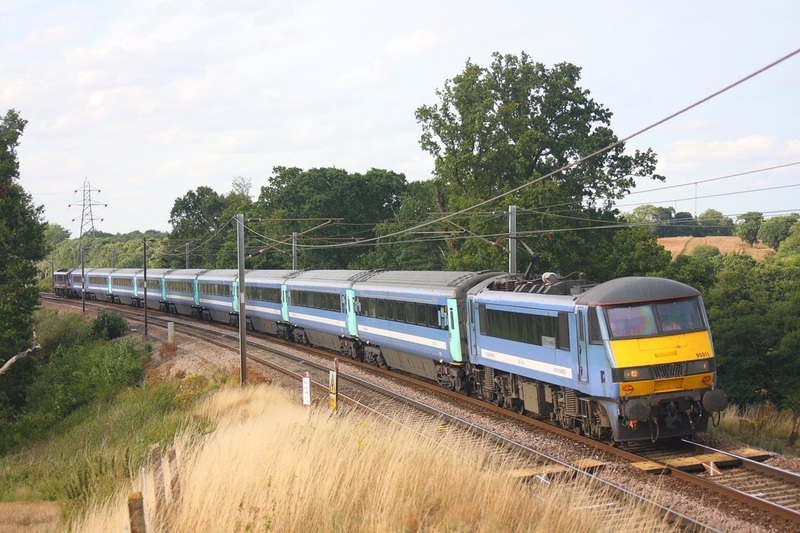 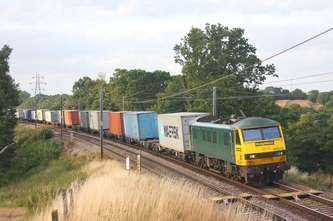 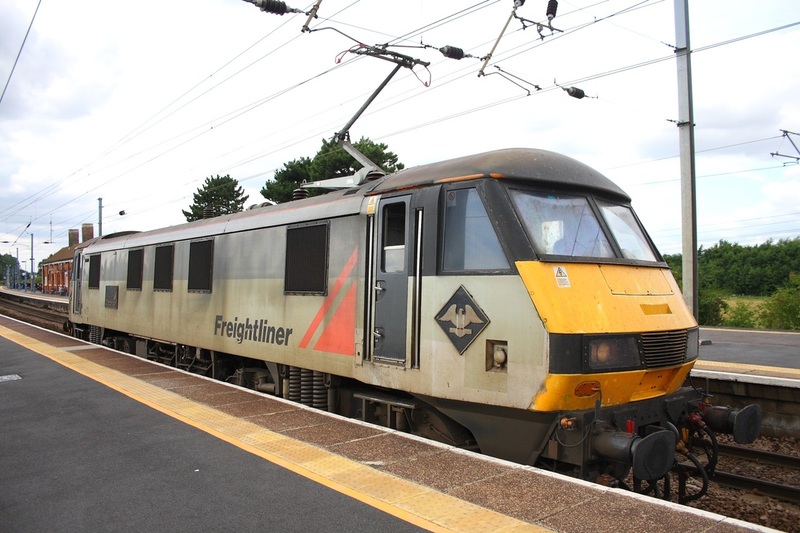 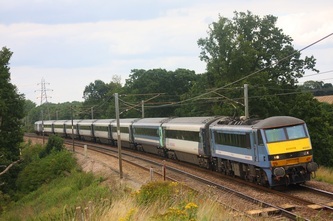 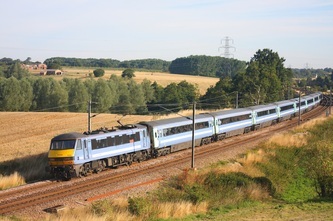 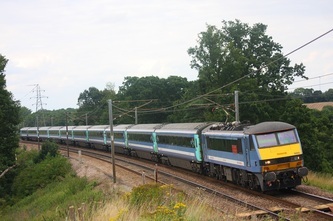 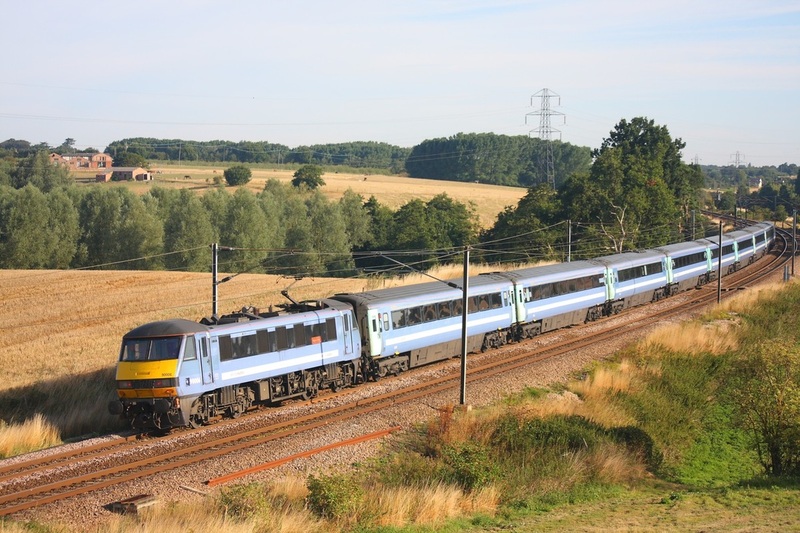 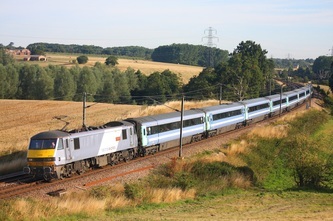 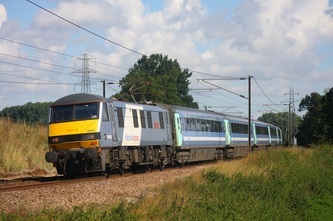 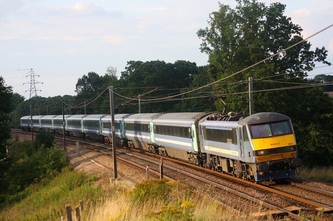 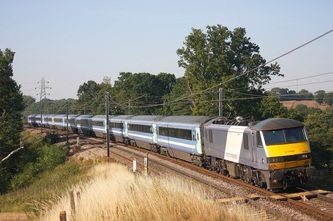 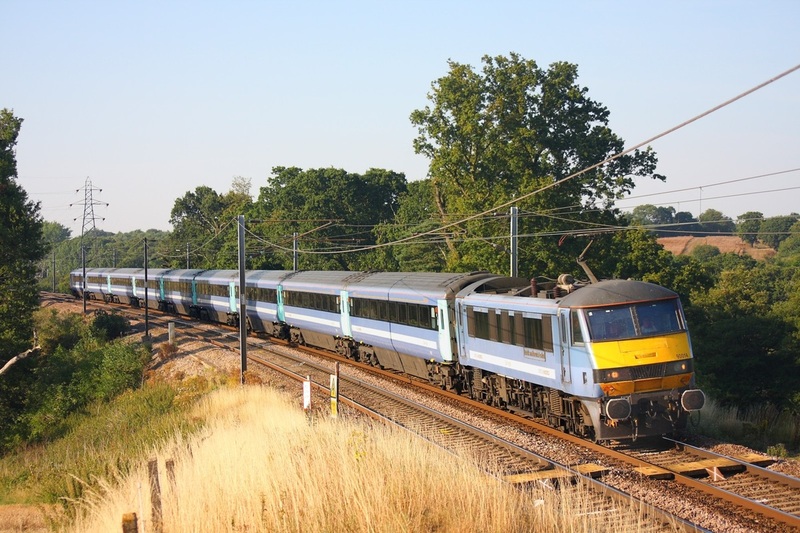 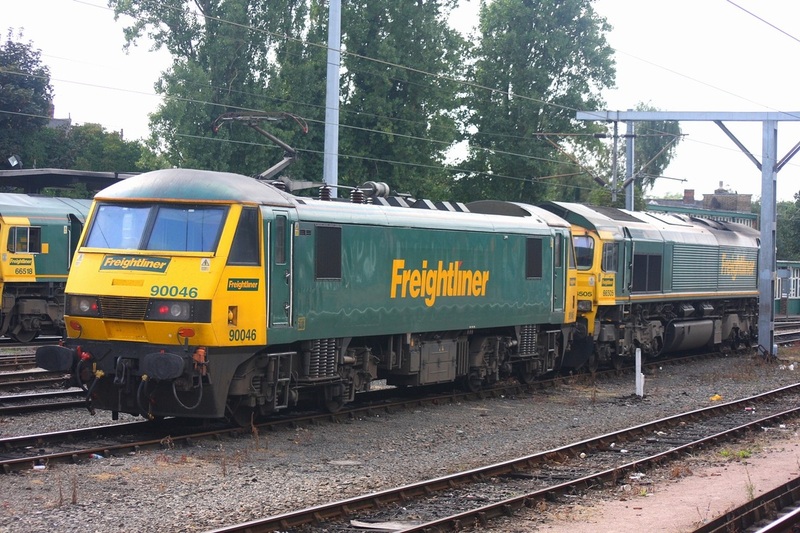 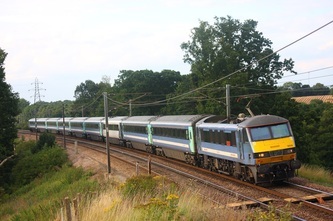 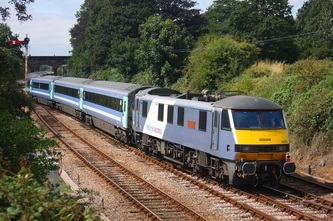 Freightliner original grey liveried 90047 hauls the 1M16 Inverness to London Euston sleeper at Old Linslade on the 4th July 2016. 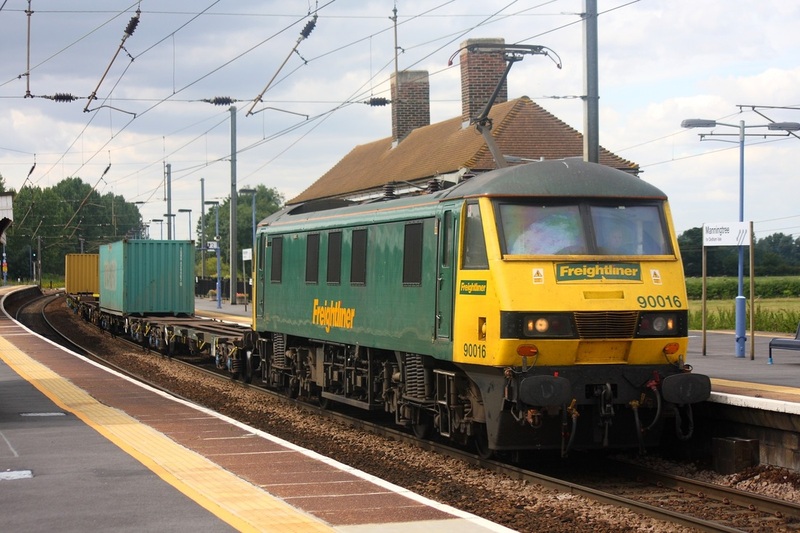 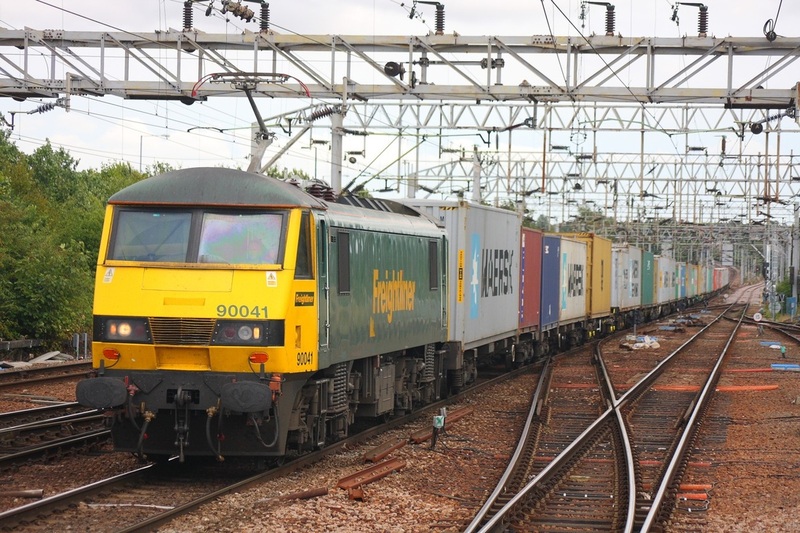 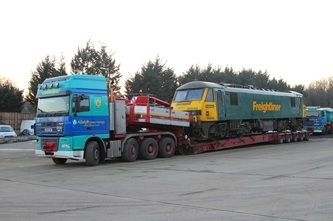 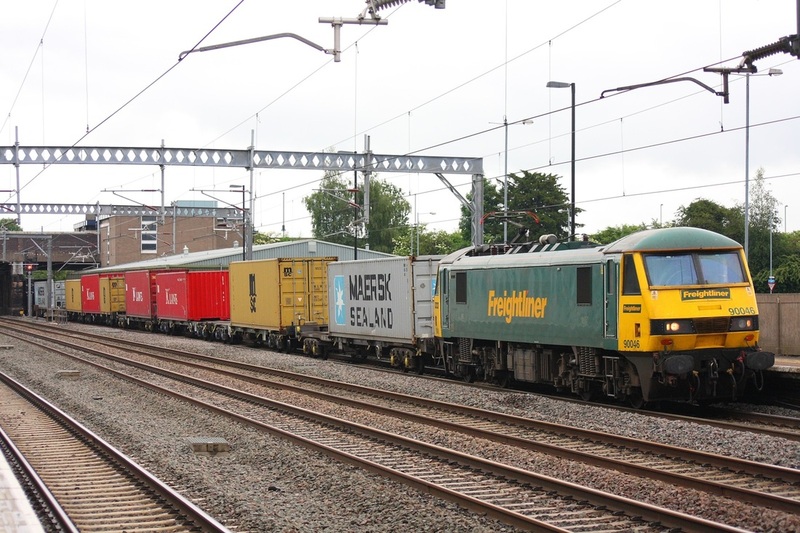 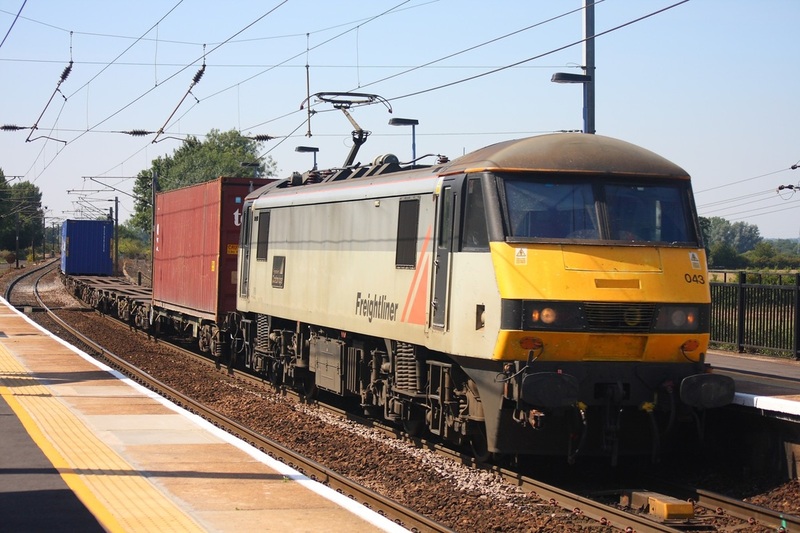 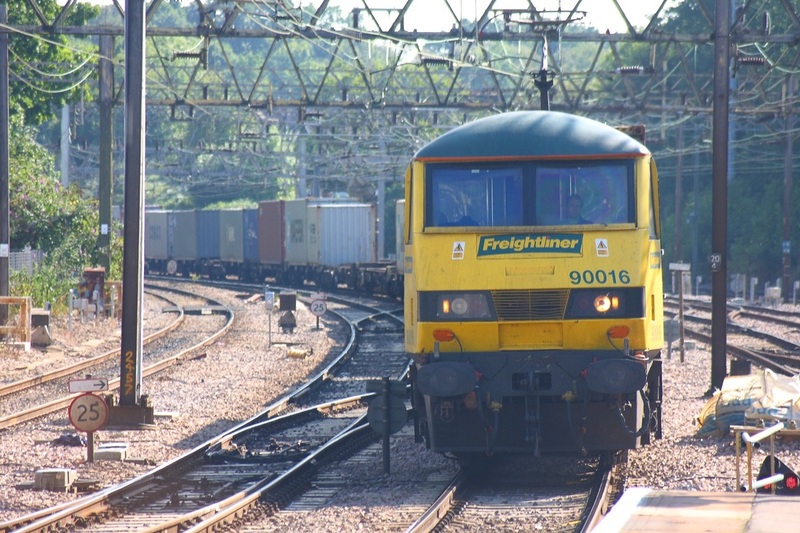 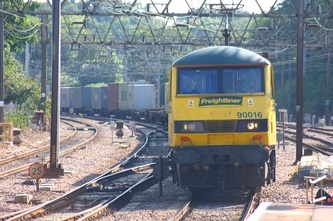 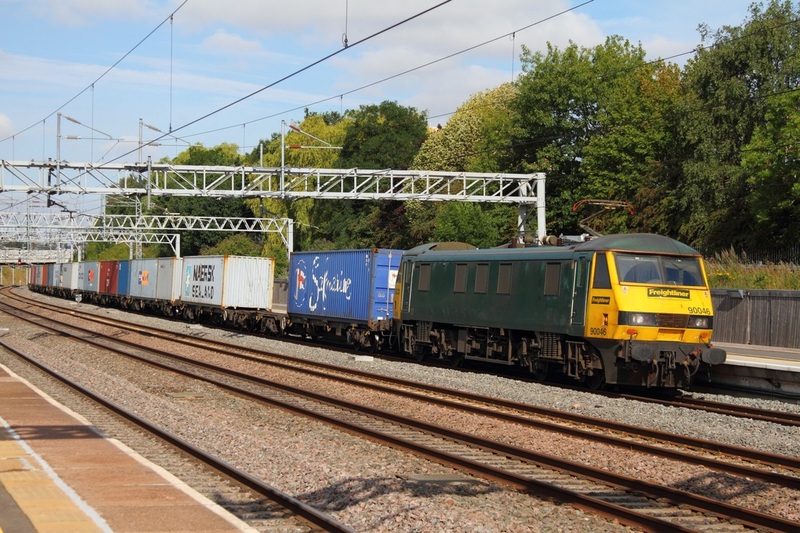 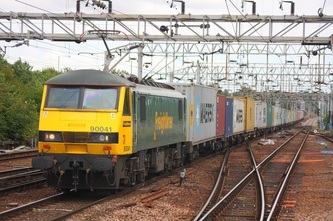 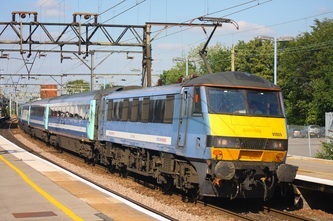 Freightliner Powerhaul liveried 90043 powers the 1M16 Inverness to London Euston at Old Linslade on the 17th May 2016. 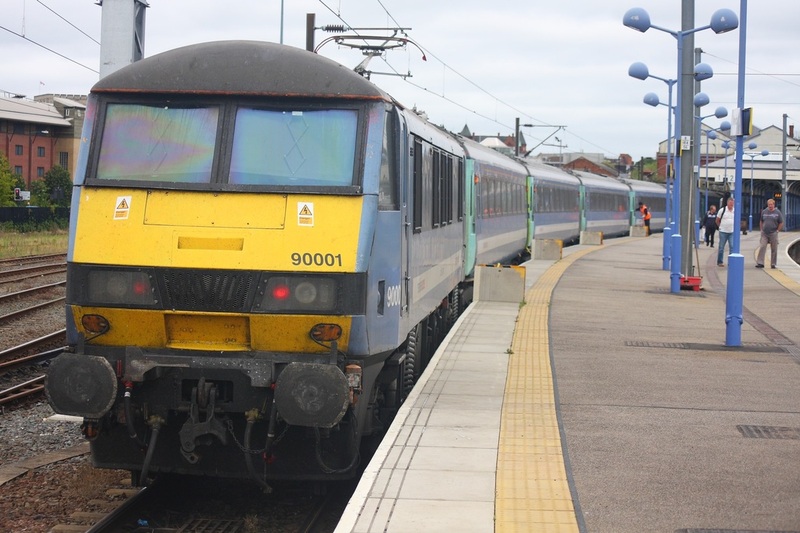 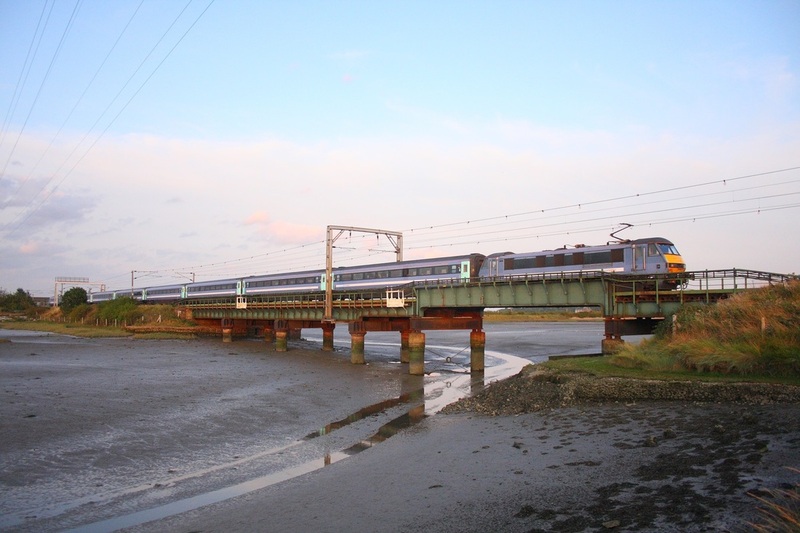 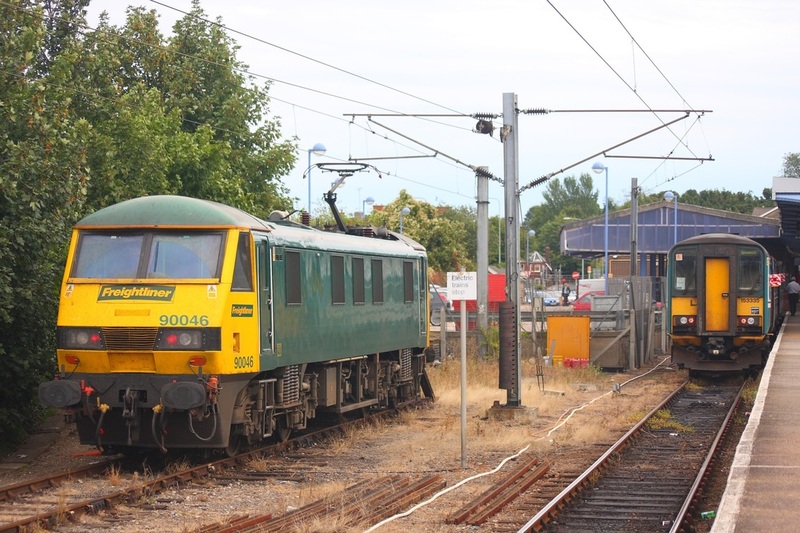 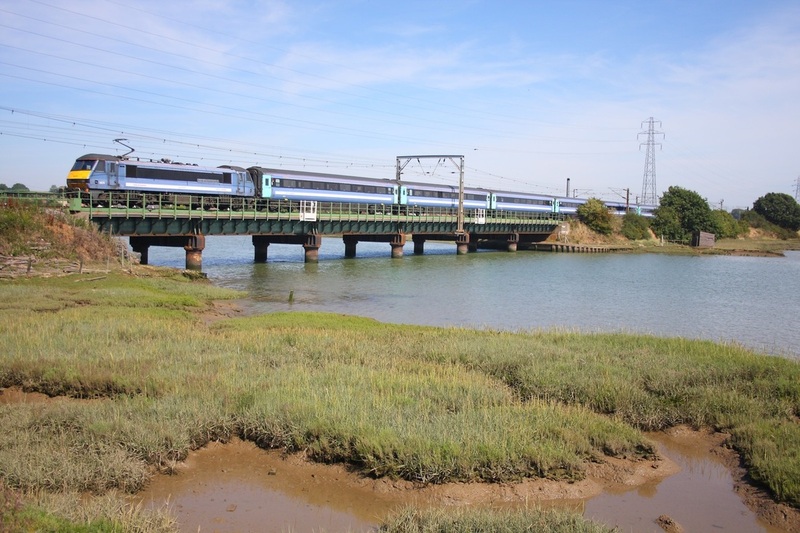 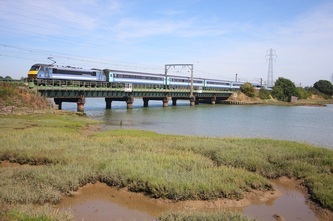 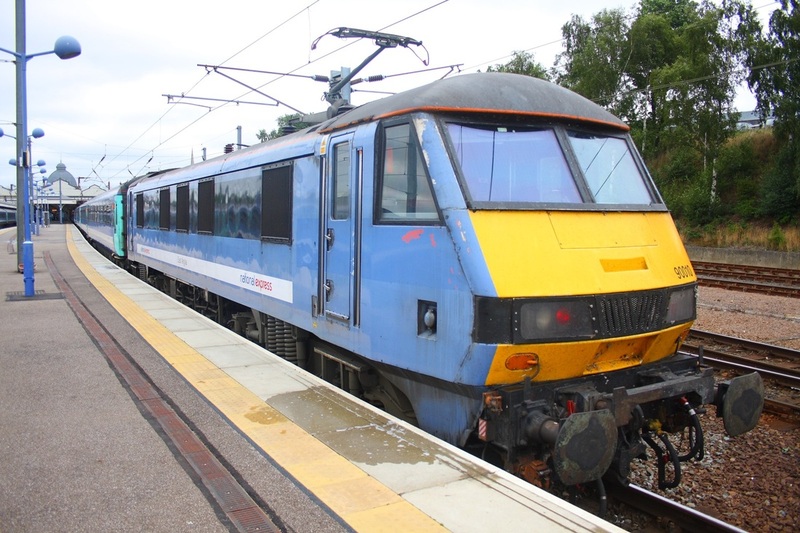 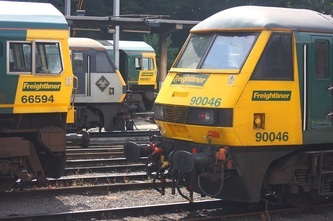 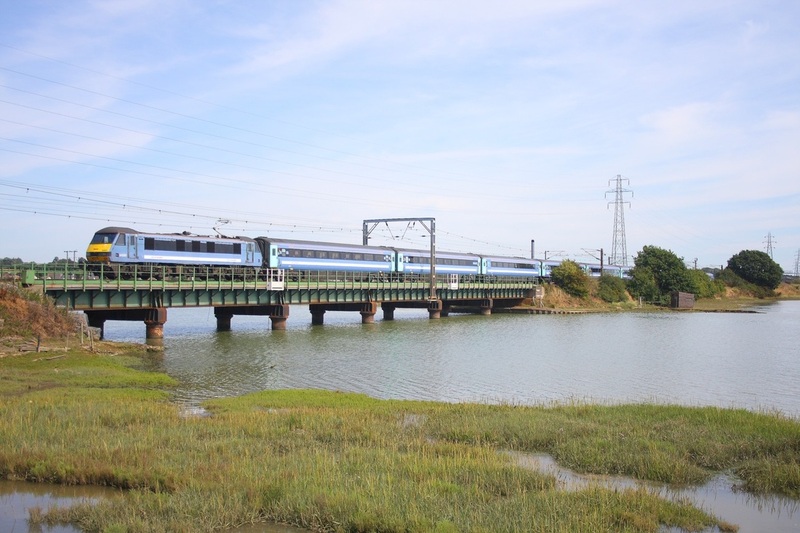 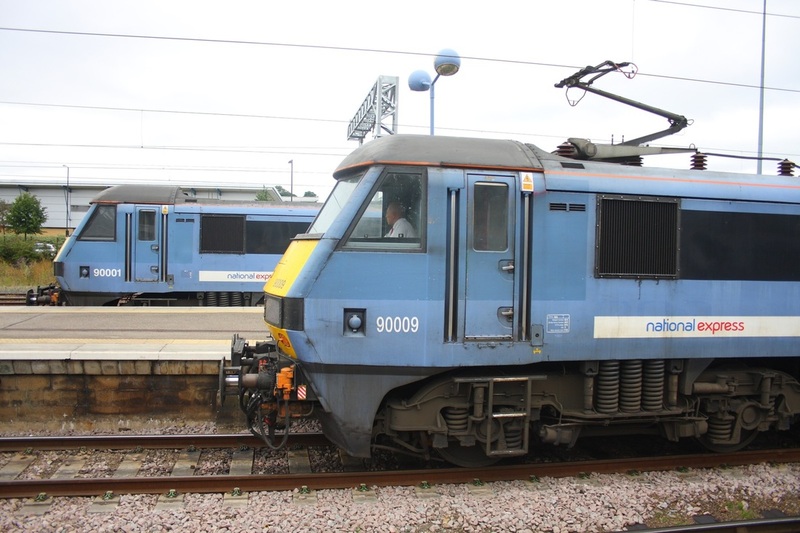 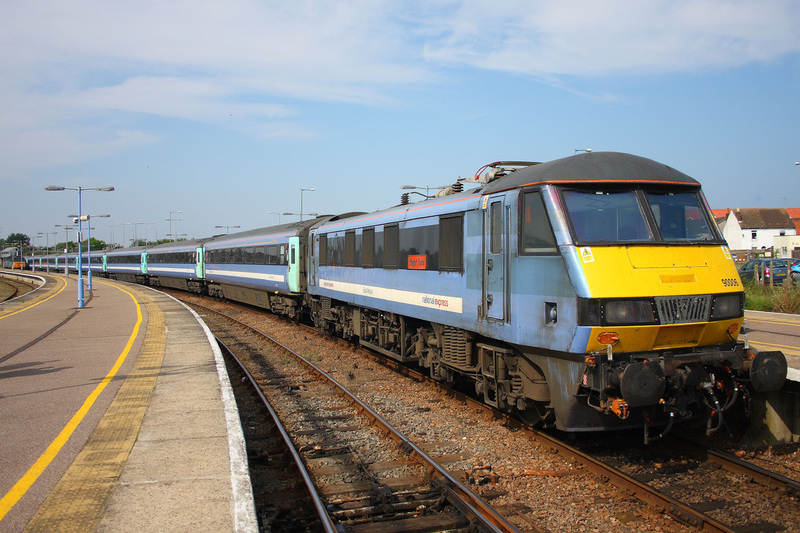 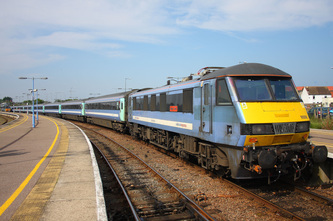 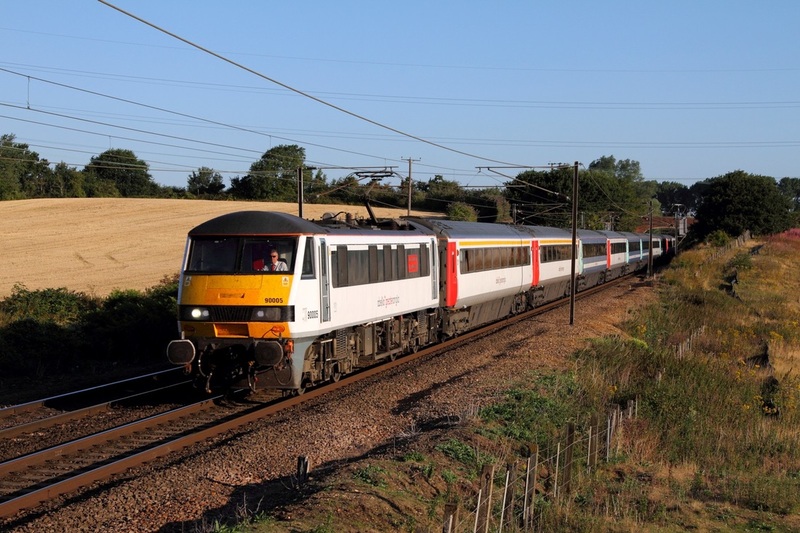 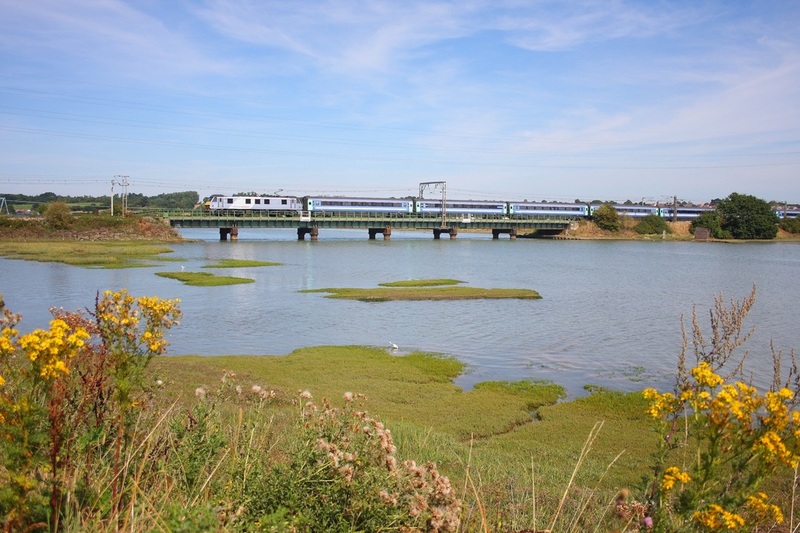 90034 on the 5P00 0510 Norwich to Ipswich at Baylham on the 4th August 2015. 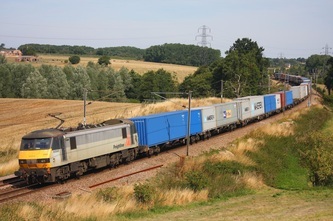 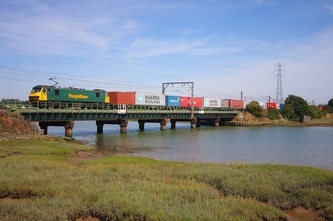 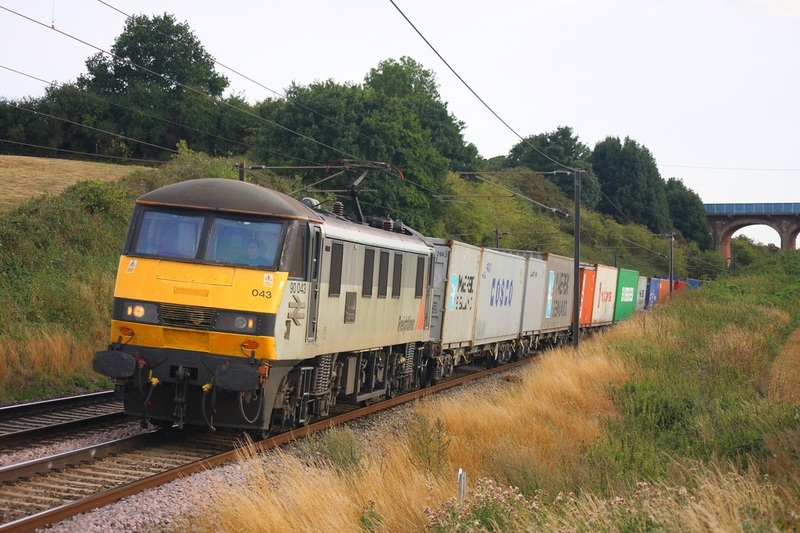 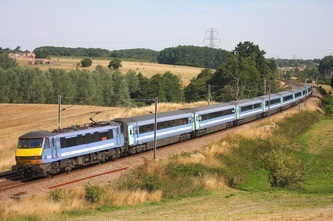 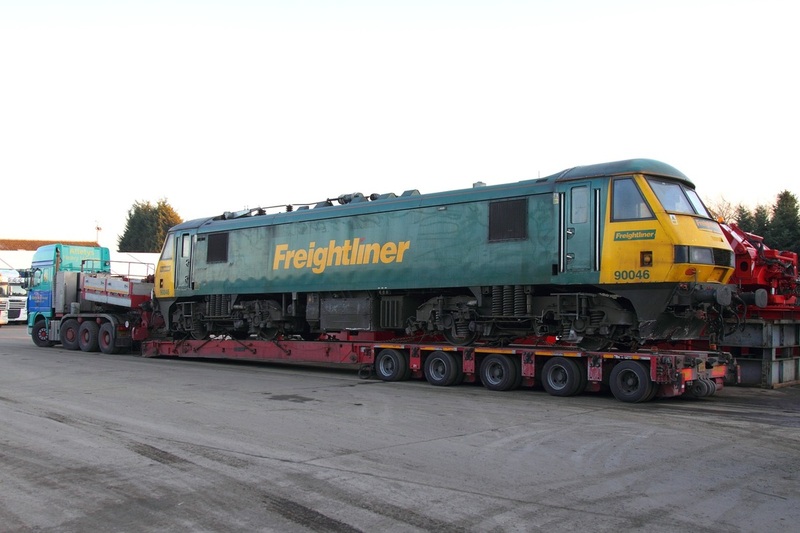 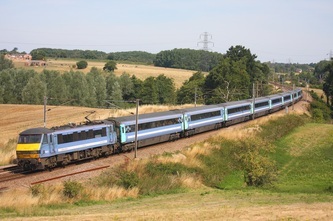 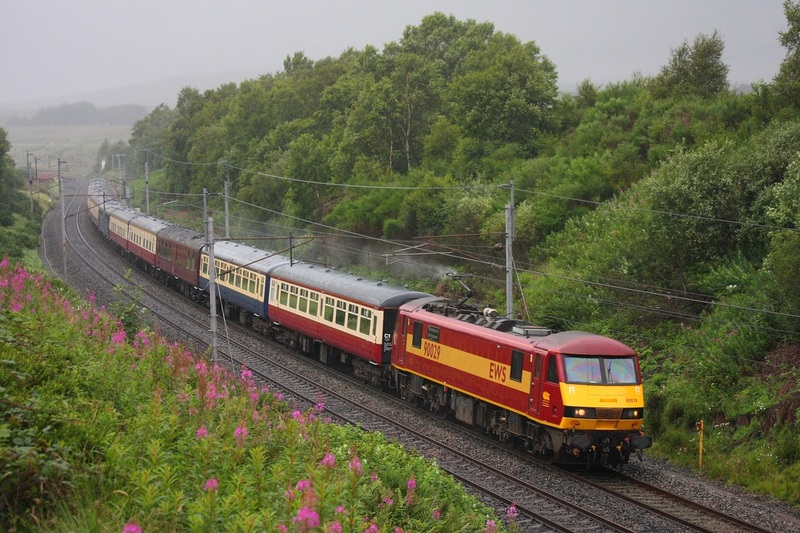 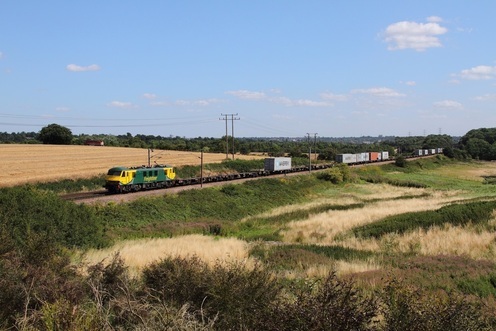 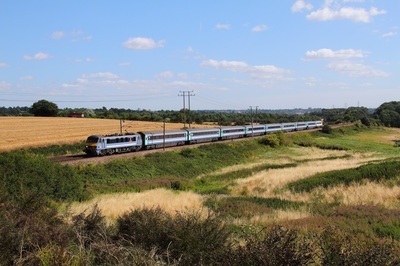 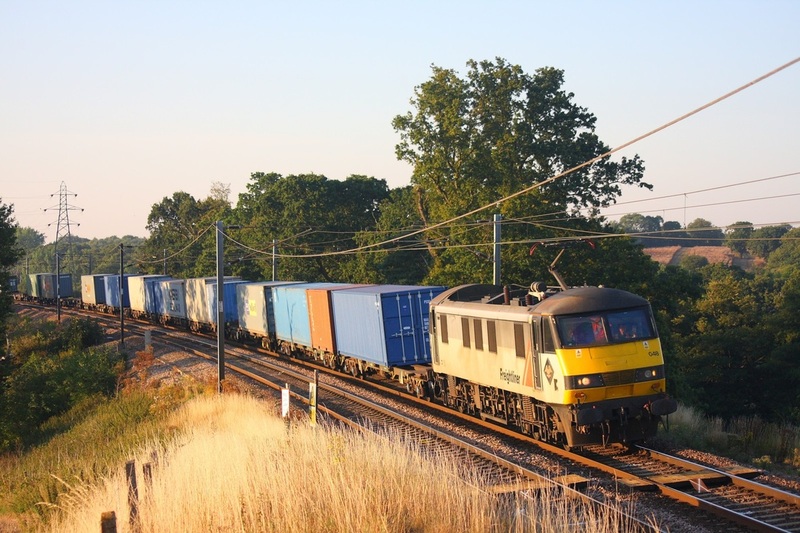 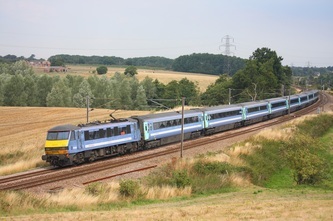 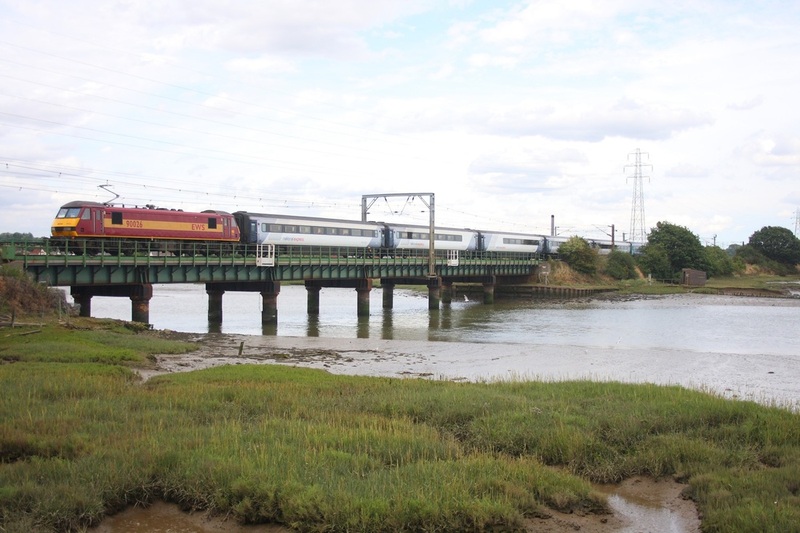 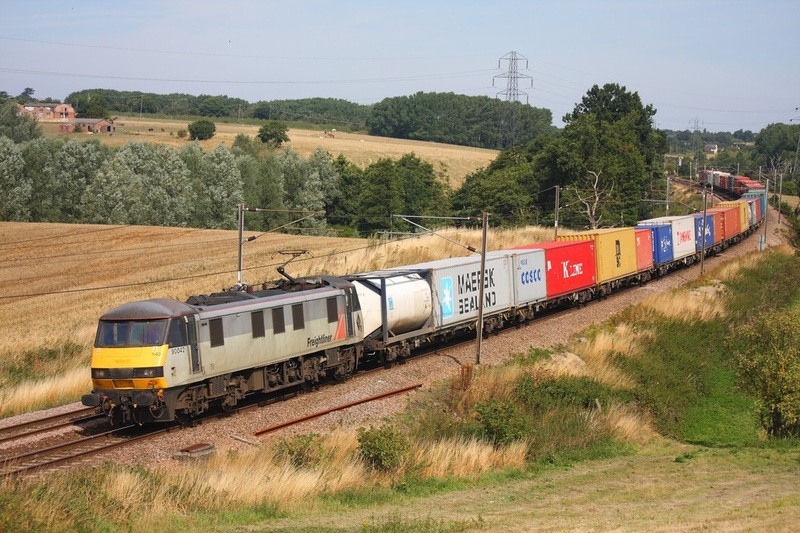 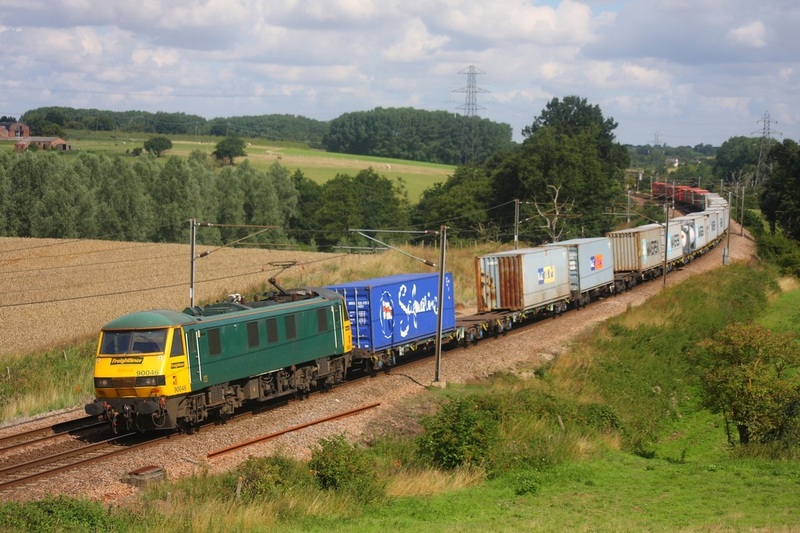 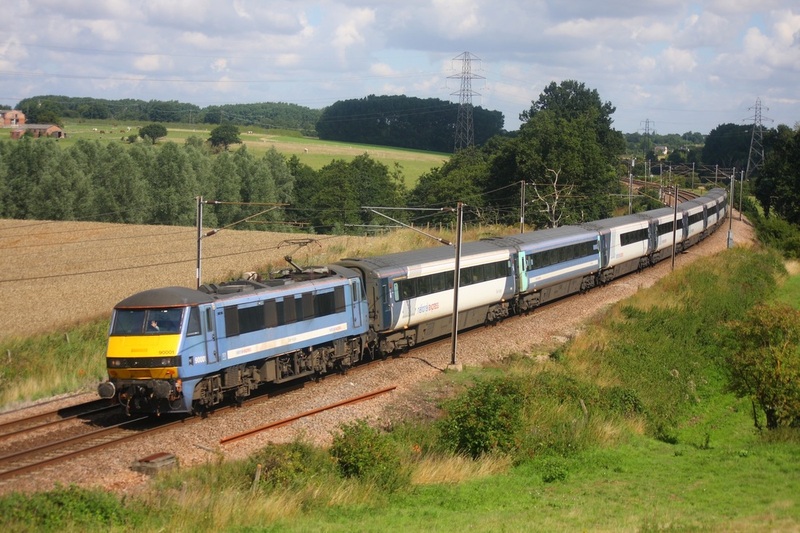 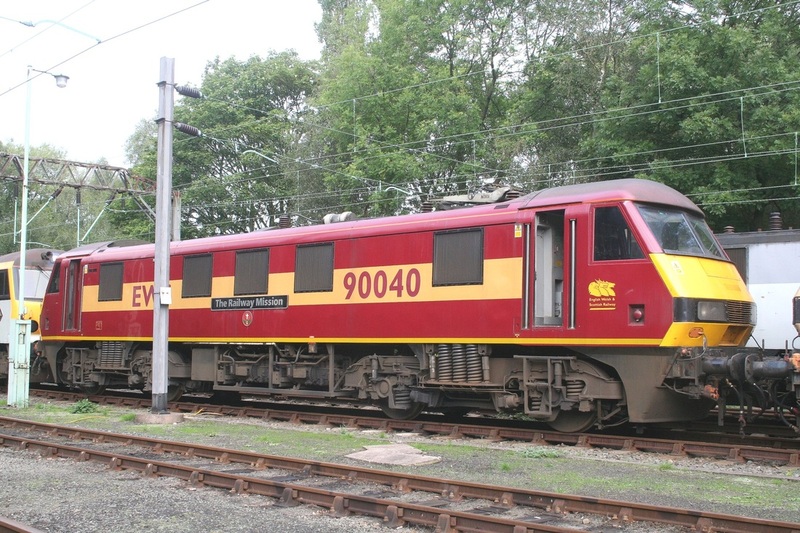 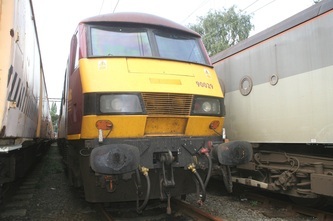 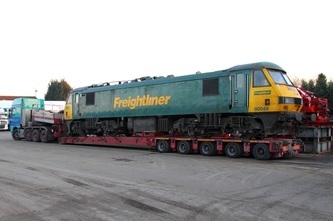 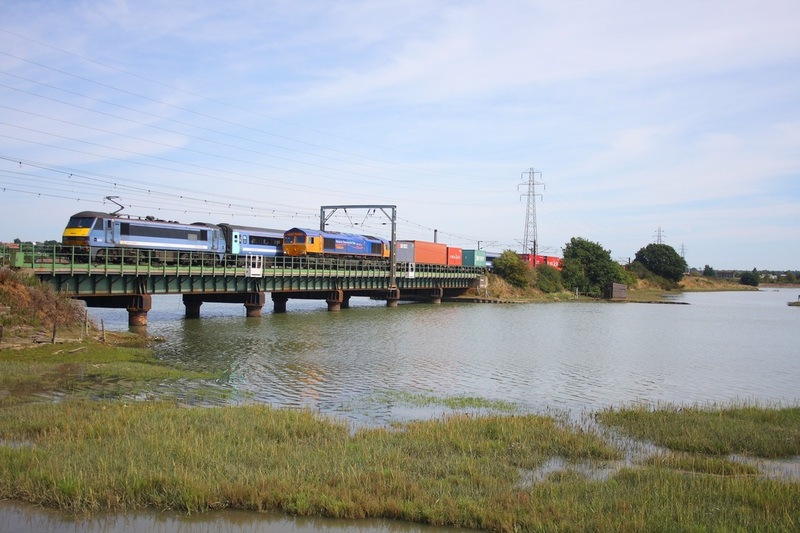 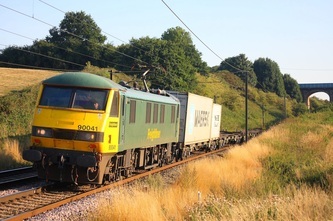 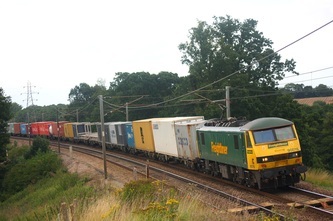 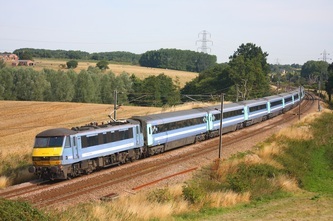 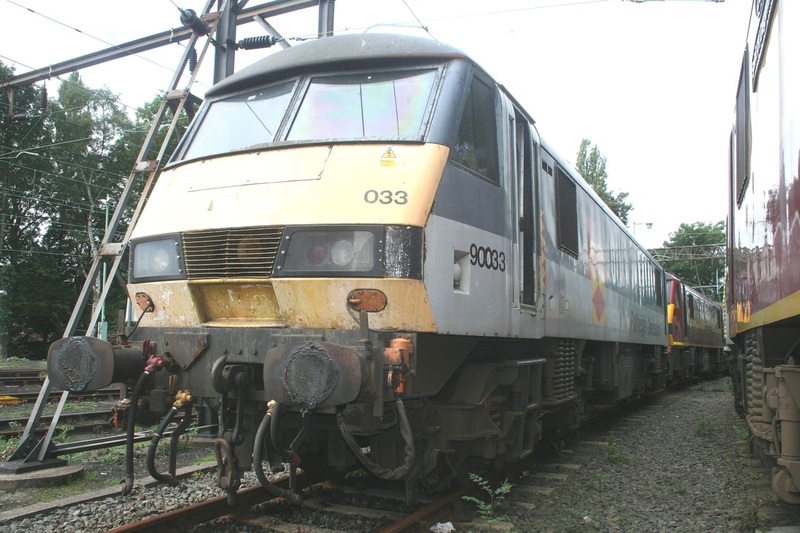 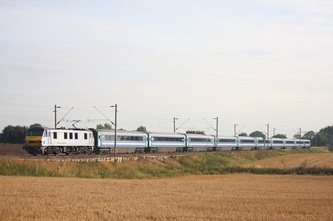 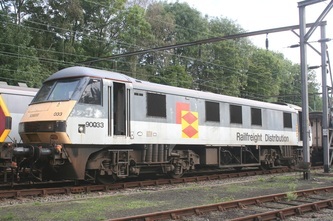 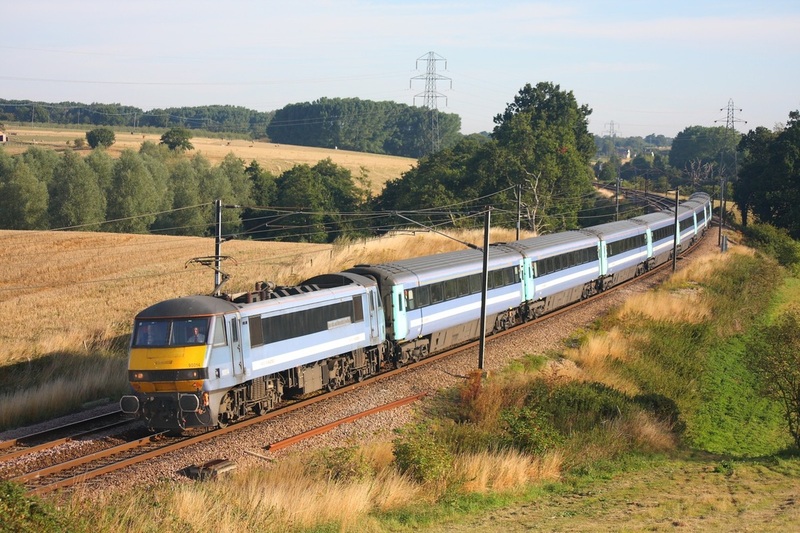 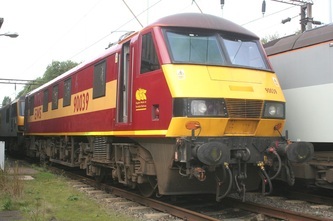 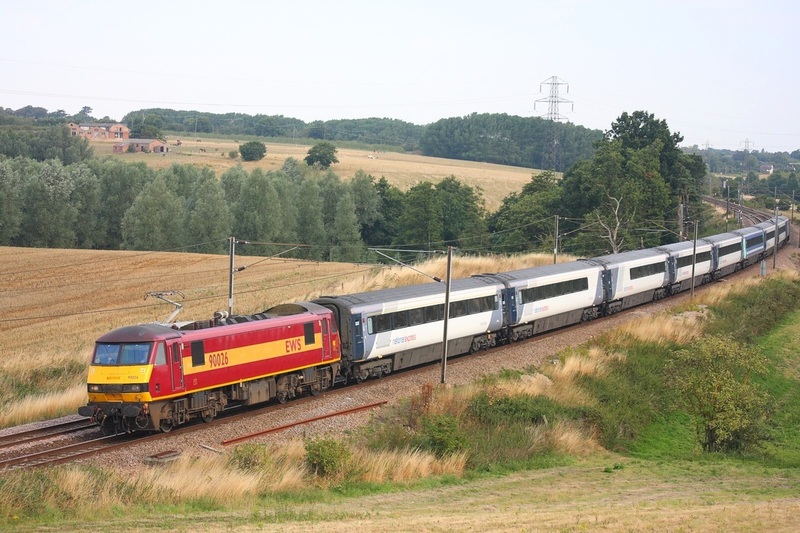 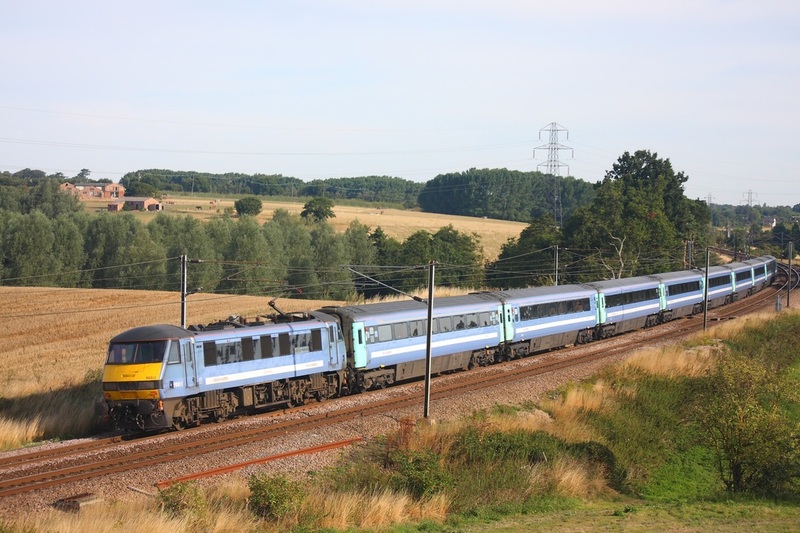 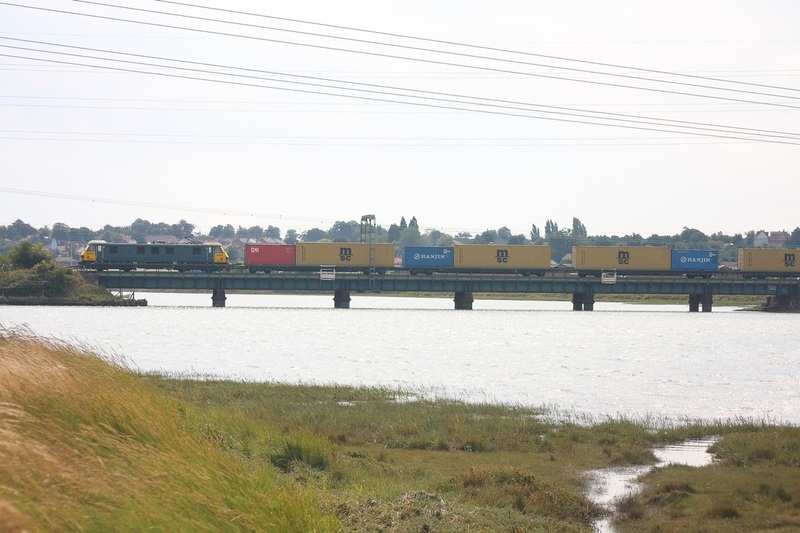 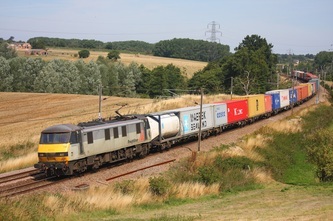 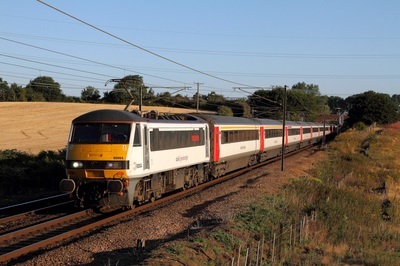 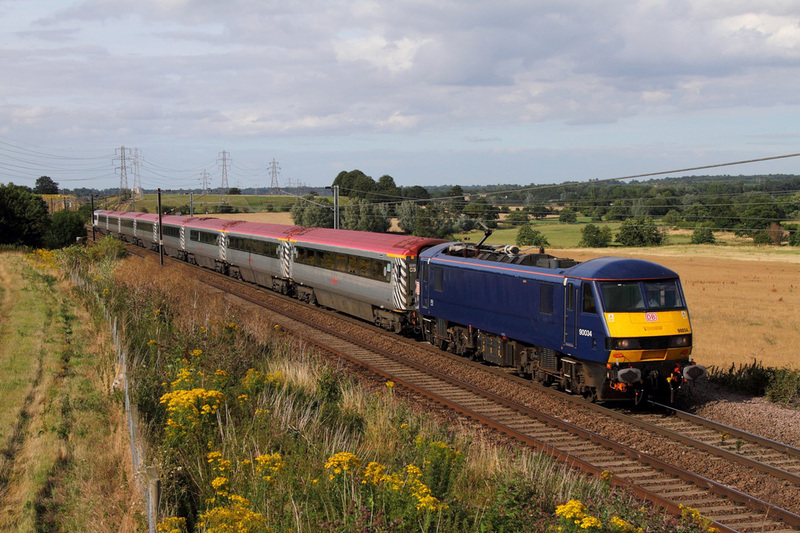 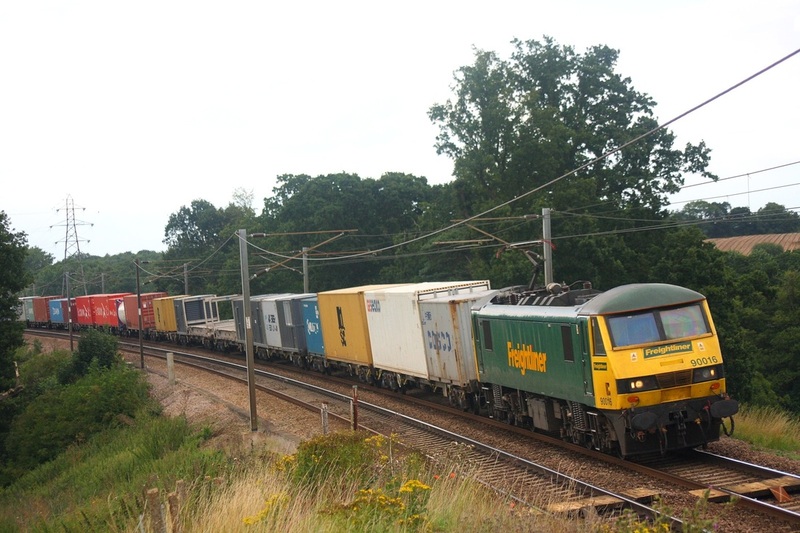 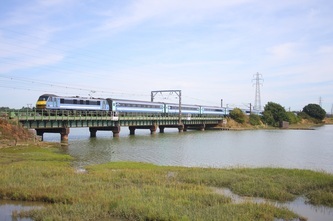 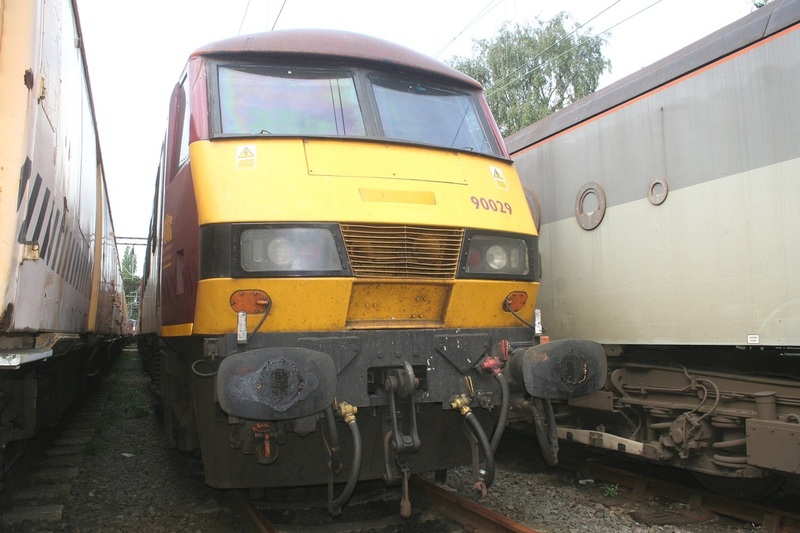 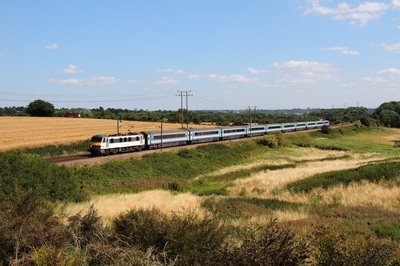 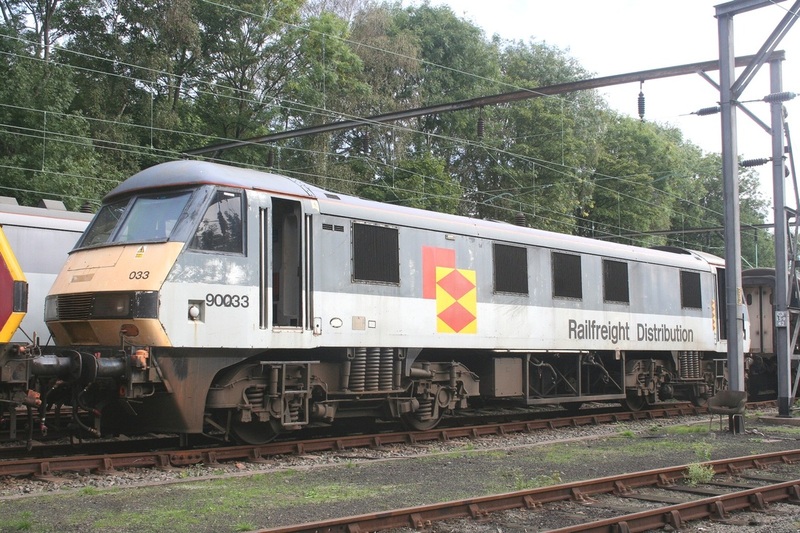 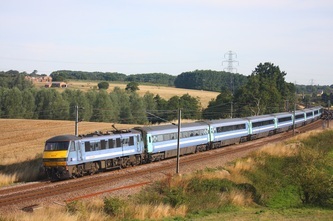 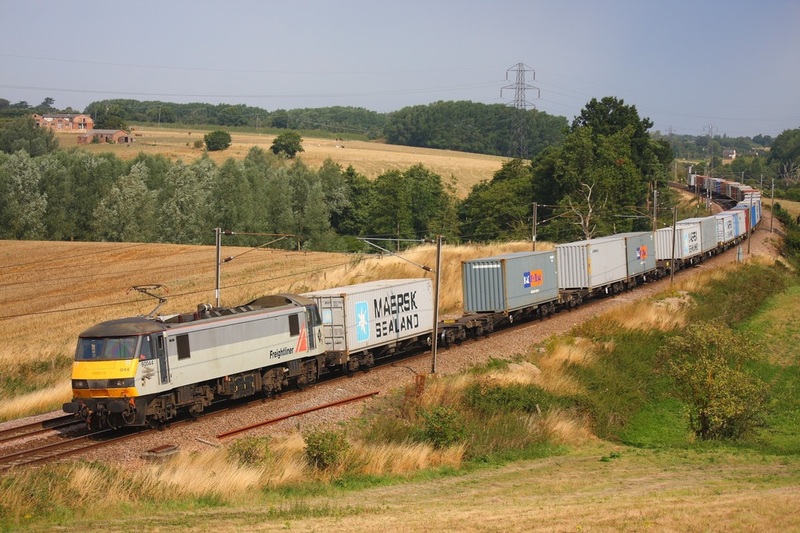 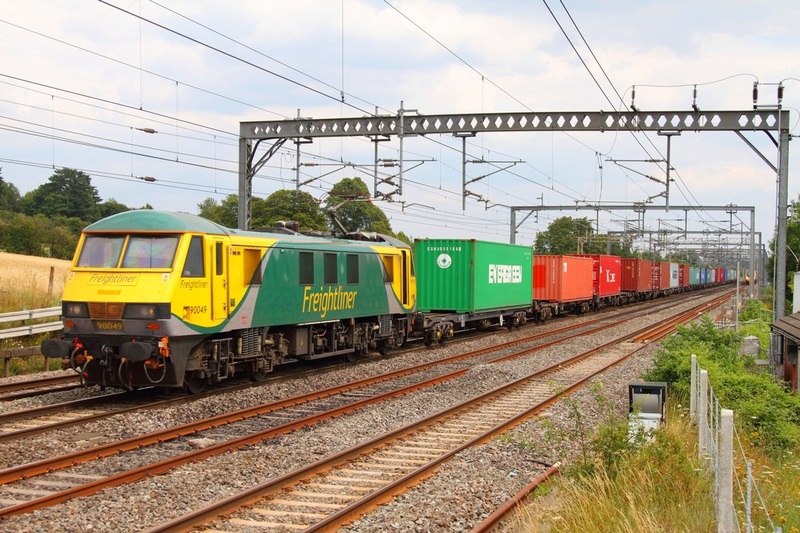 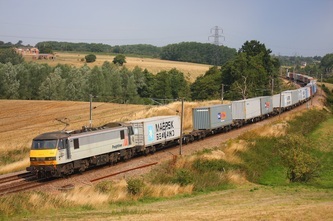 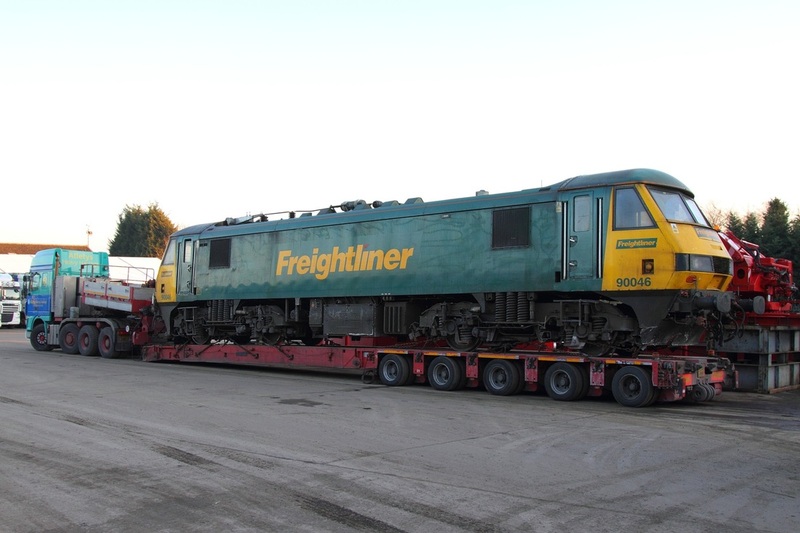 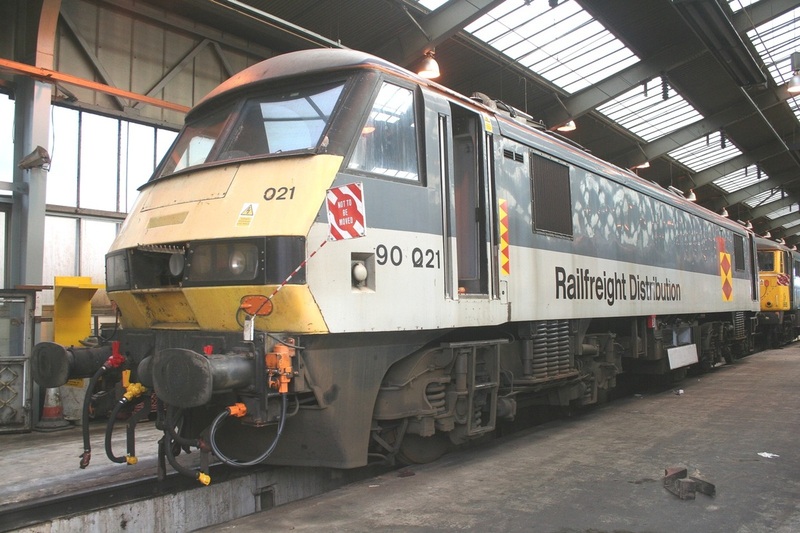 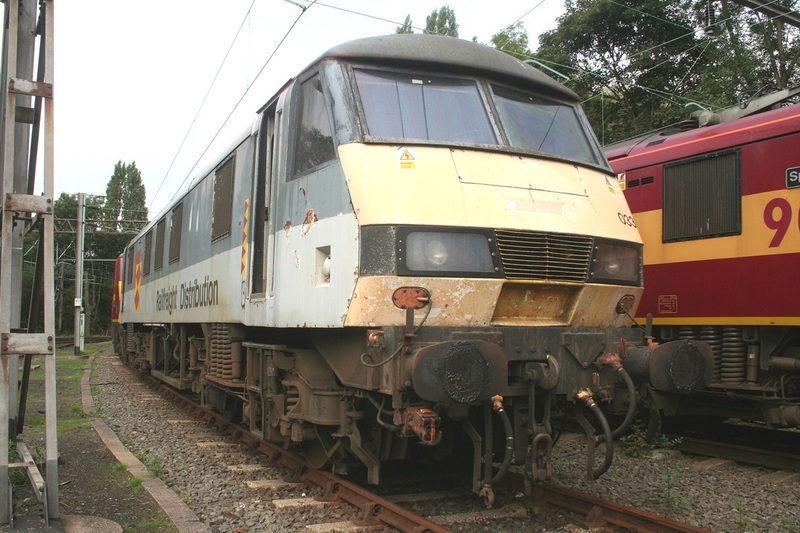 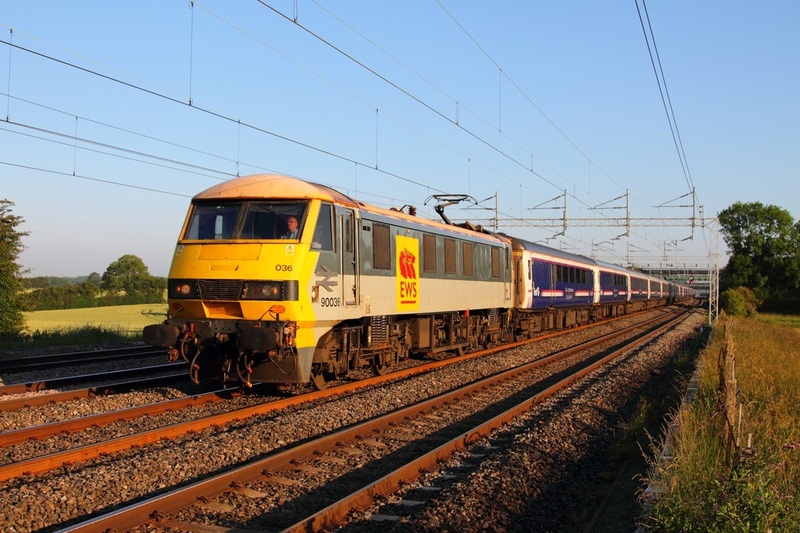 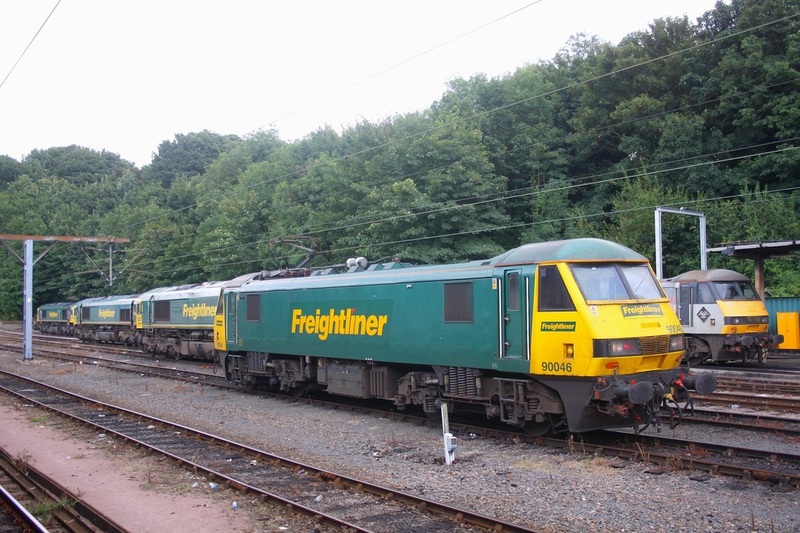 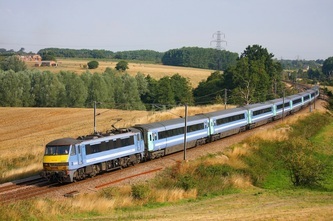 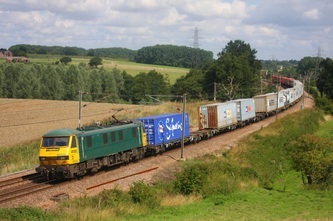 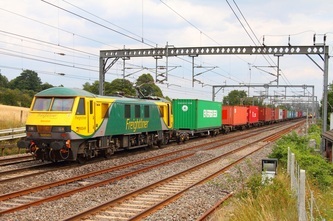 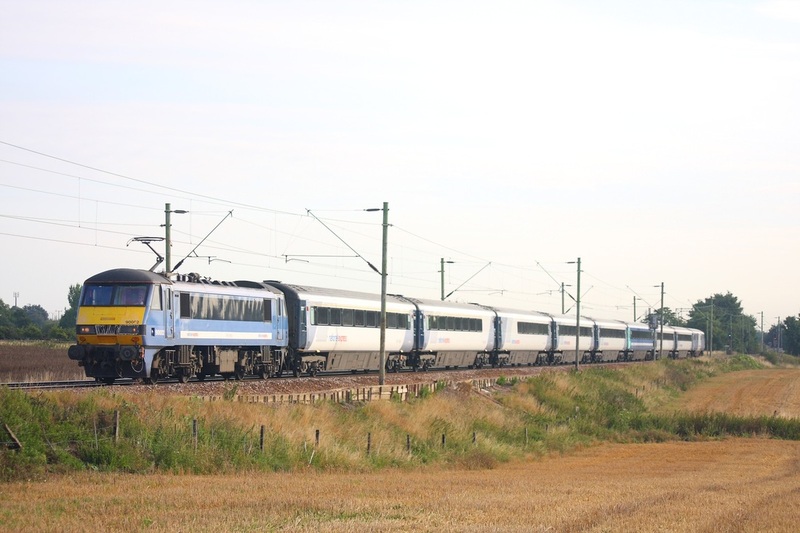 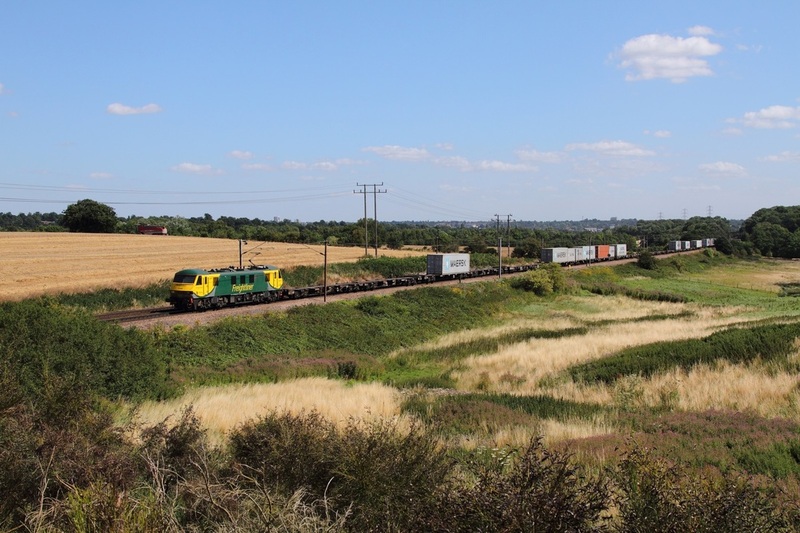 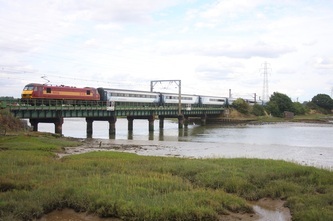 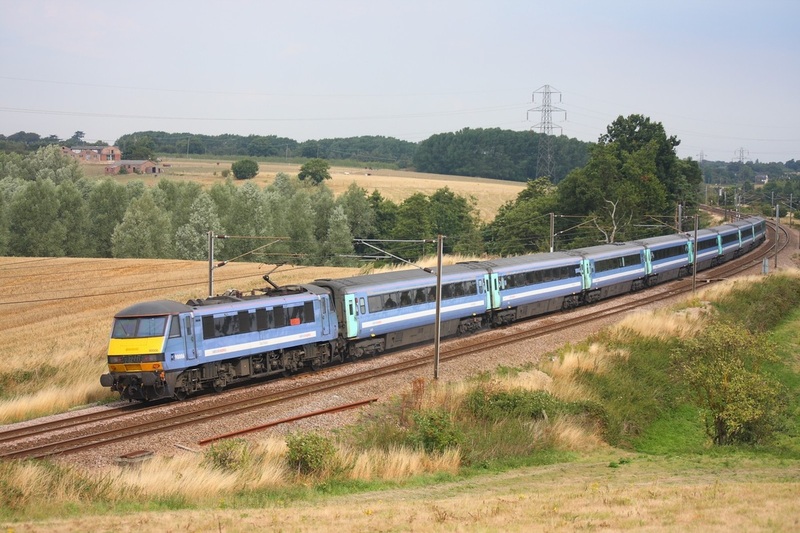 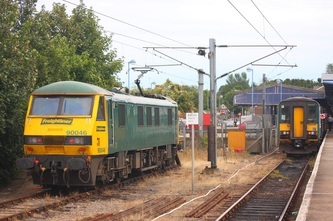 90042 on the 4M81 Felixstowe North to Crewe Basford Hall at Belstead Bank on the 4th August 2015. 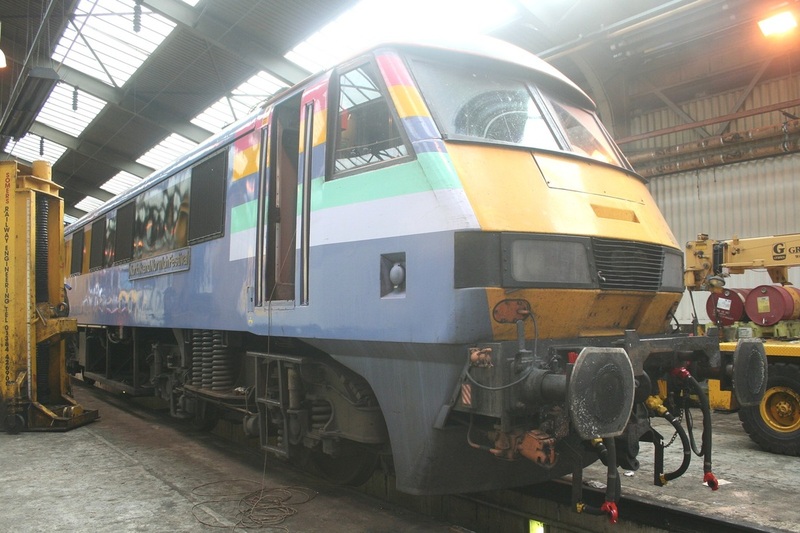 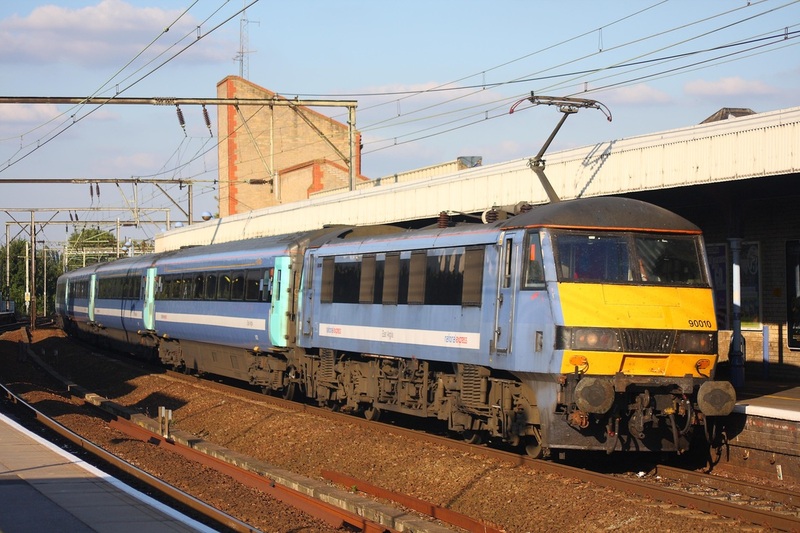 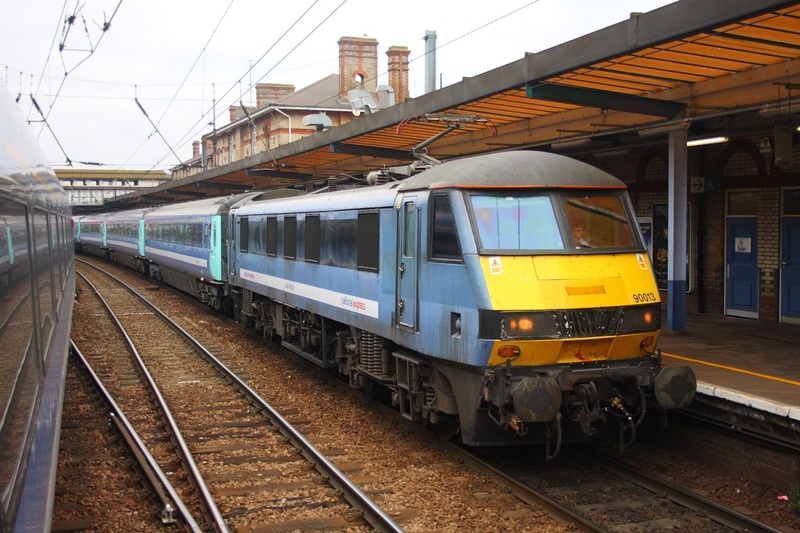 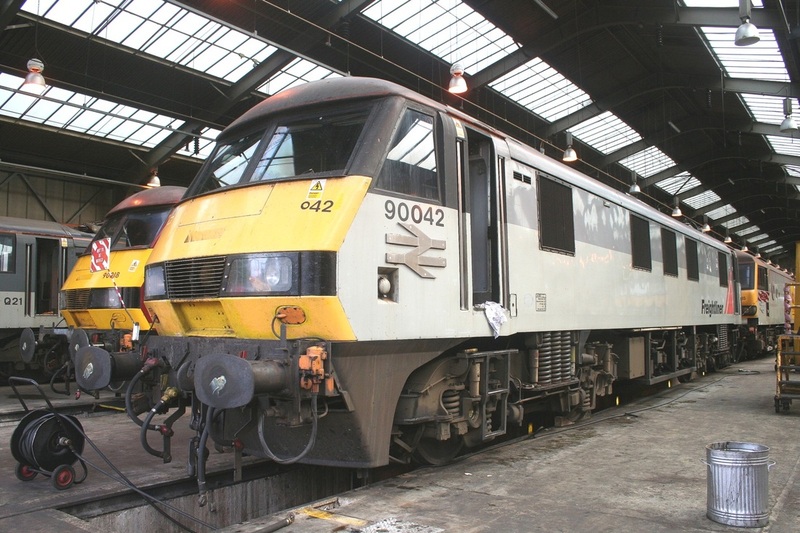 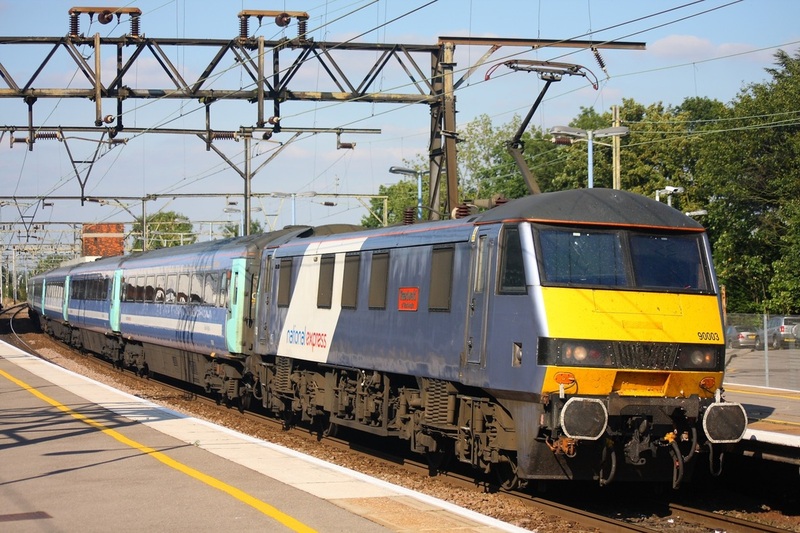 90034 on the 1P57 1730 Norwich to London Liverpool Street at Dunston on the 3rd August 2015. 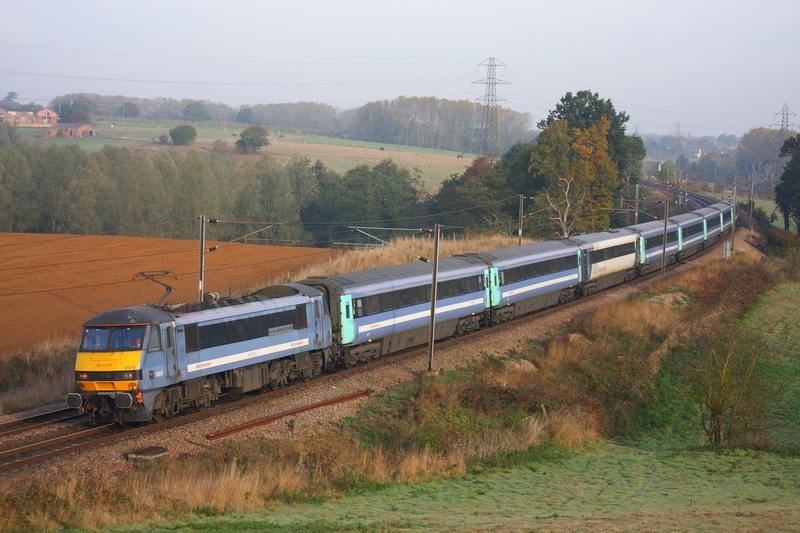 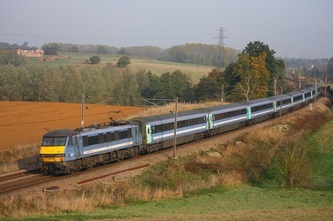 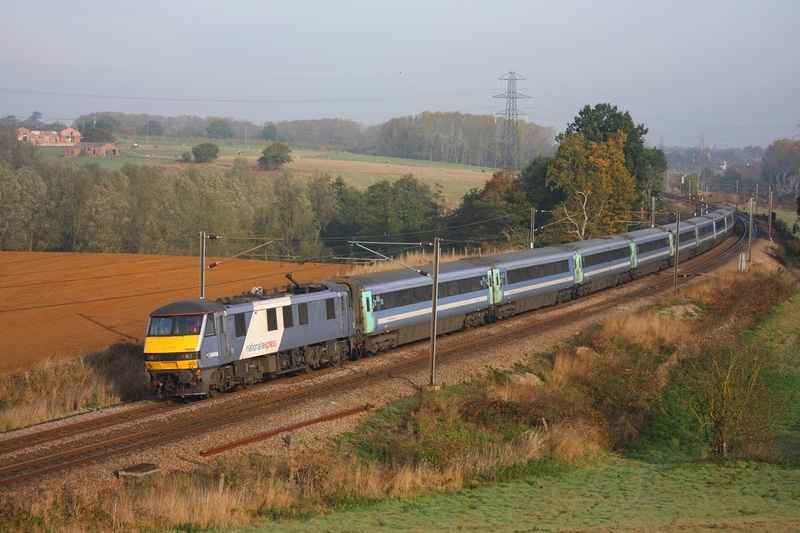 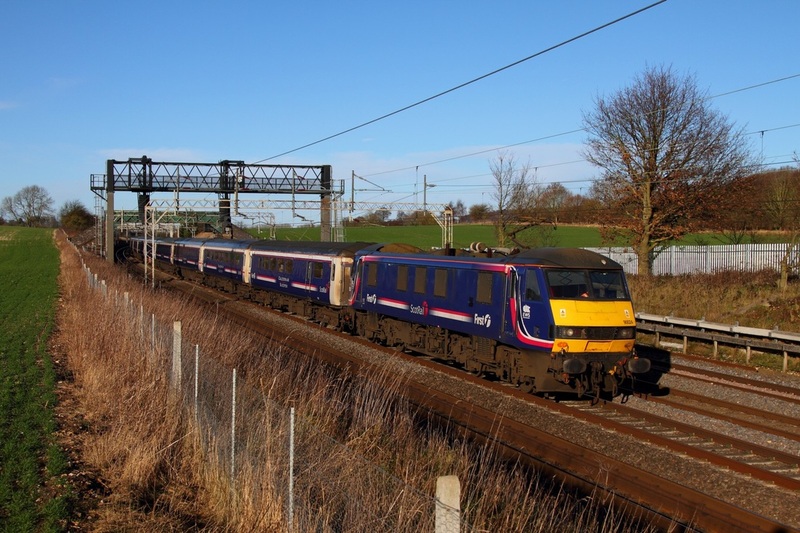 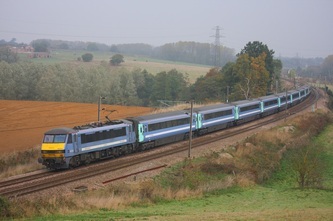 First Scotrail liveried 90024 leads the 1M16 Inverness to London Euston at Cow Roast running 266 minutes late just south of Tring on the 28th December 2013. 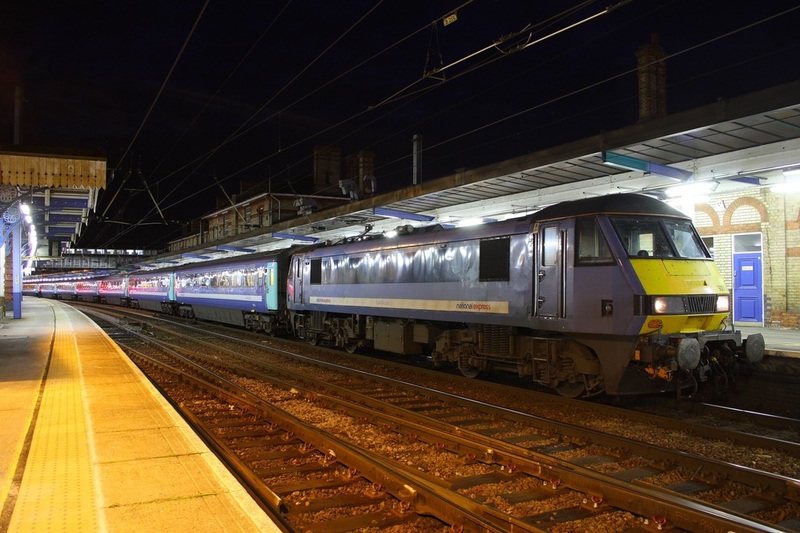 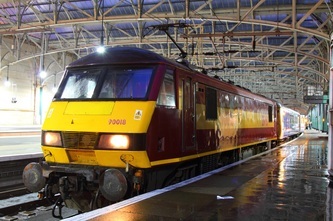 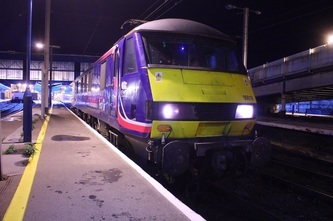 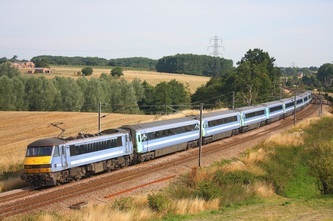 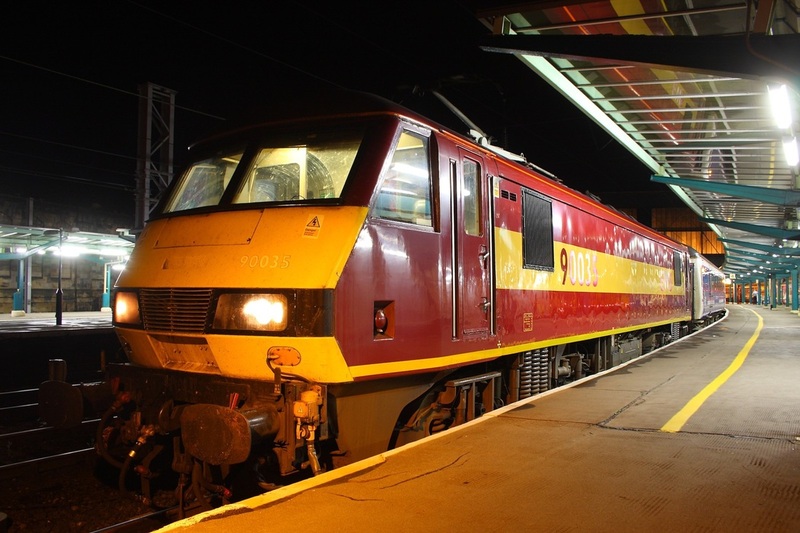 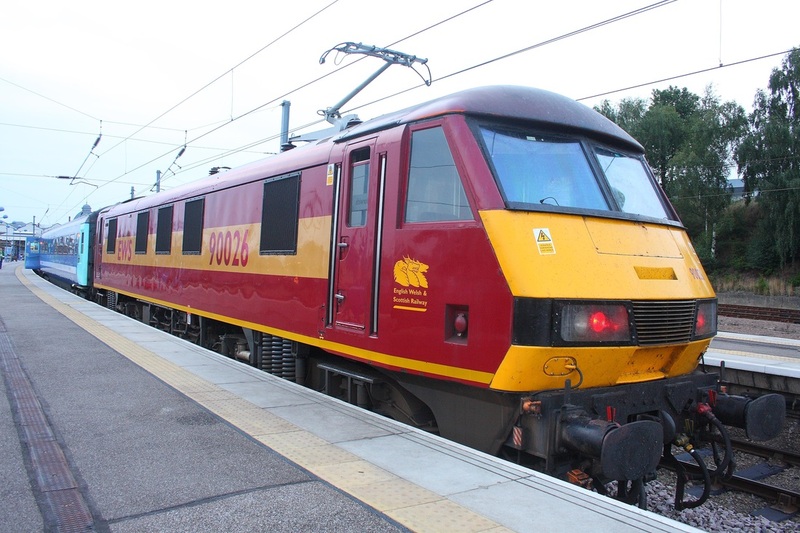 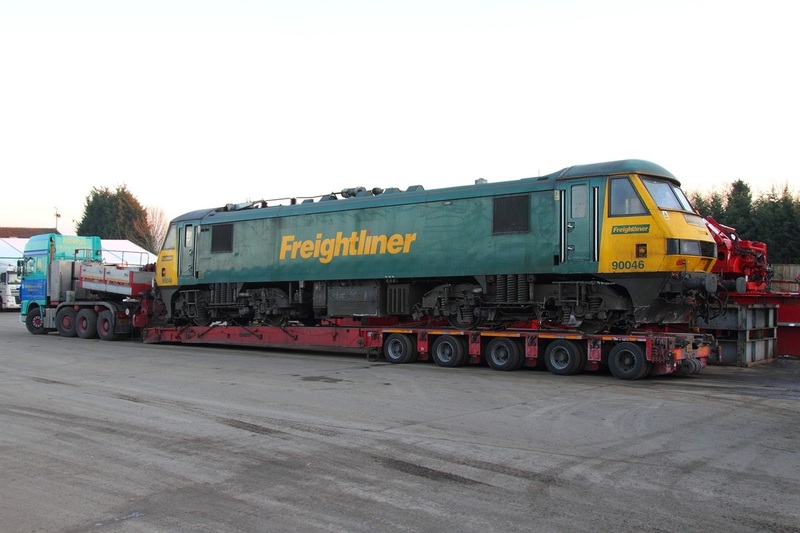 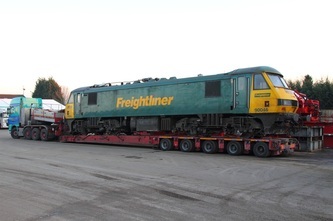 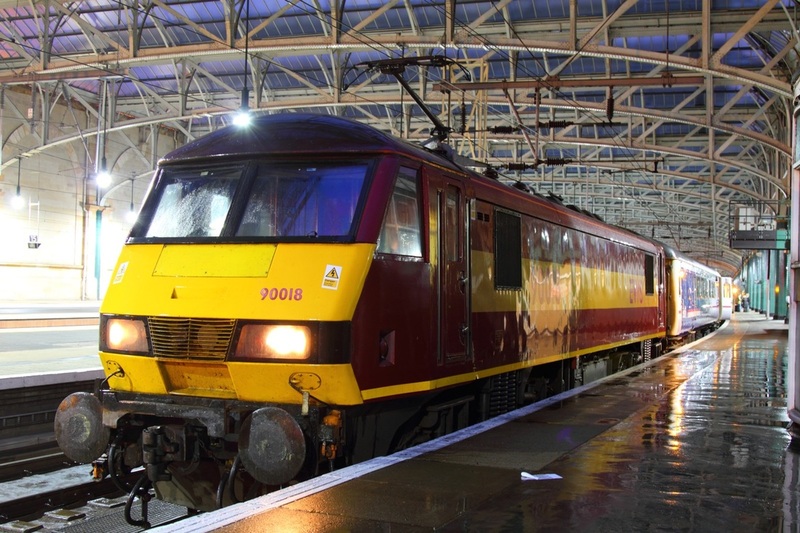 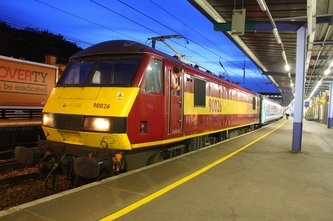 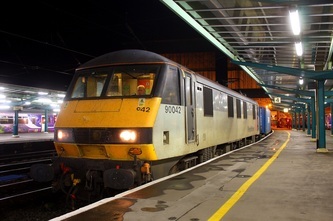 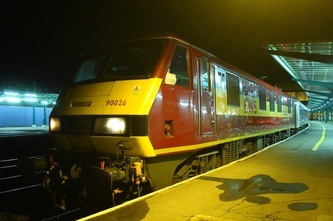 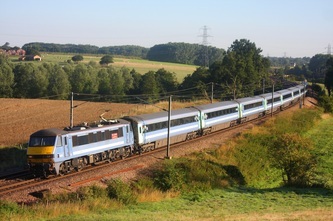 All the sleeper trains were delayed due to an uninterruptible power supply between Penrith and Carlisle. For a different view of the train at this location click here. DRS 90034 works the 1G40 1903 London Euston to Birmingham New Street at Birmingham International on the 4th April 2014. 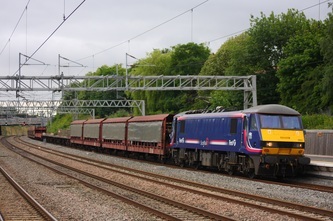 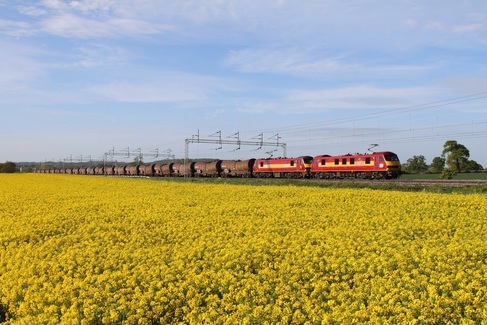 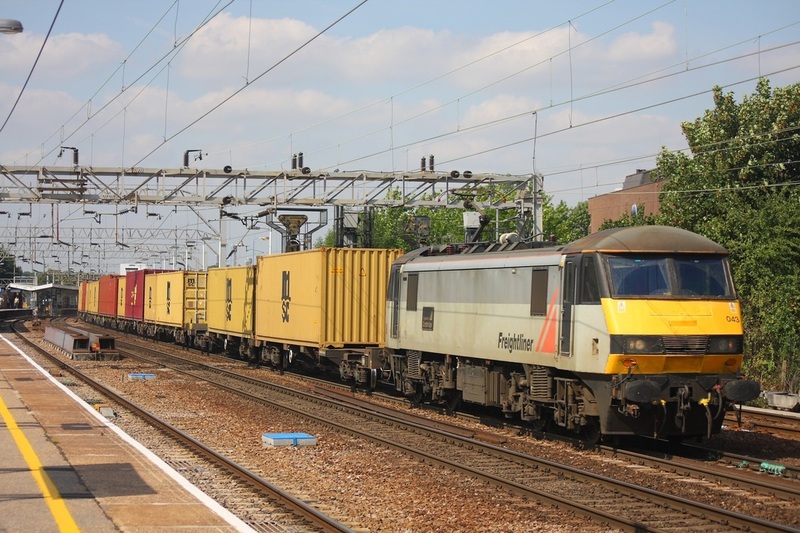 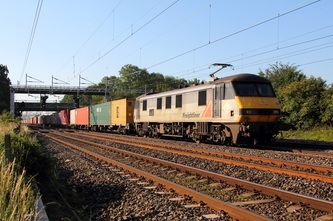 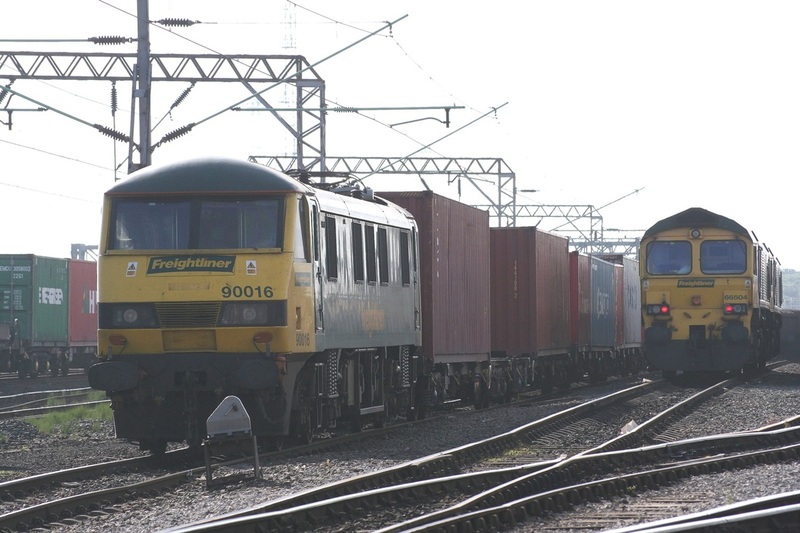 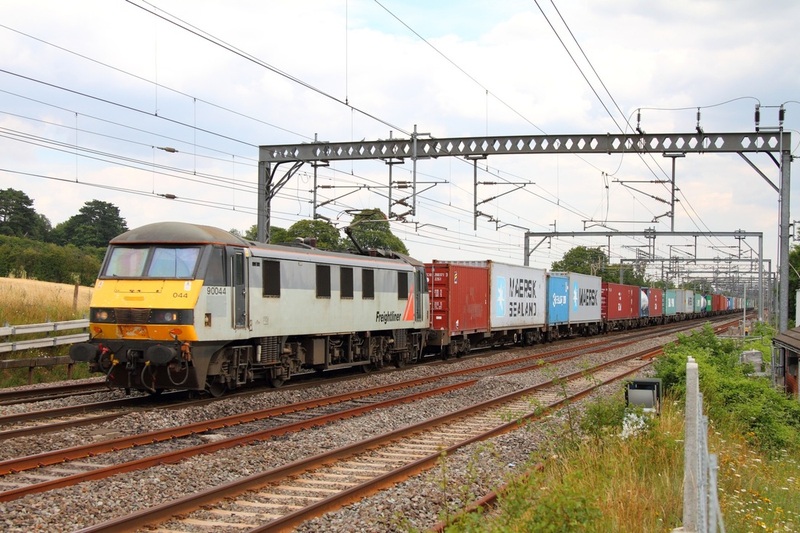 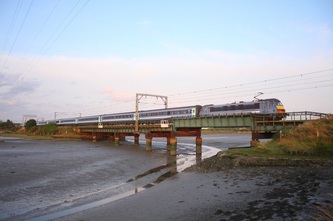 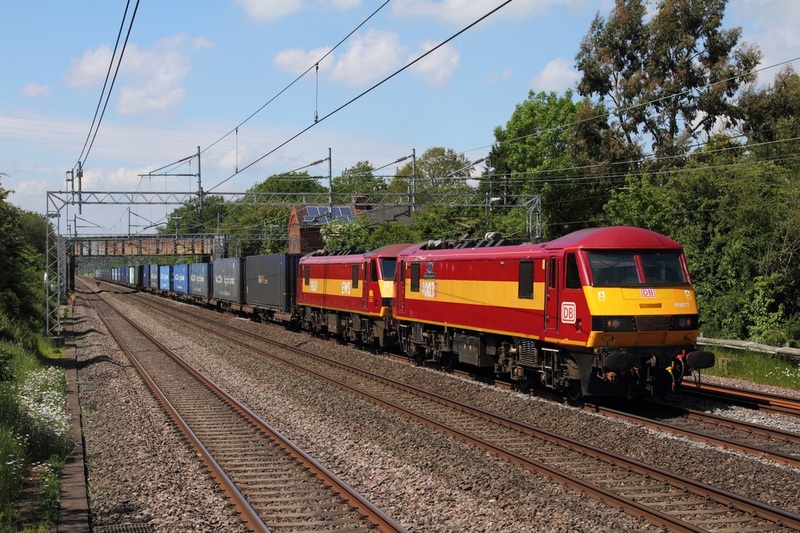 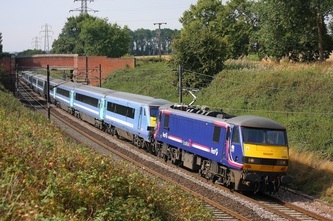 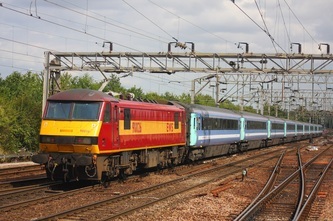 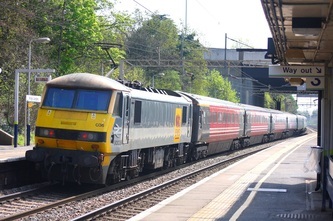 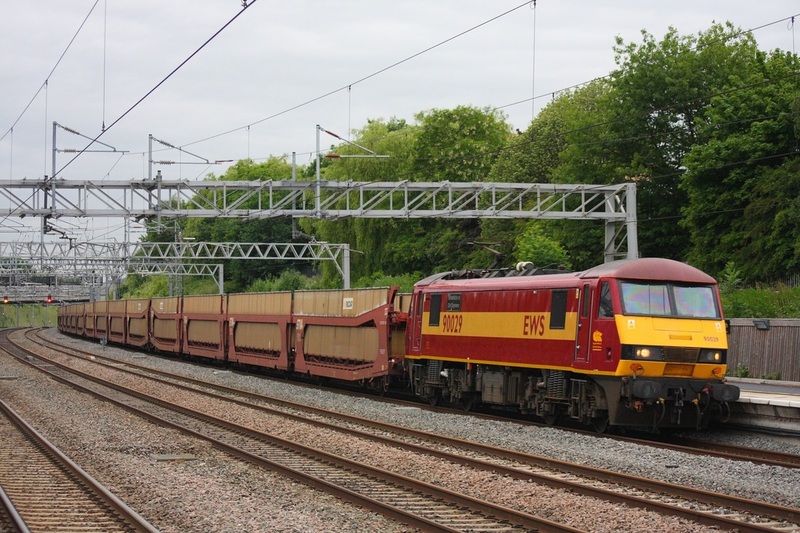 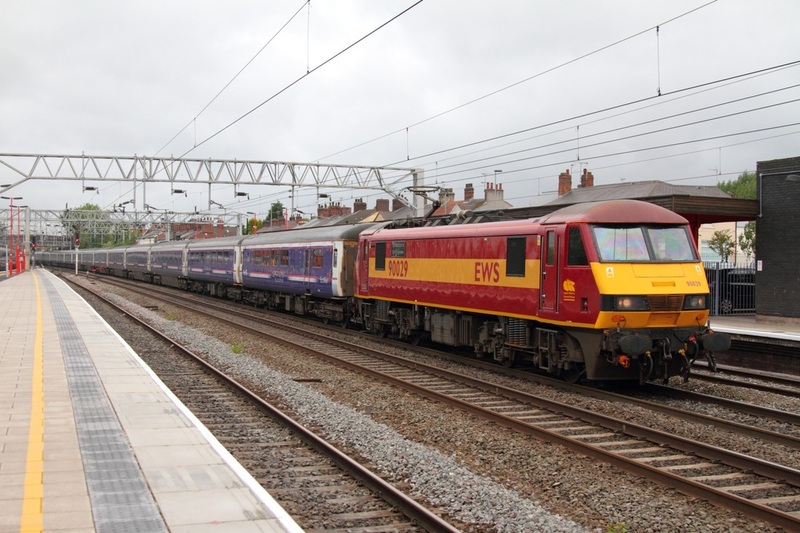 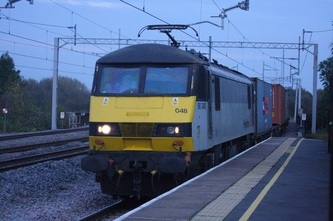 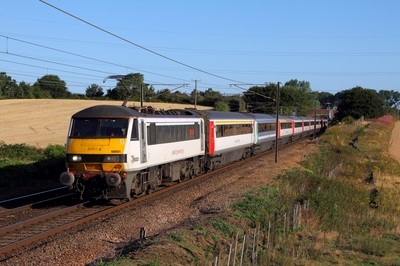 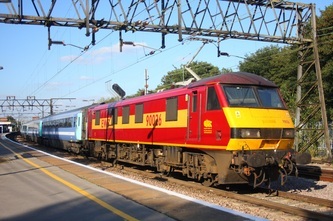 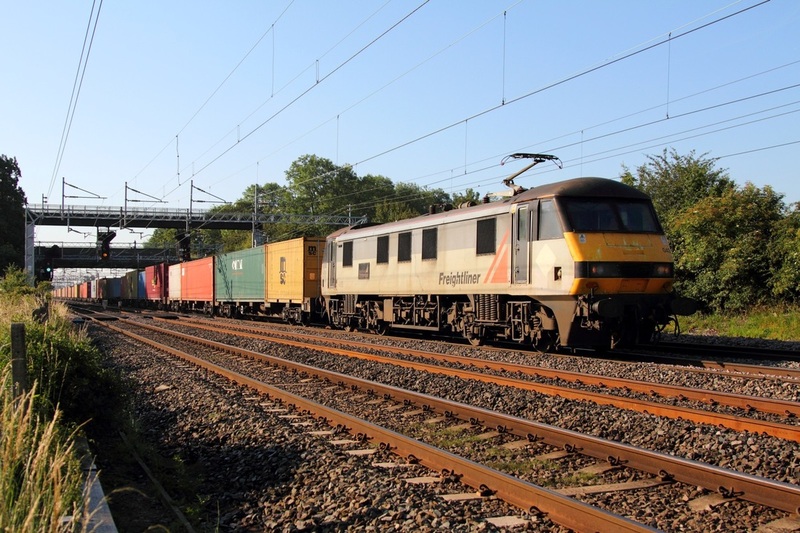 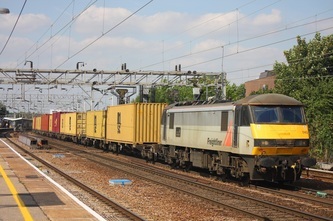 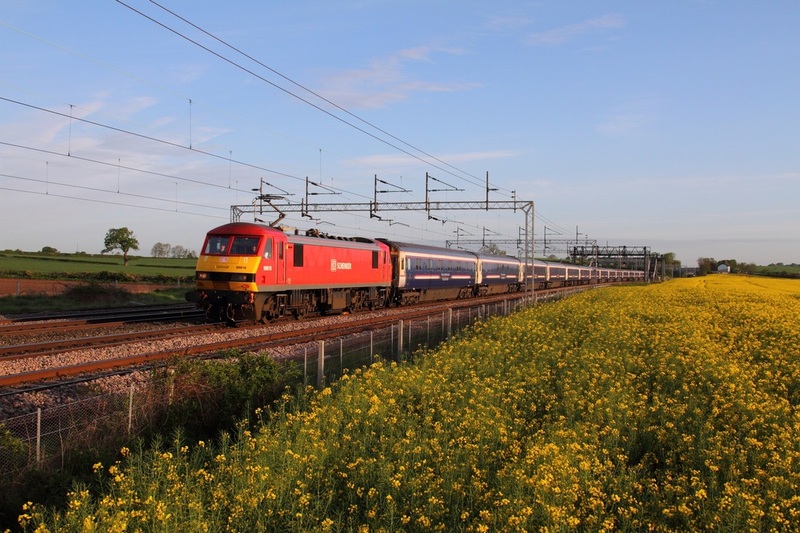 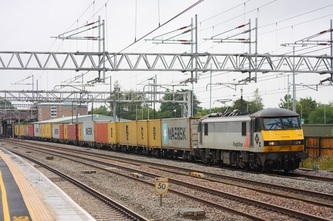 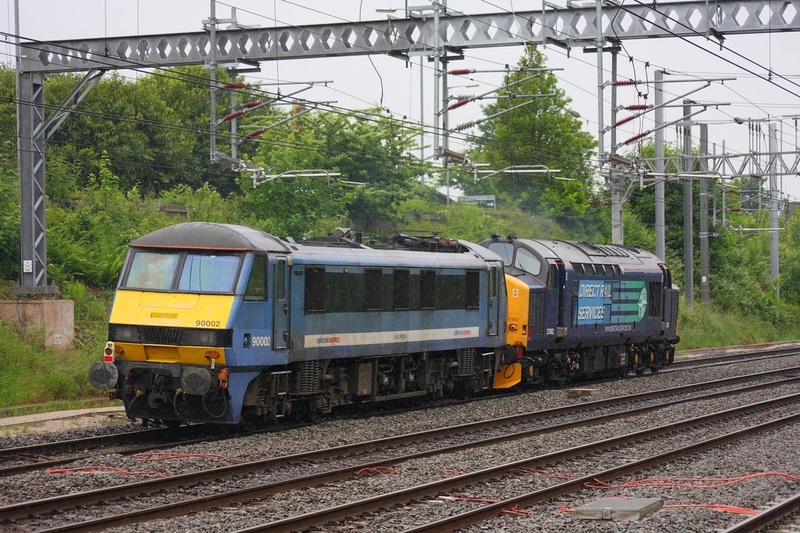 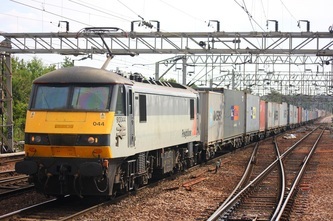 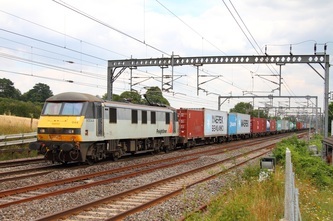 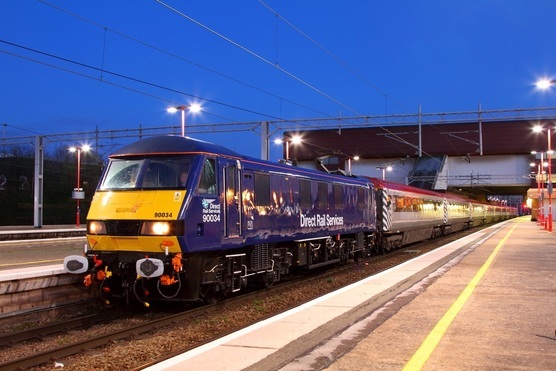 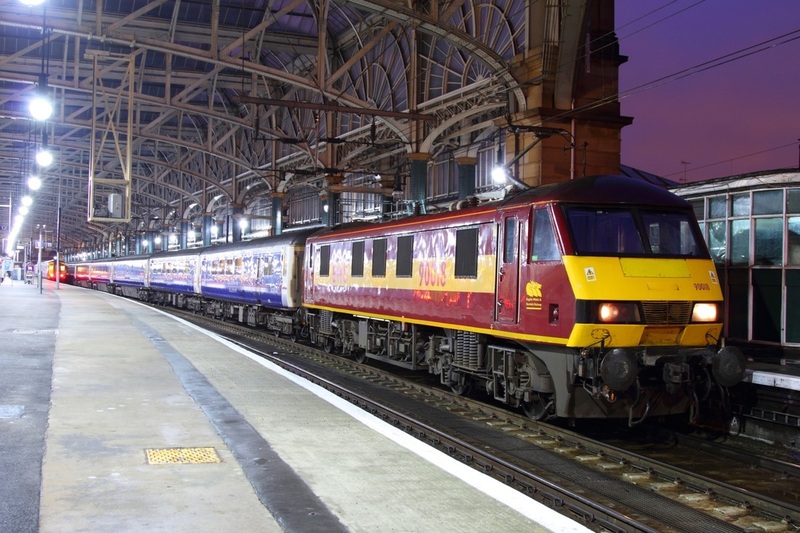 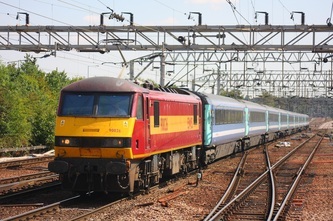 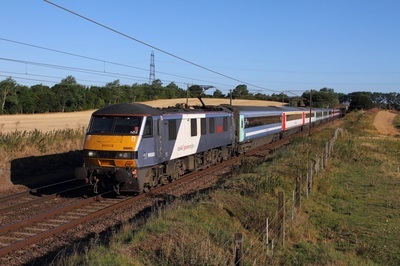 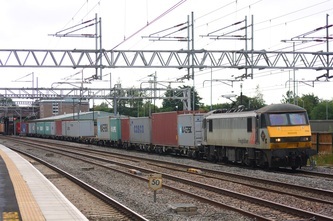 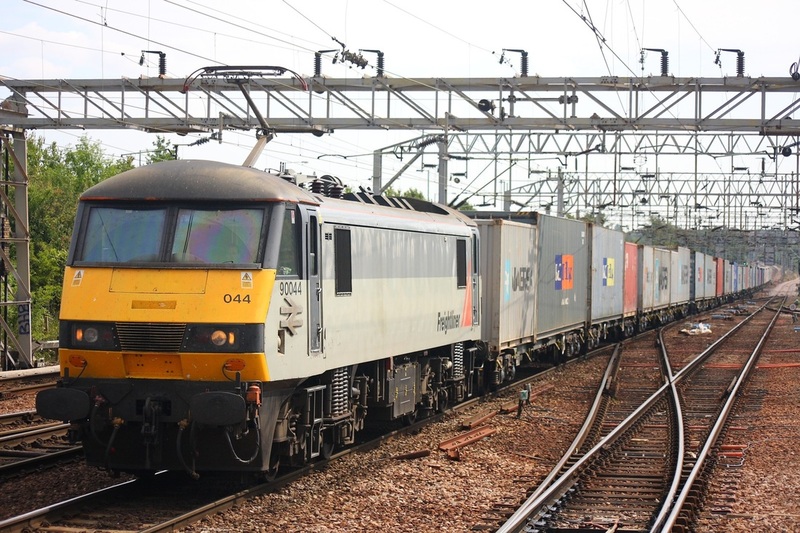 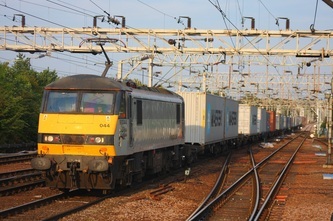 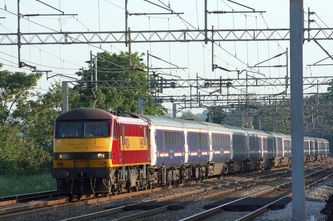 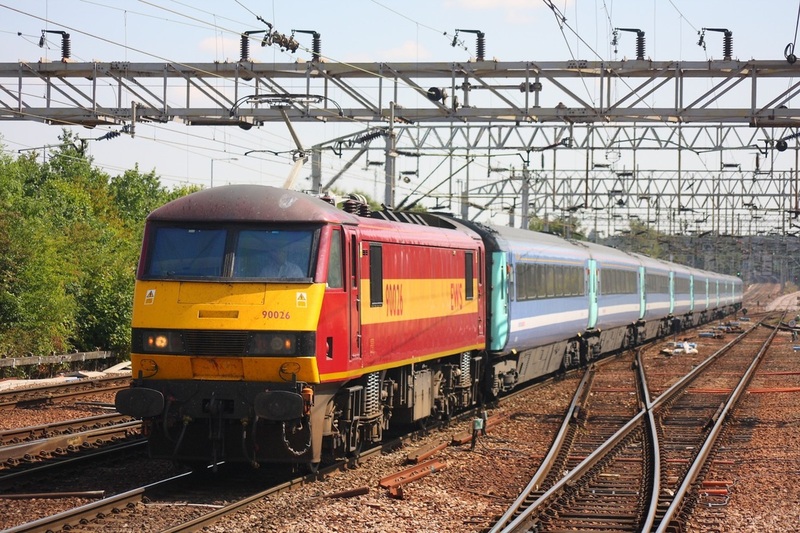 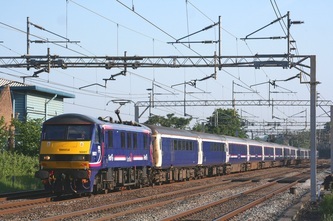 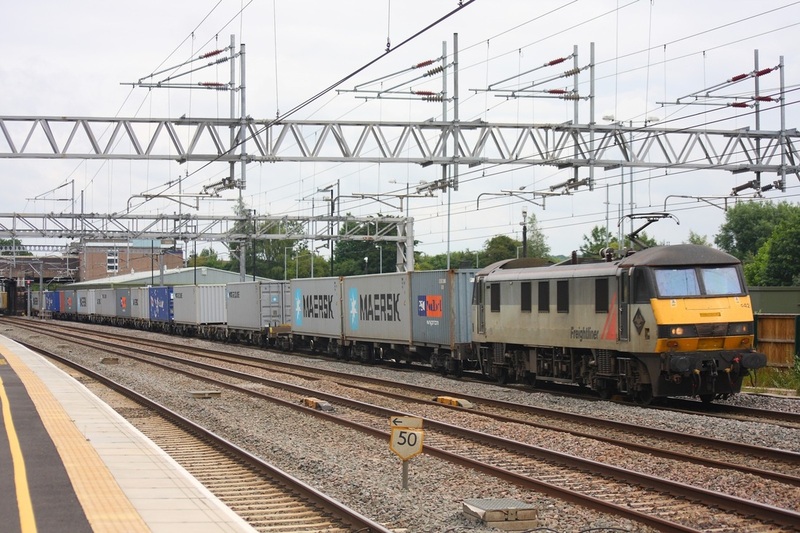 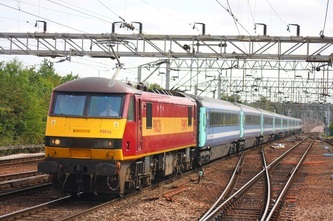 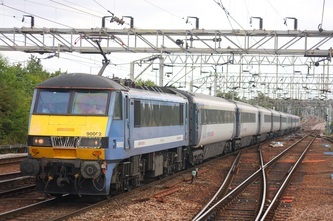 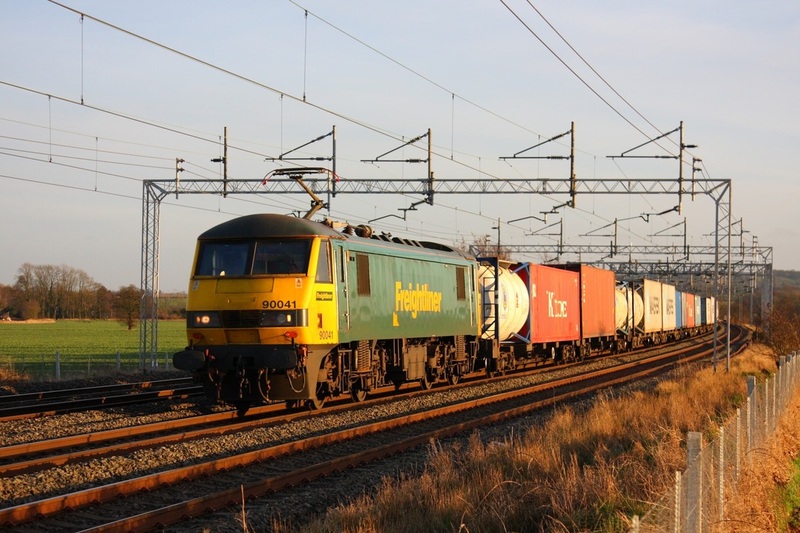 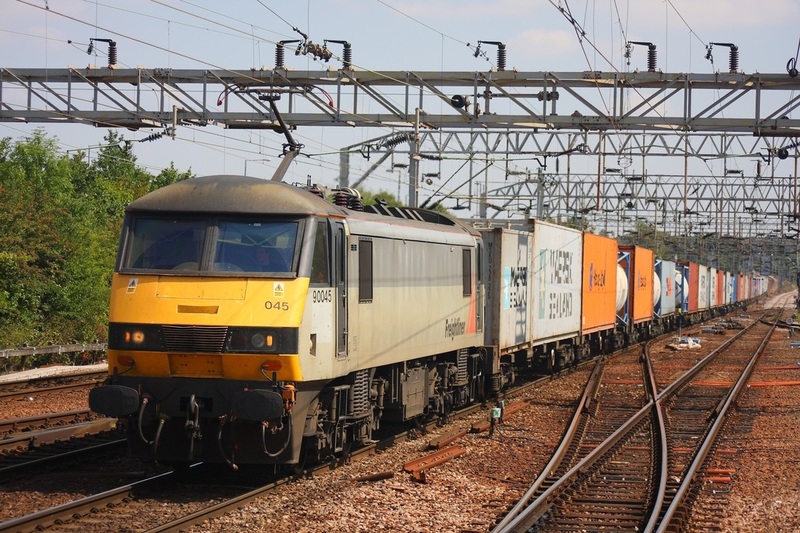 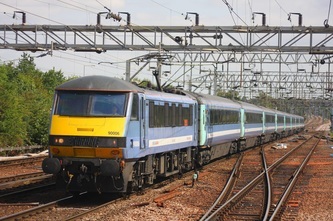 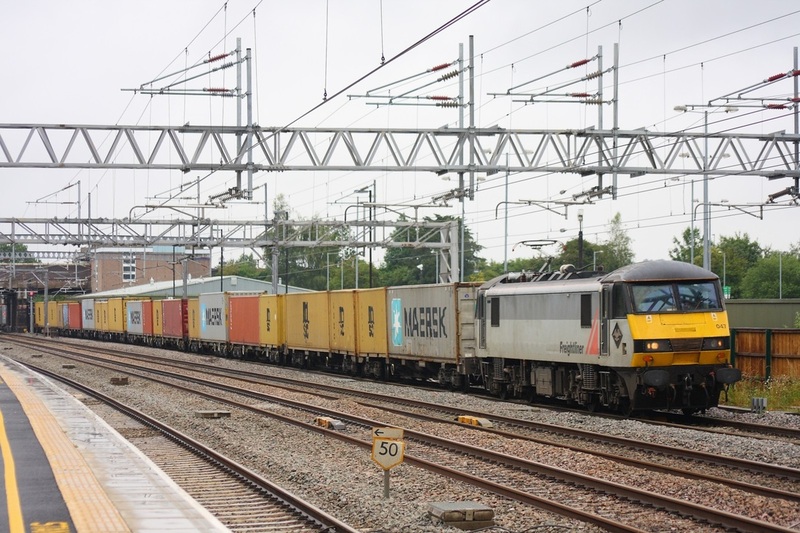 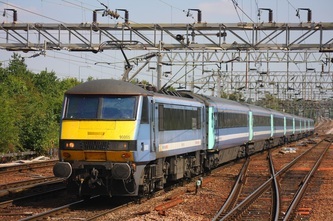 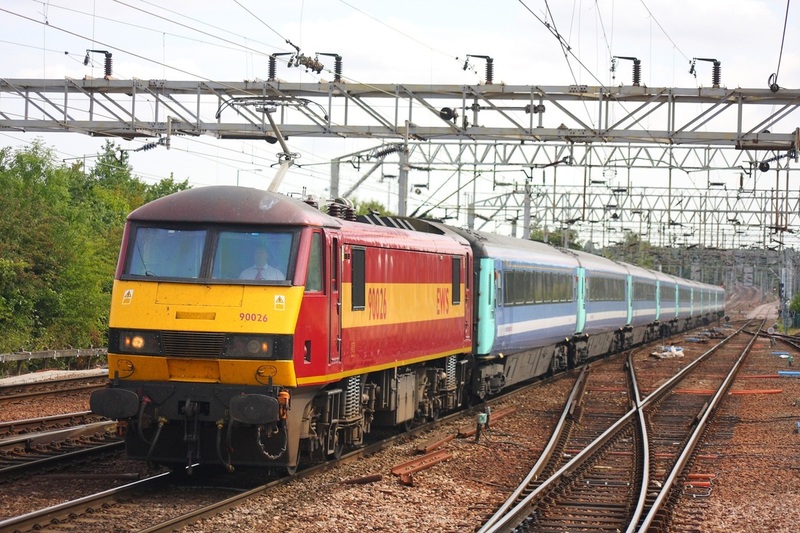 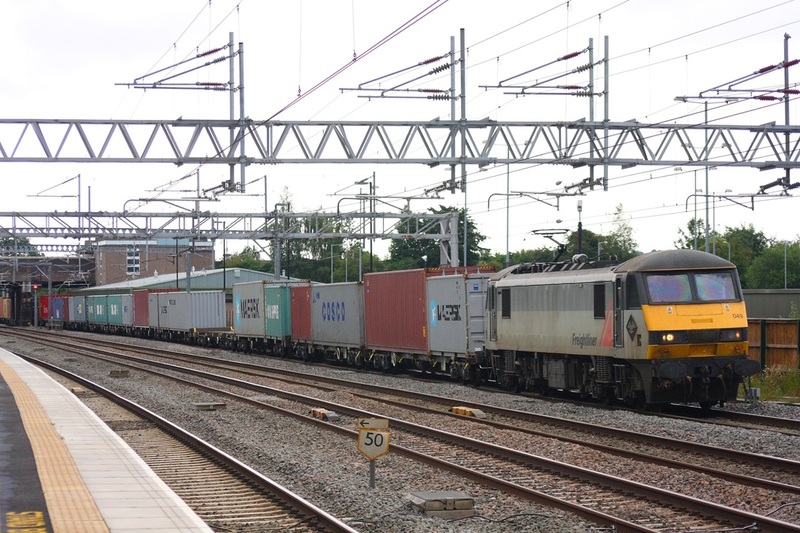 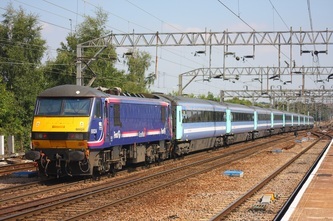 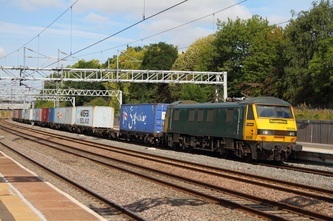 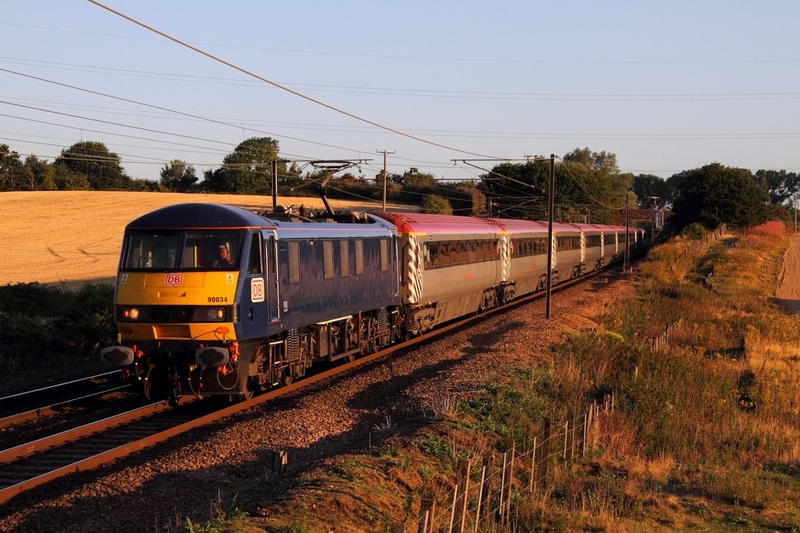 DB Schenker's EWS liveried 90035 speeds through Cromwell near Newark hauling the 1M16 Inverness to London Euston night sleeper on the 3rd May 2014. 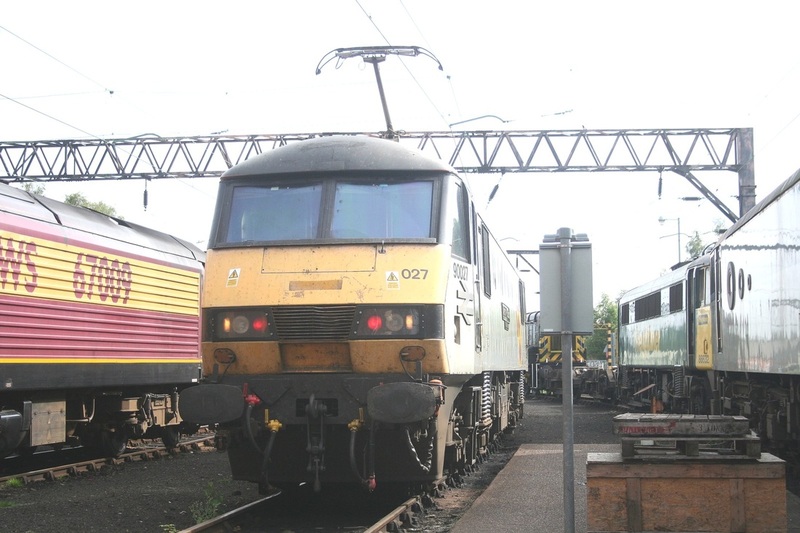 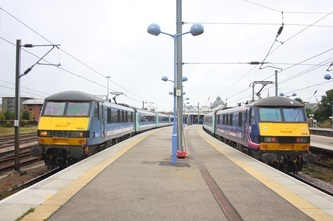 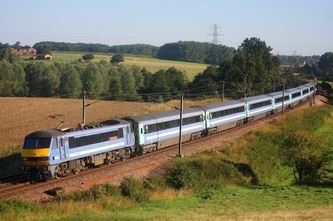 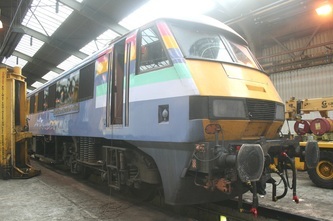 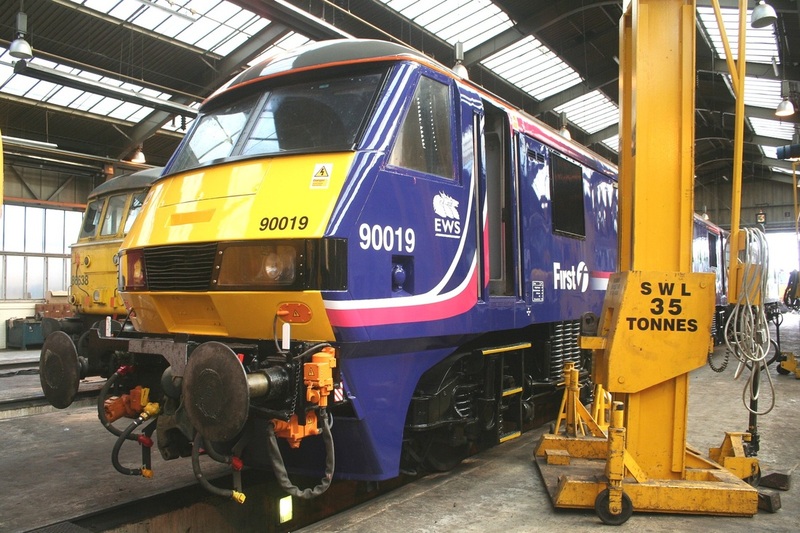 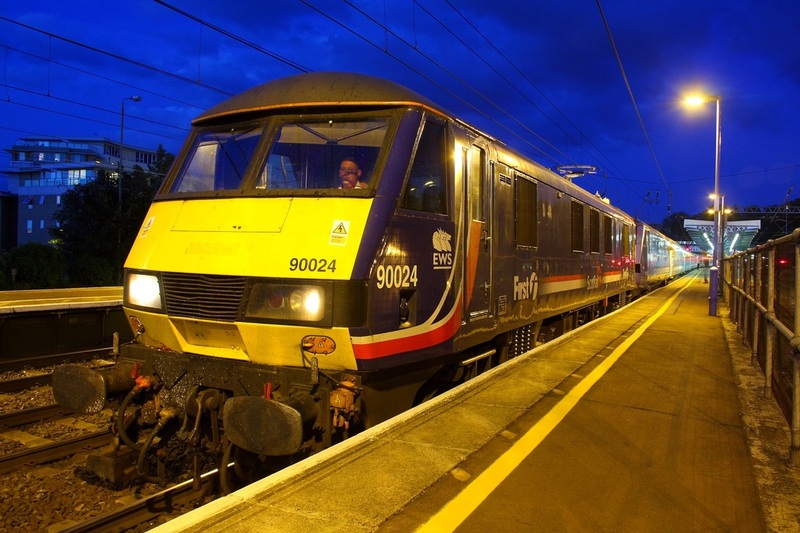 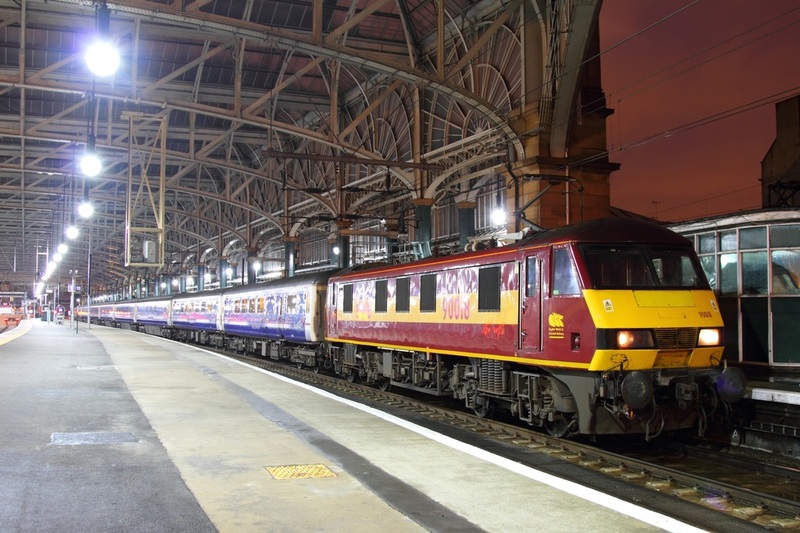 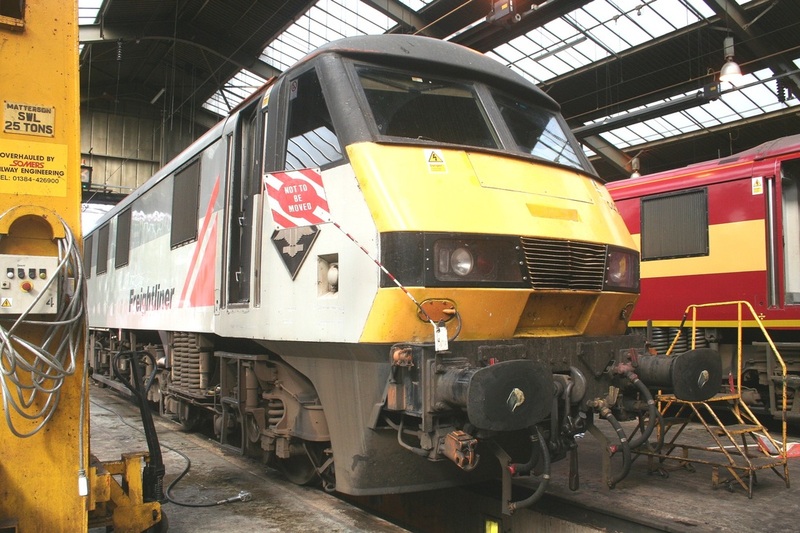 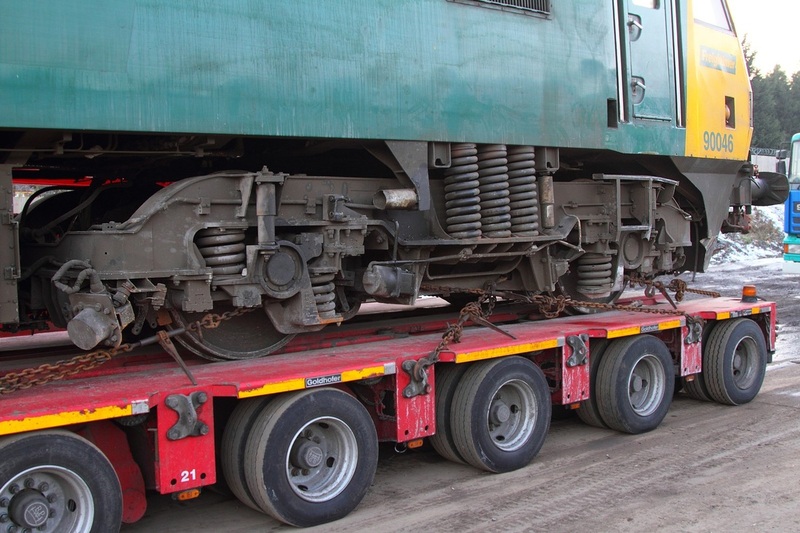 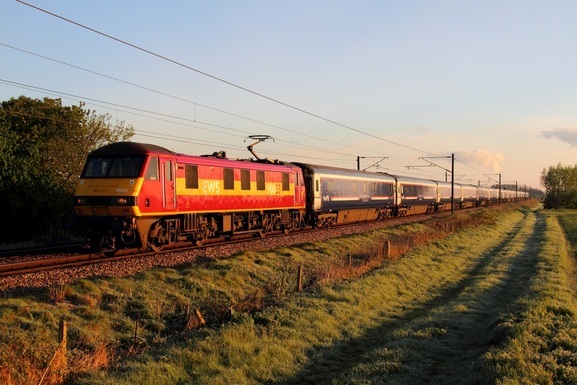 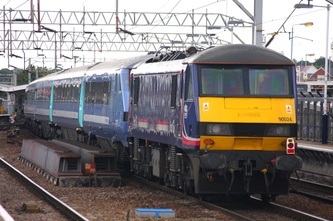 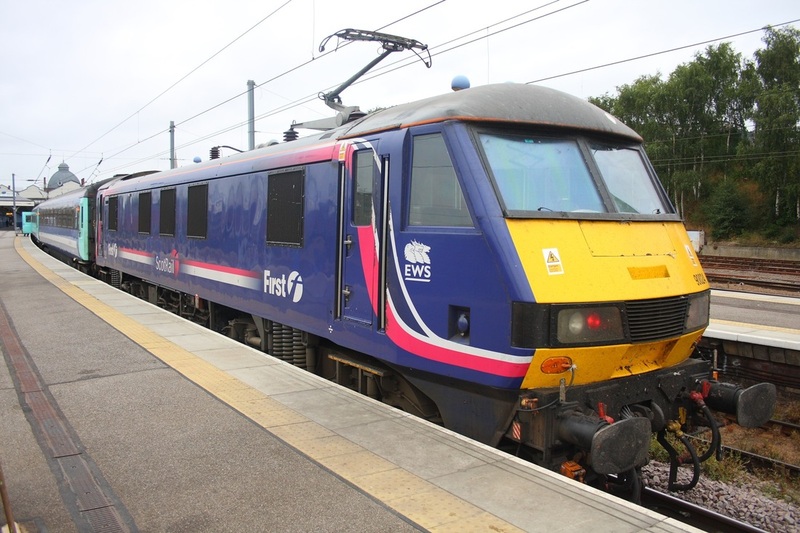 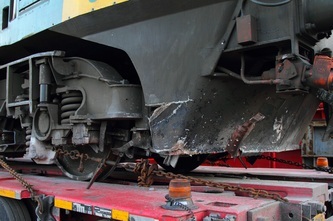 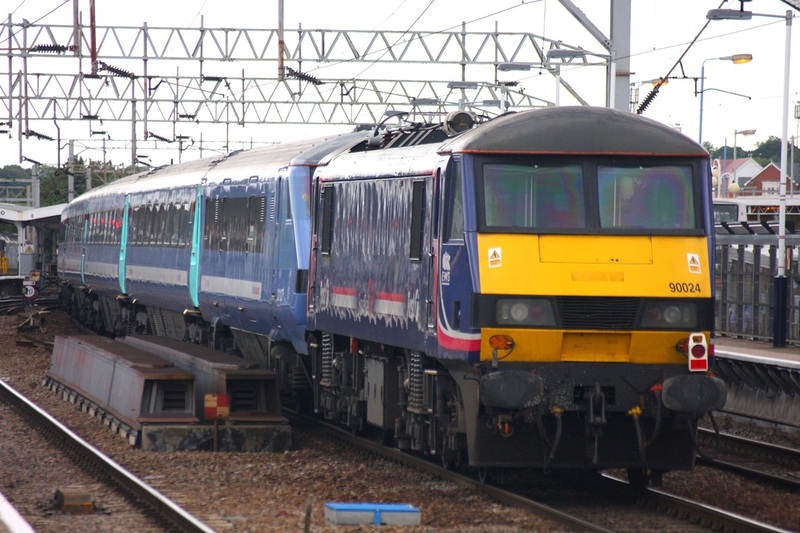 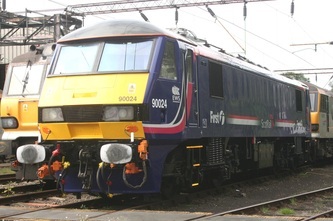 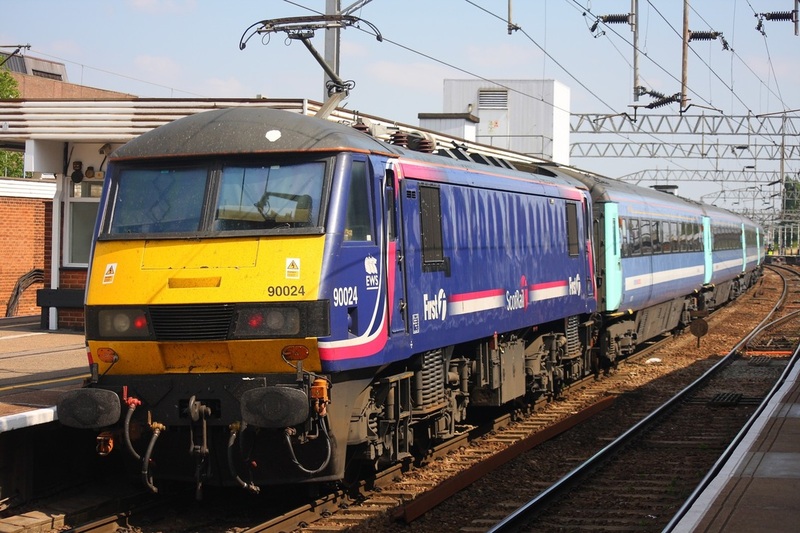 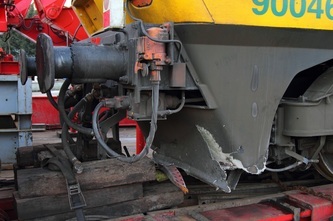 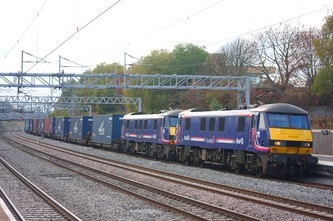 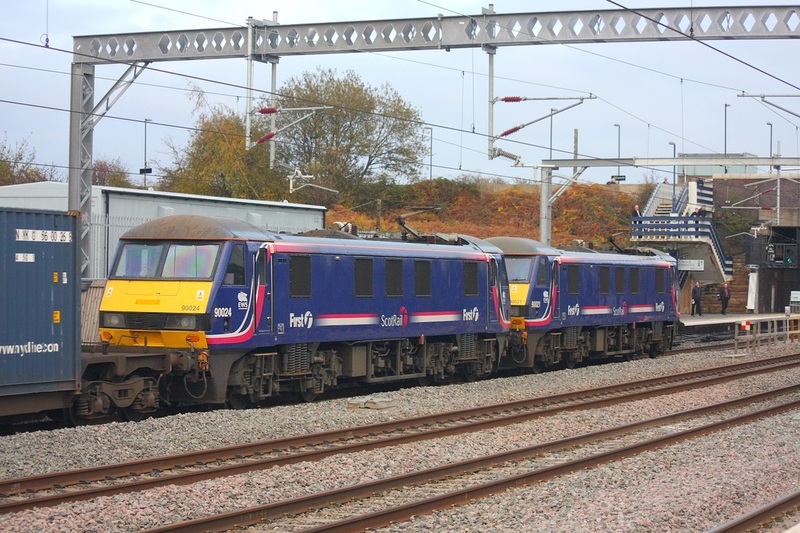 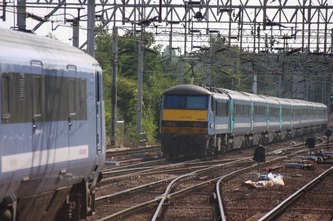 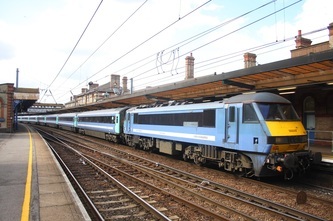 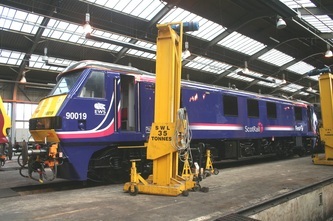 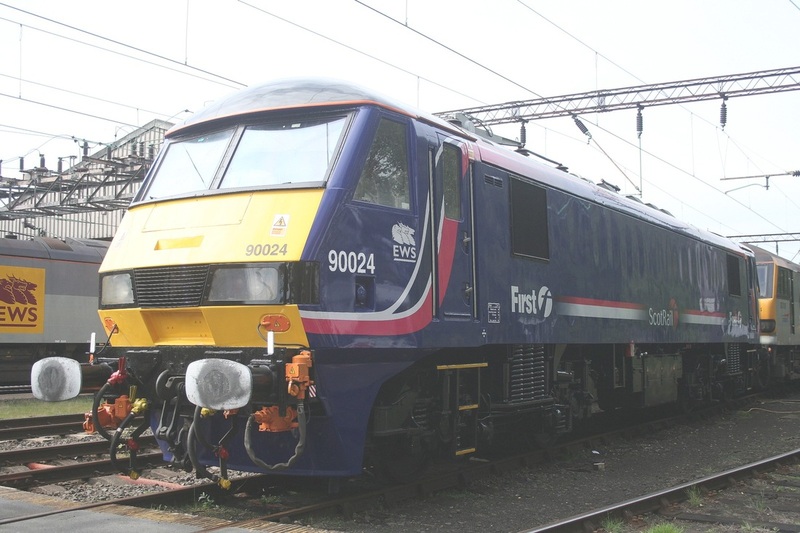 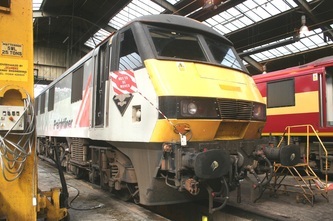 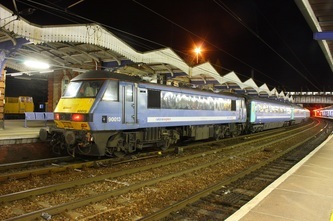 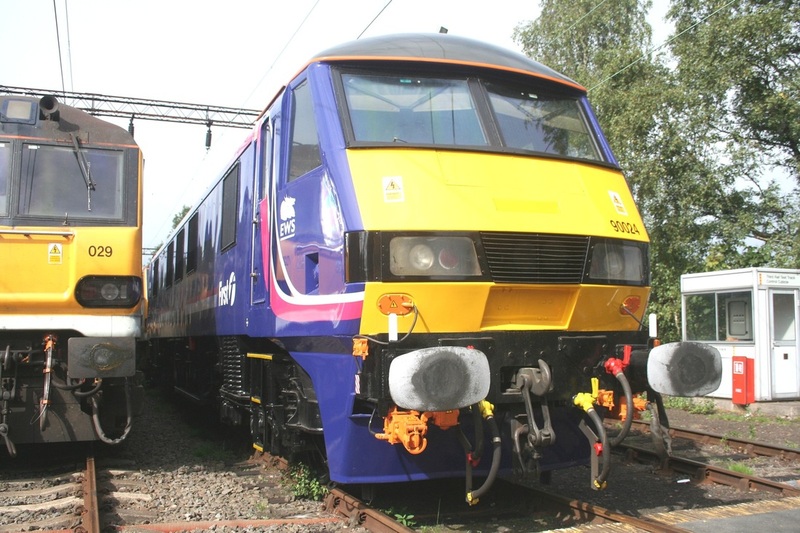 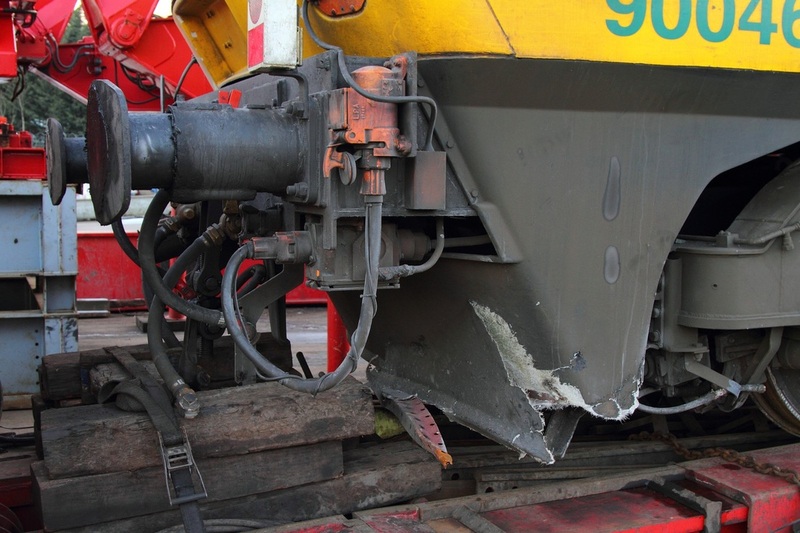 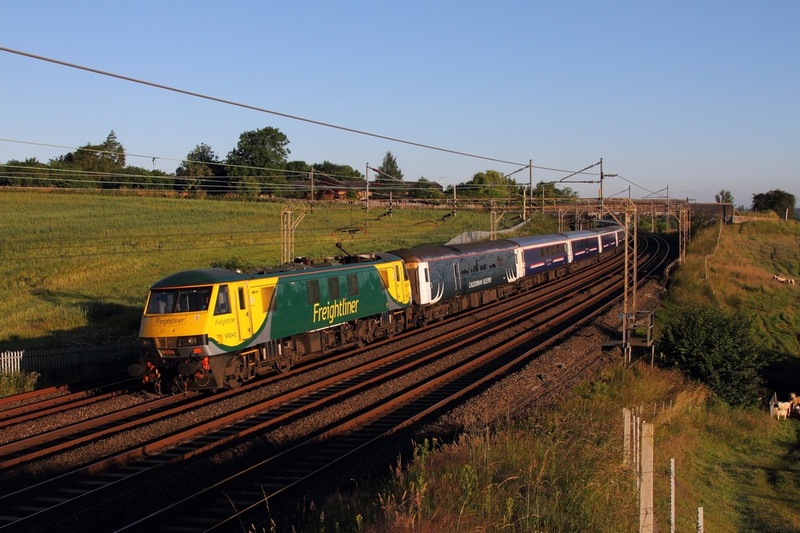 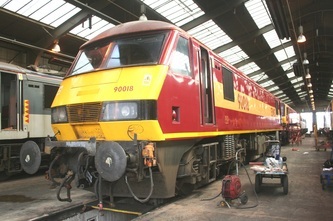 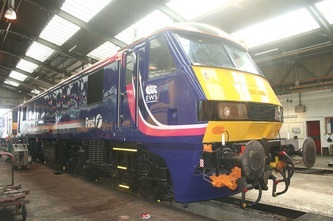 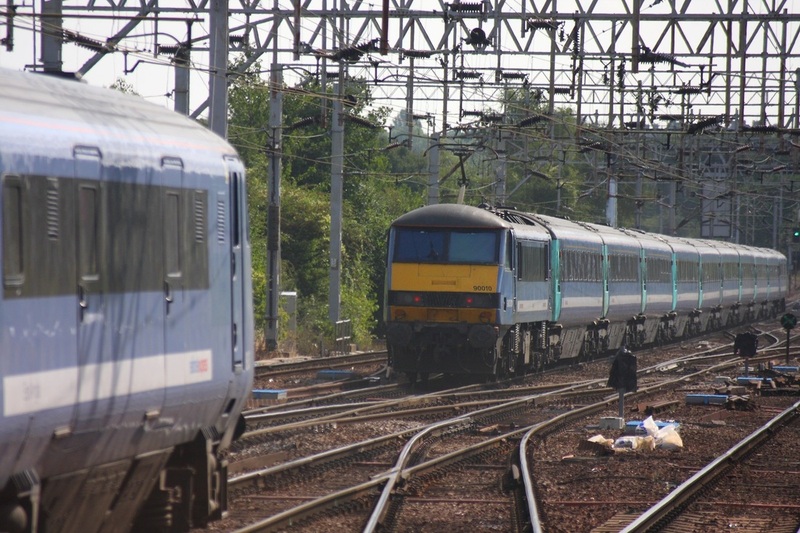 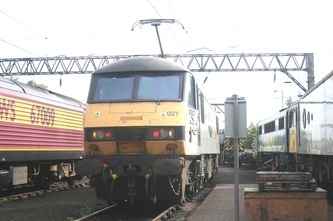 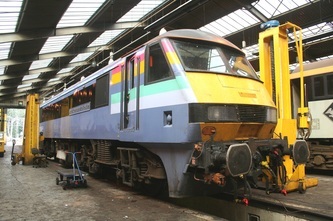 All Scotrail sleepers were diverted via the ECML due to May Bank holiday weekend engineering works. 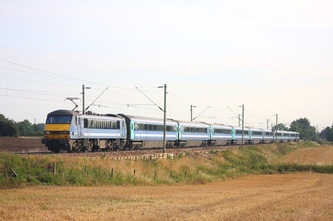 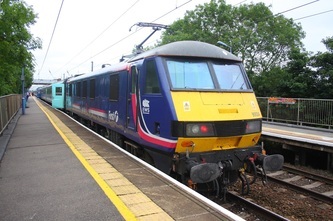 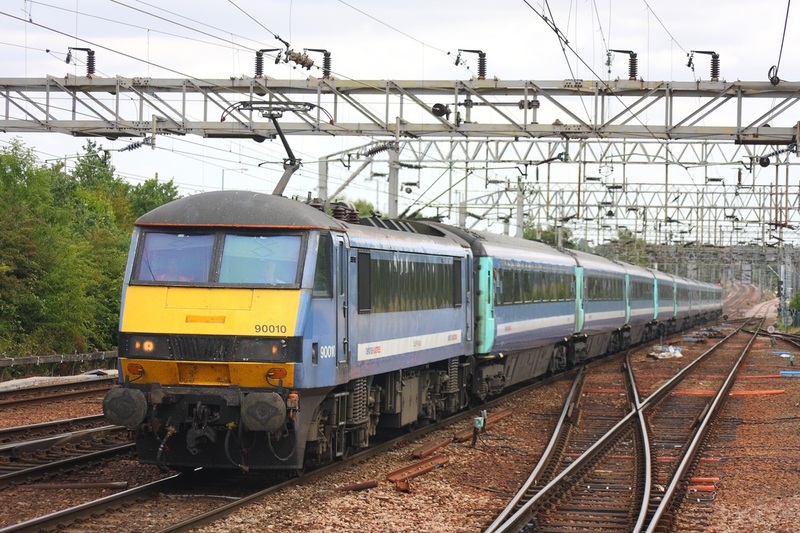 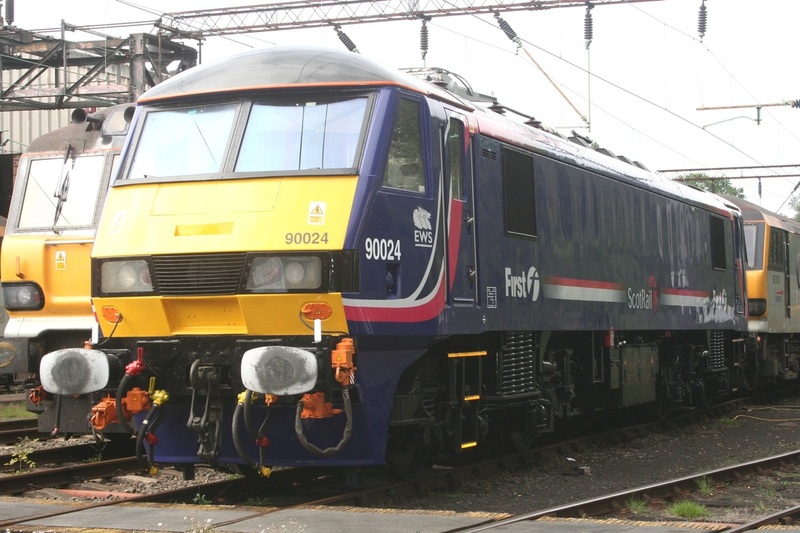 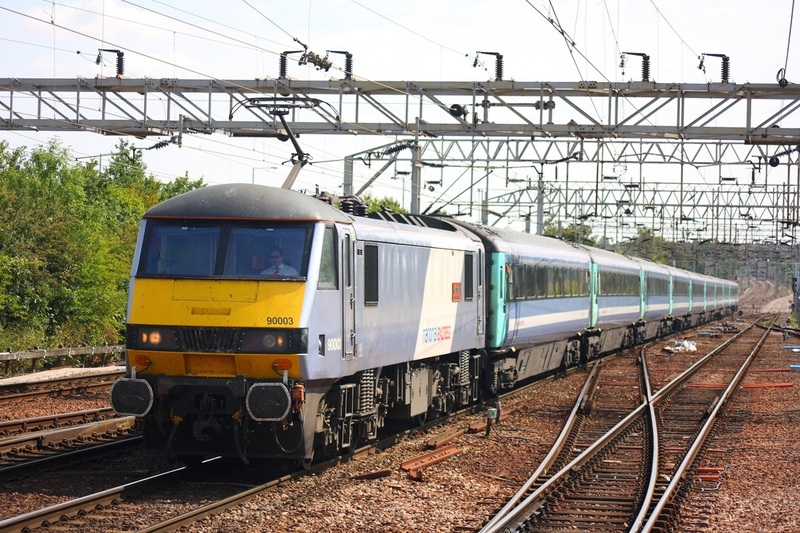 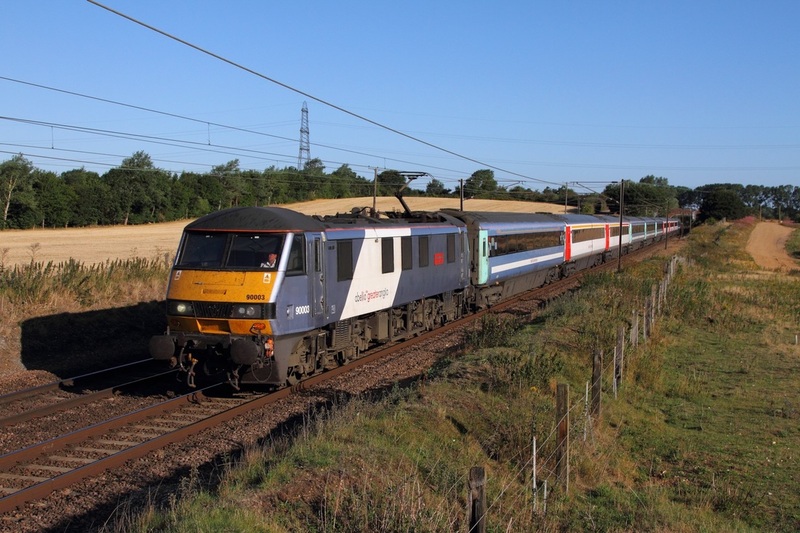 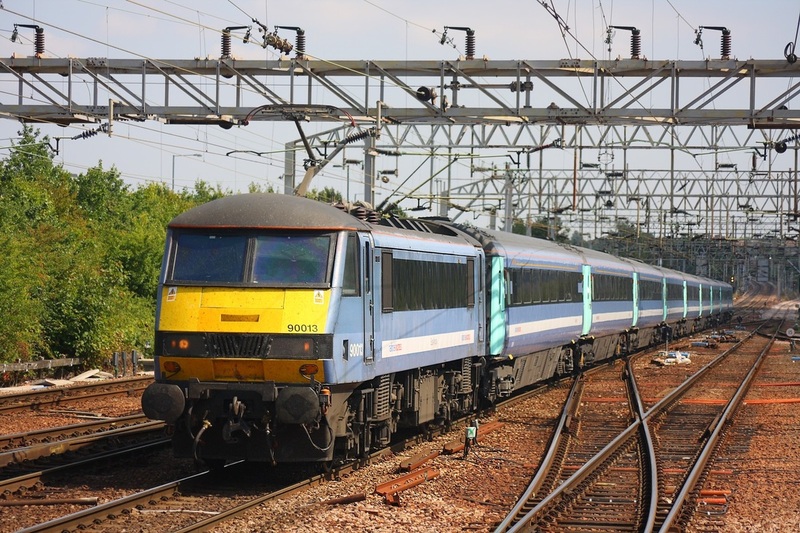 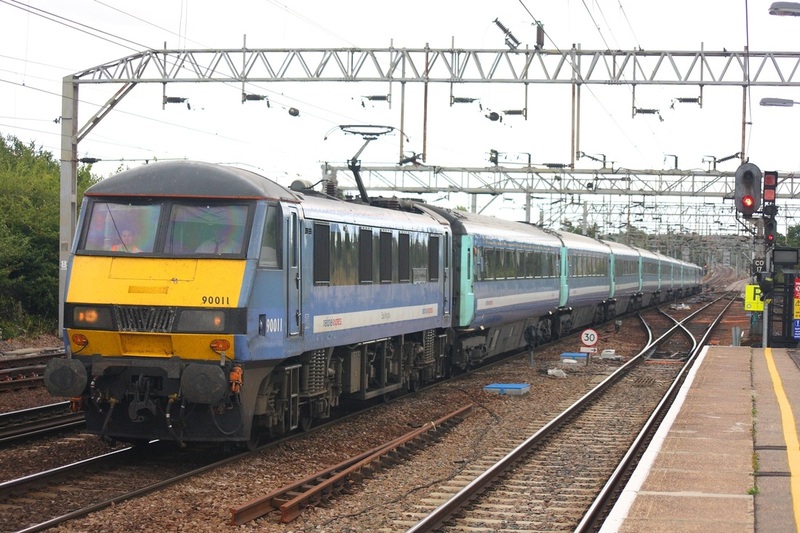 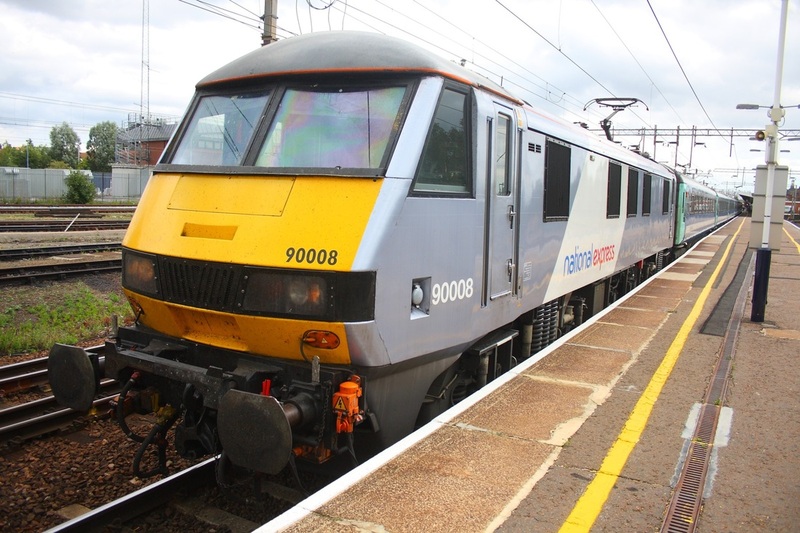 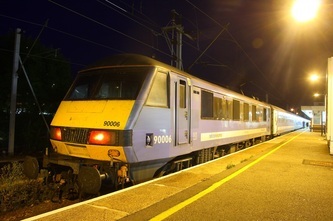 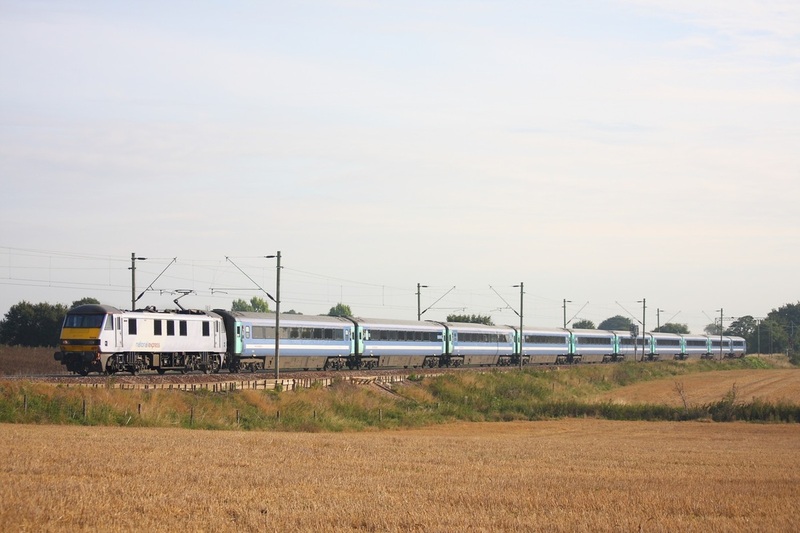 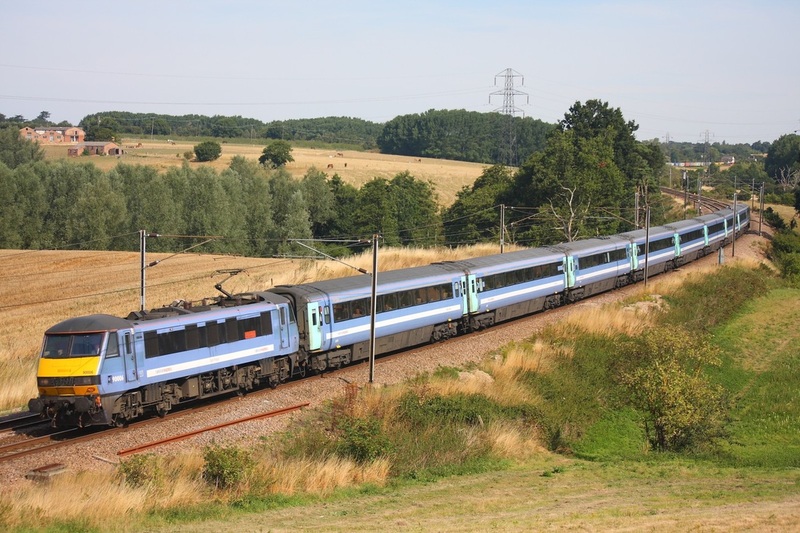 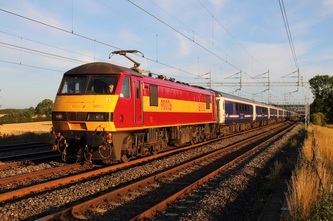 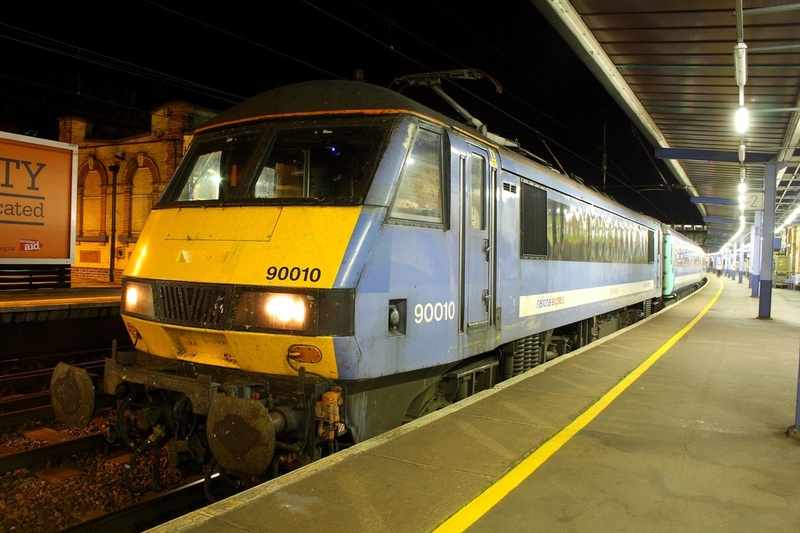 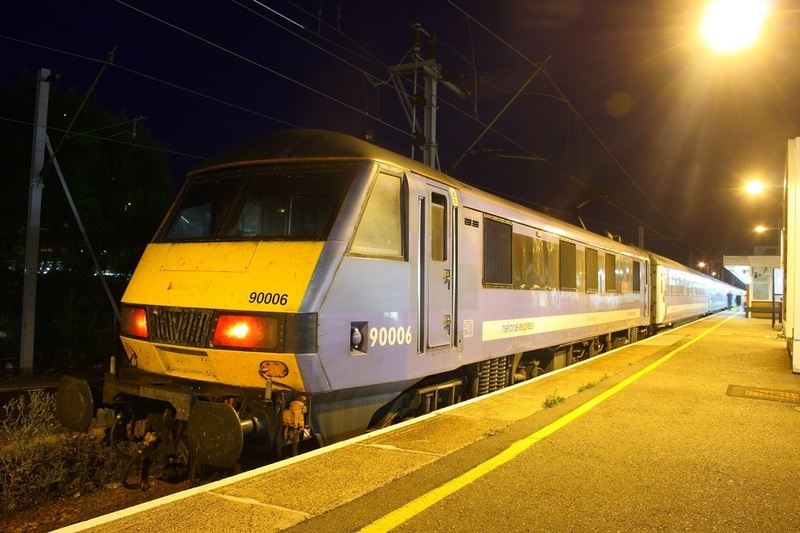 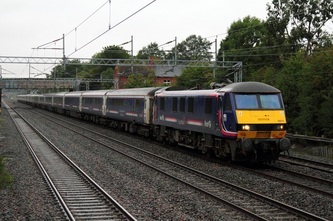 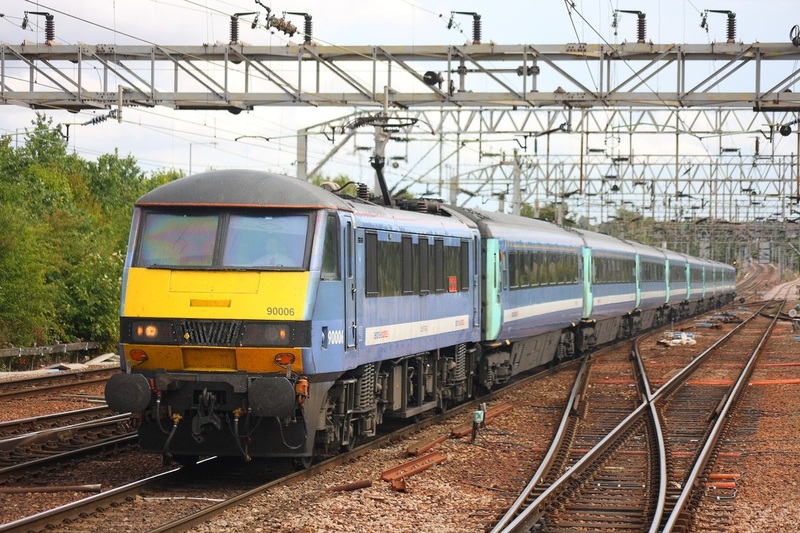 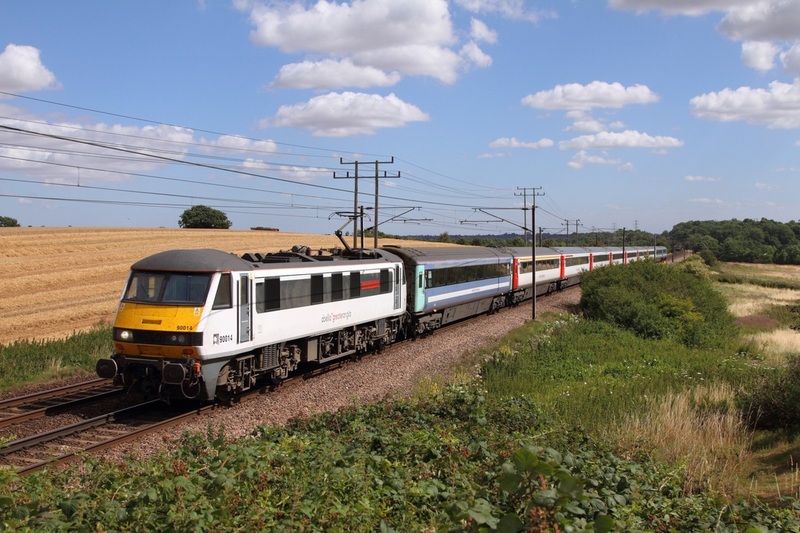 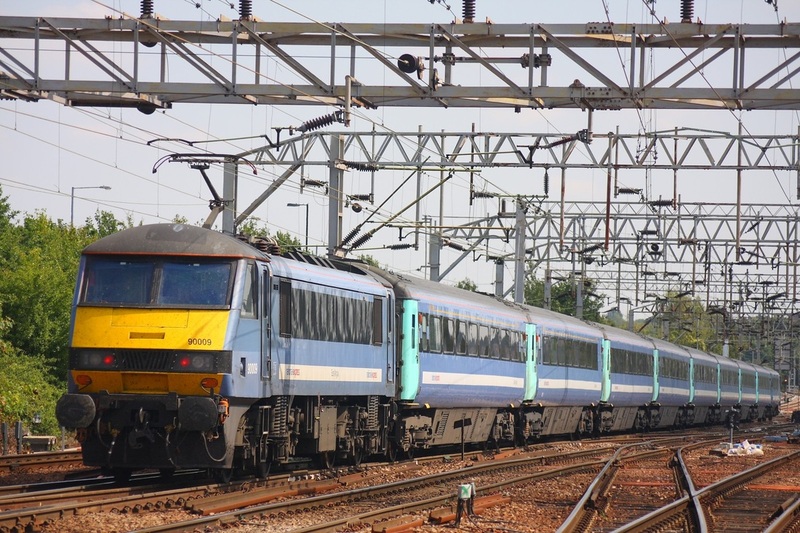 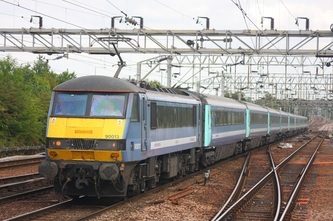 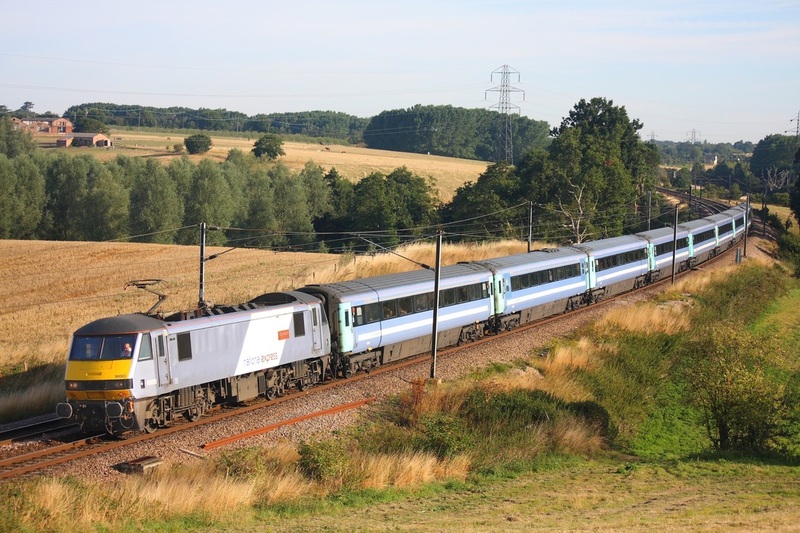 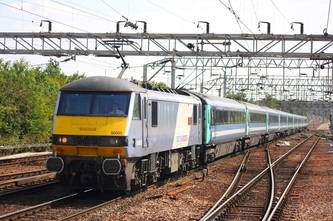 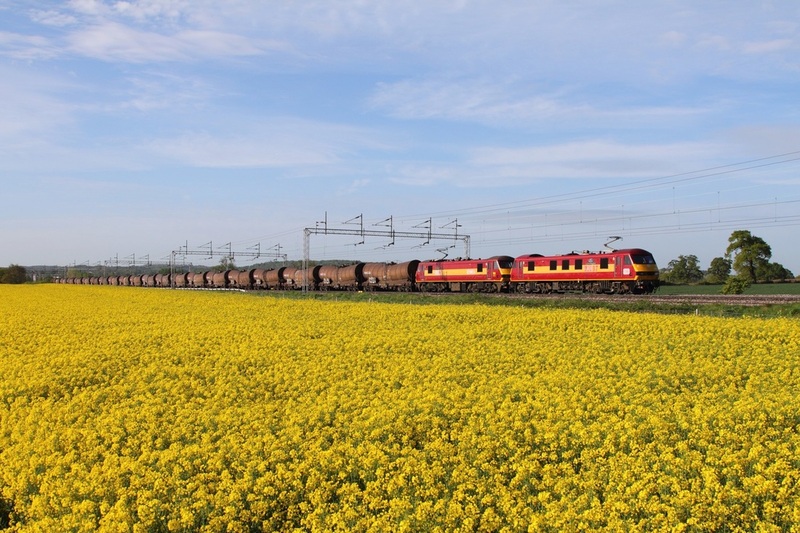 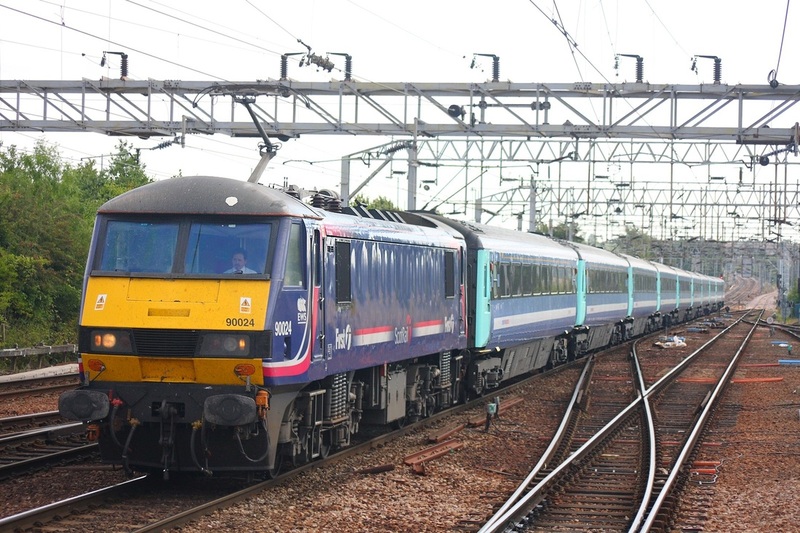 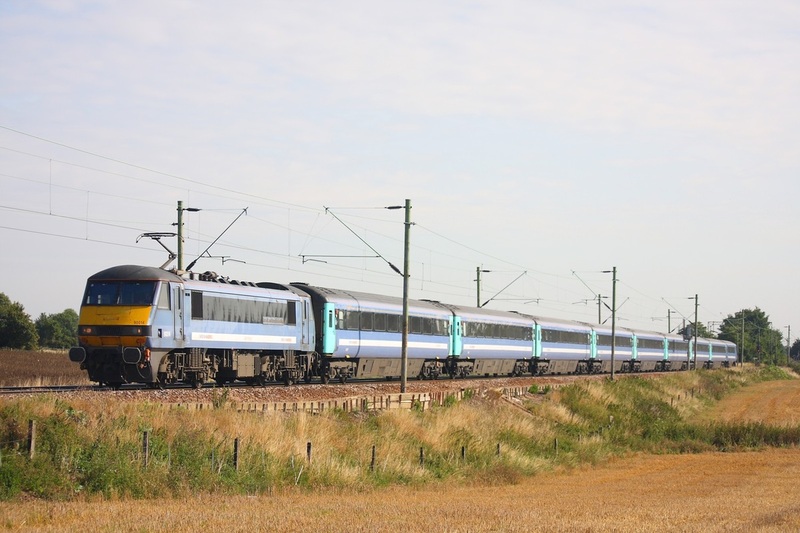 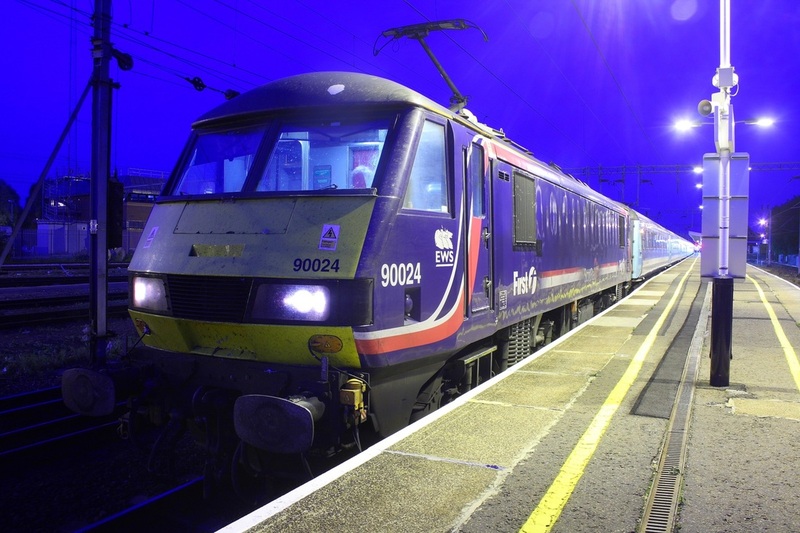 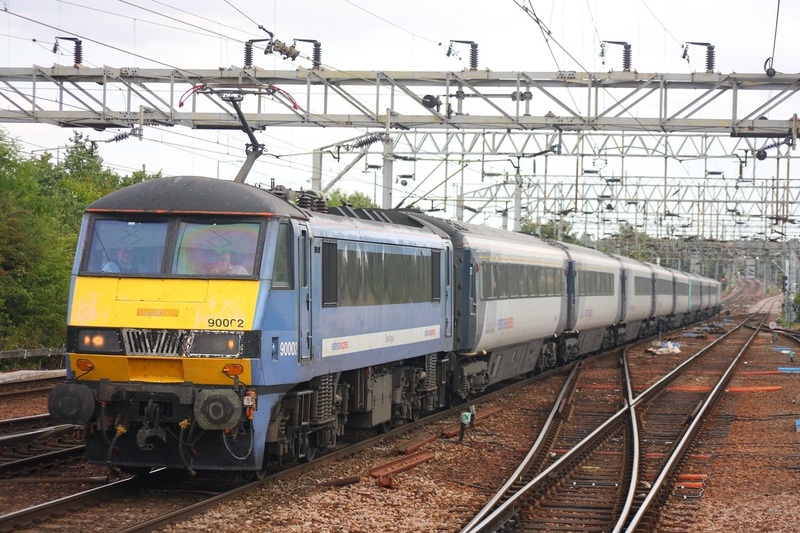 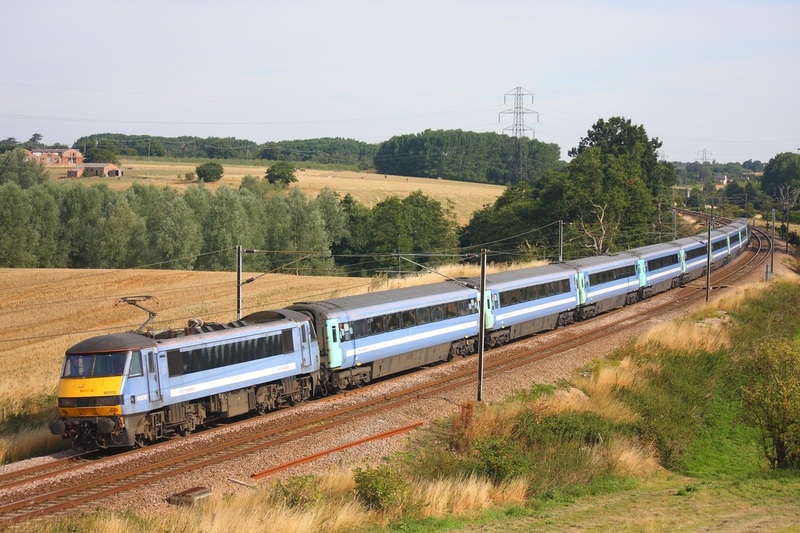 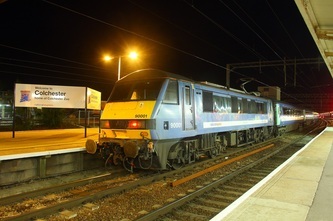 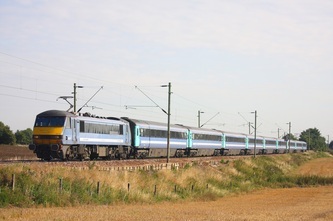 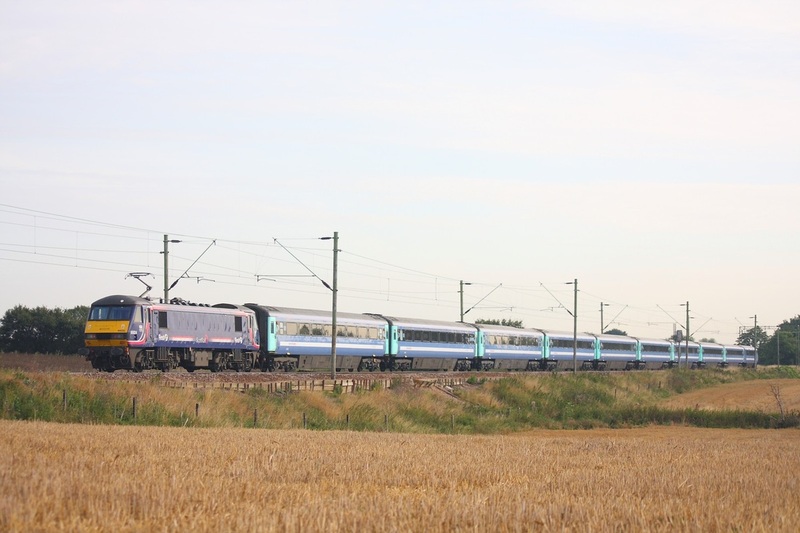 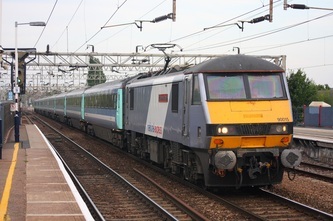 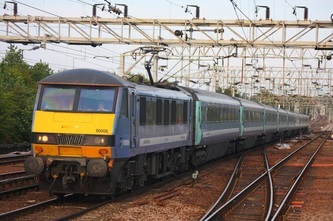 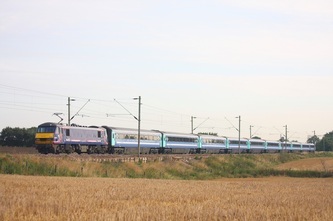 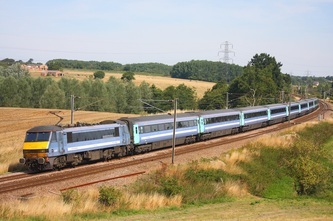 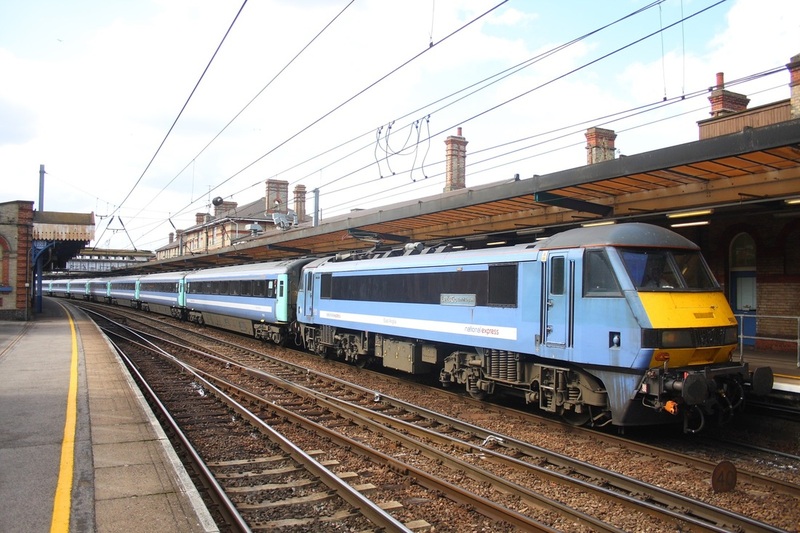 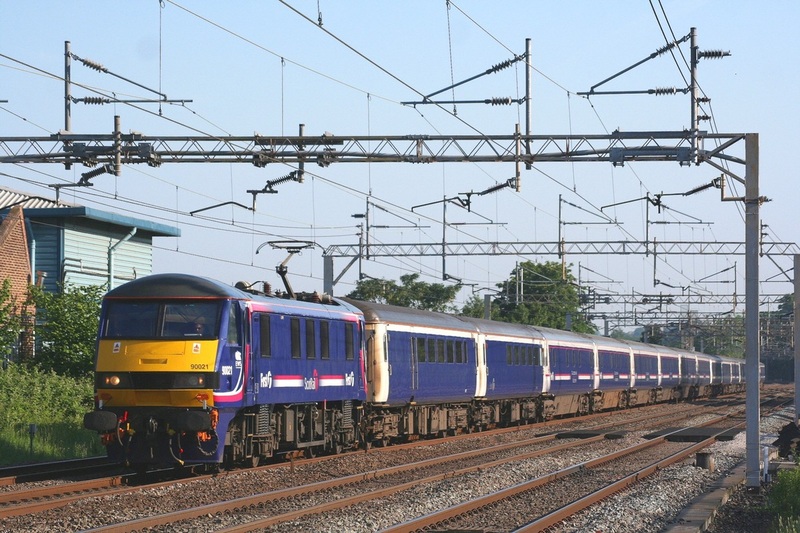 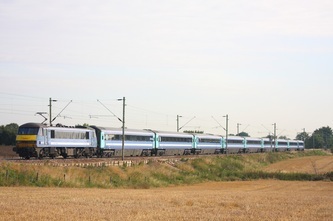 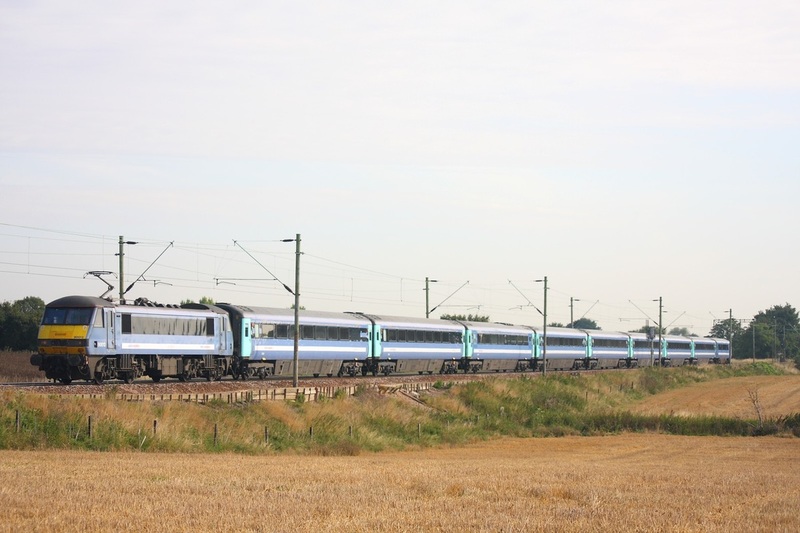 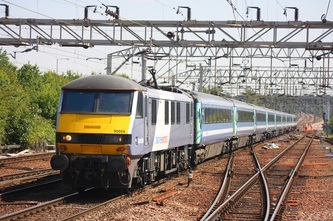 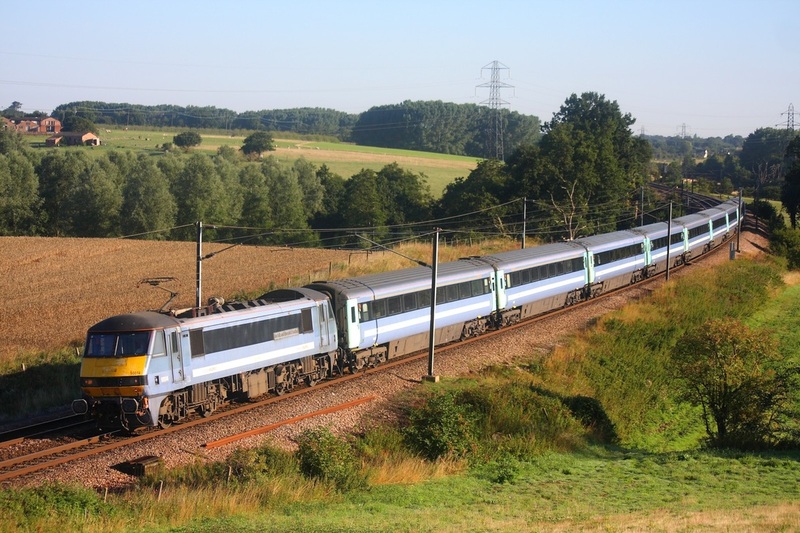 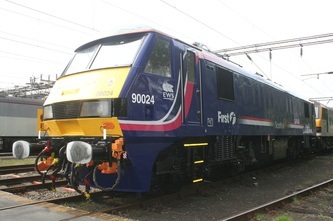 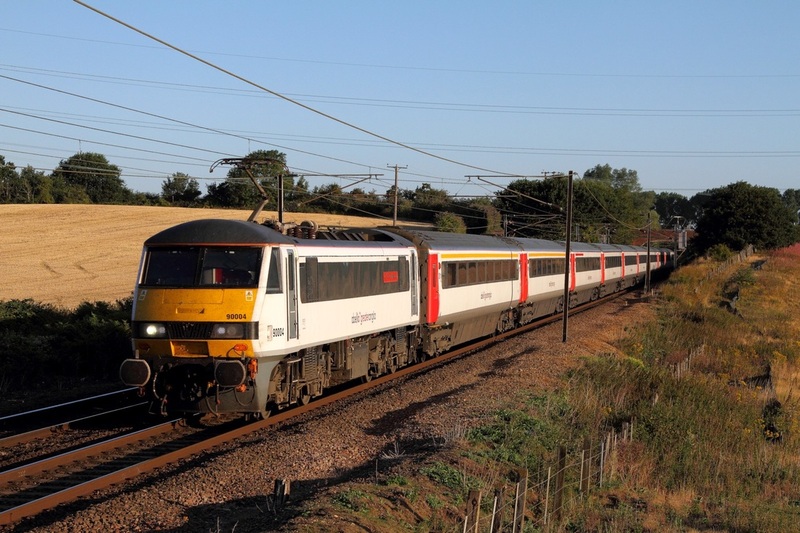 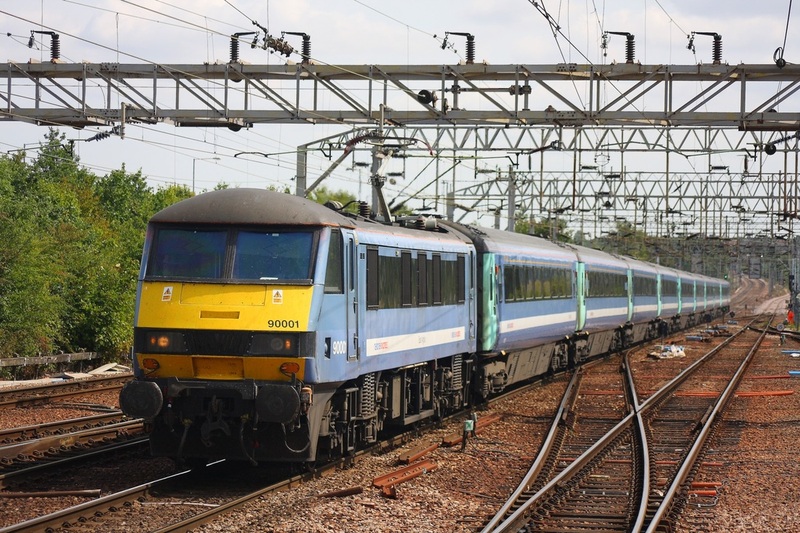 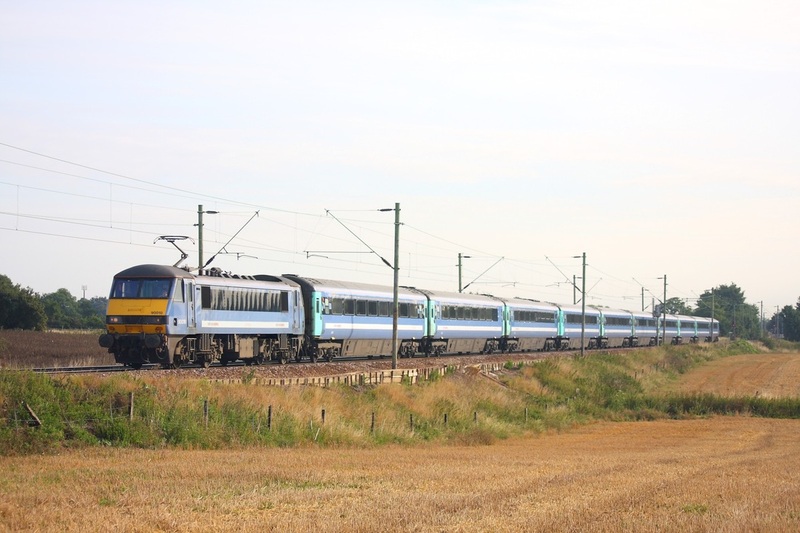 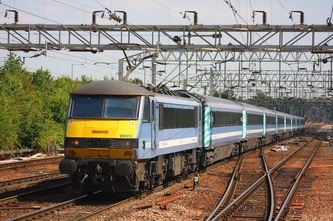 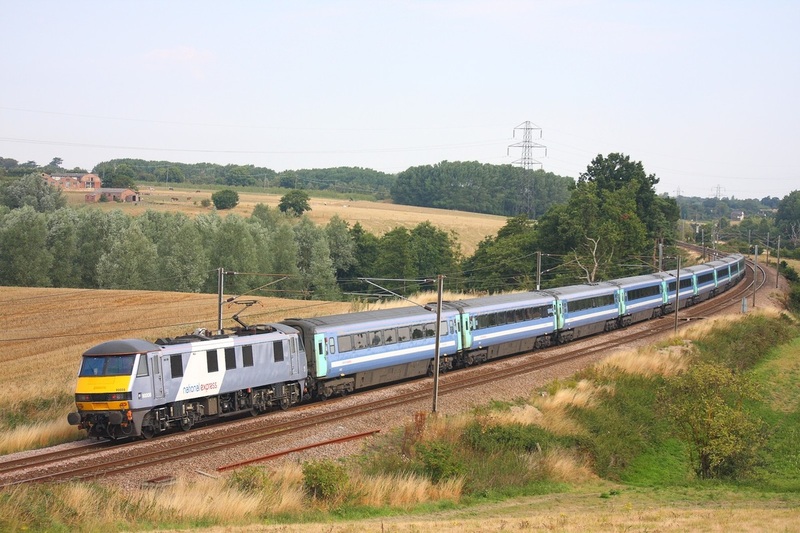 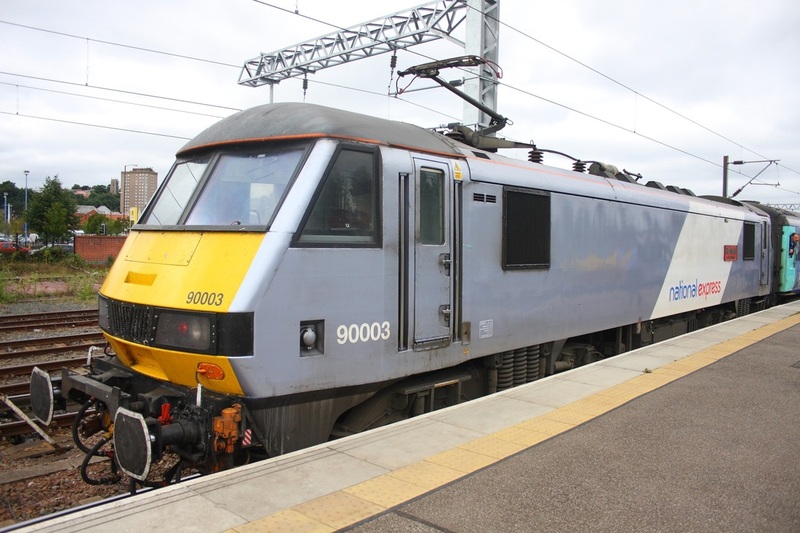 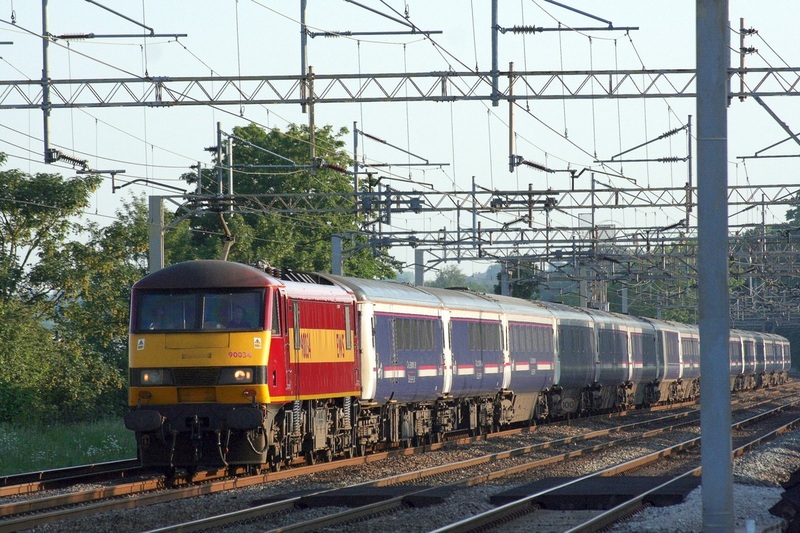 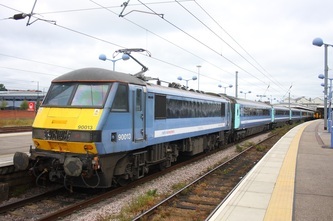 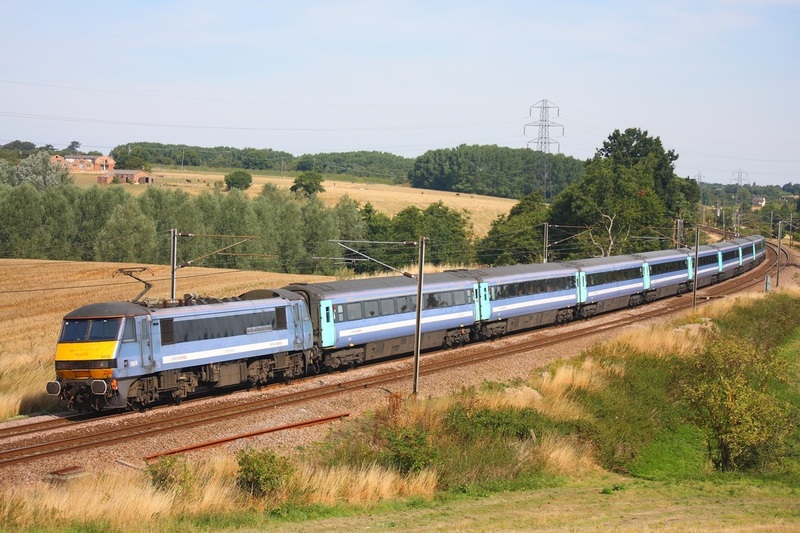 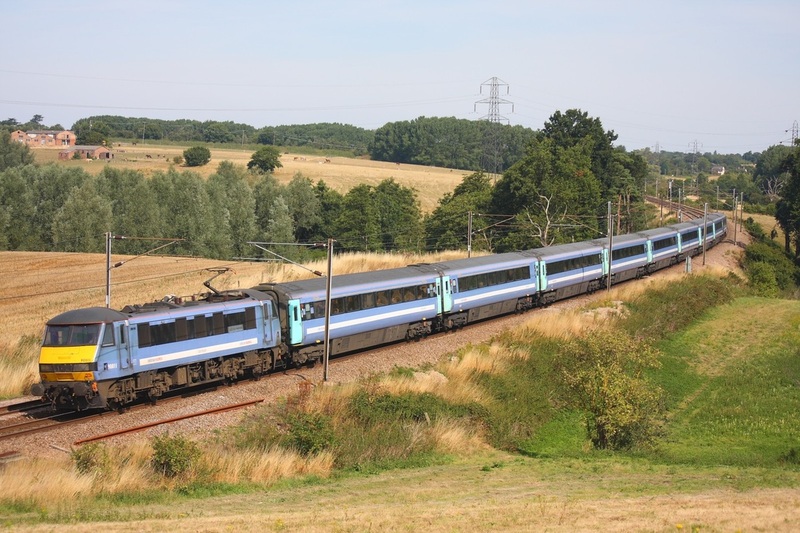 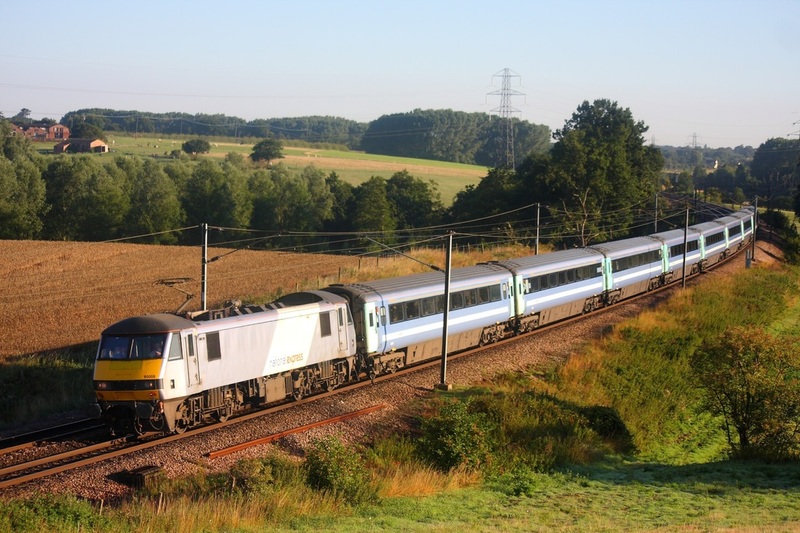 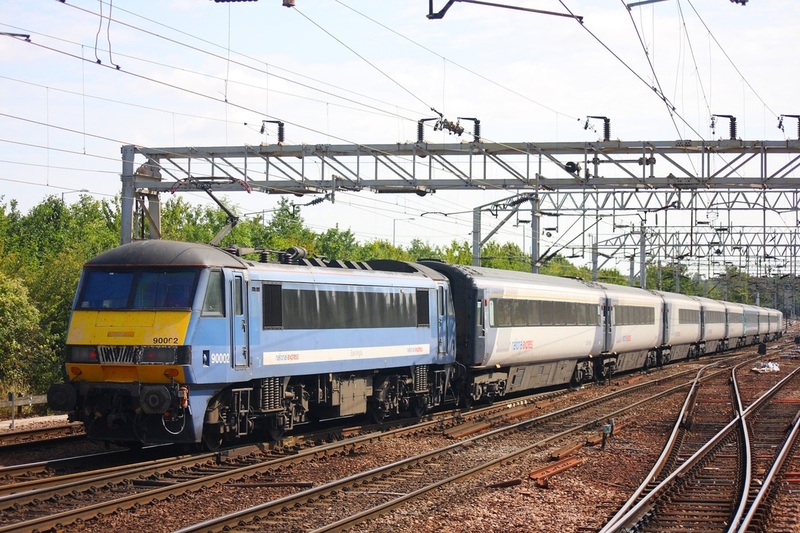 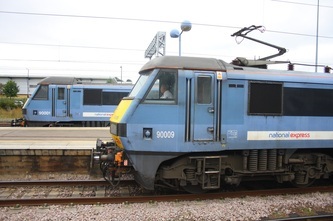 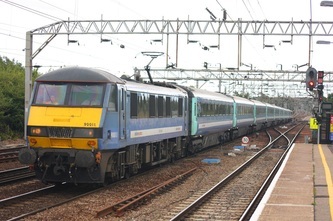 90018 on the 1M16 Inverness to London Euston at Grendon on the 13th May 2015.